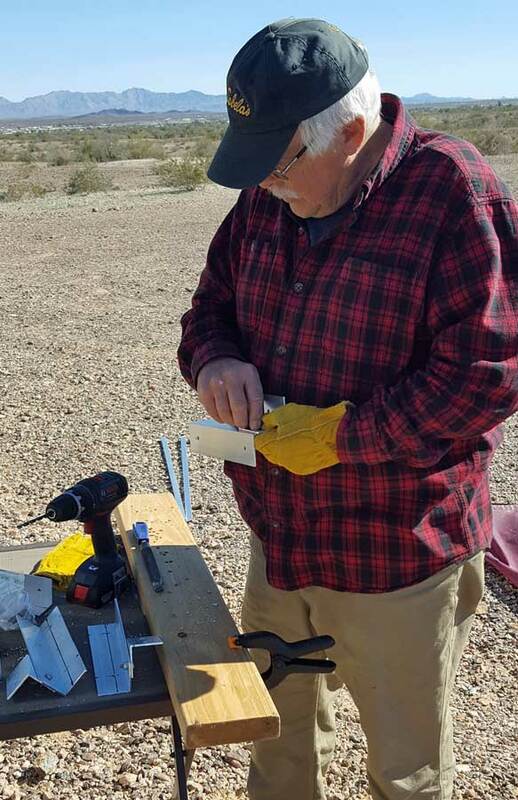 Saturday, March 23, 2019: Several weeks ago I made a reservation at McWilliams Campground just north of Las Vegas knowing we would need an overnight stop on our way north. 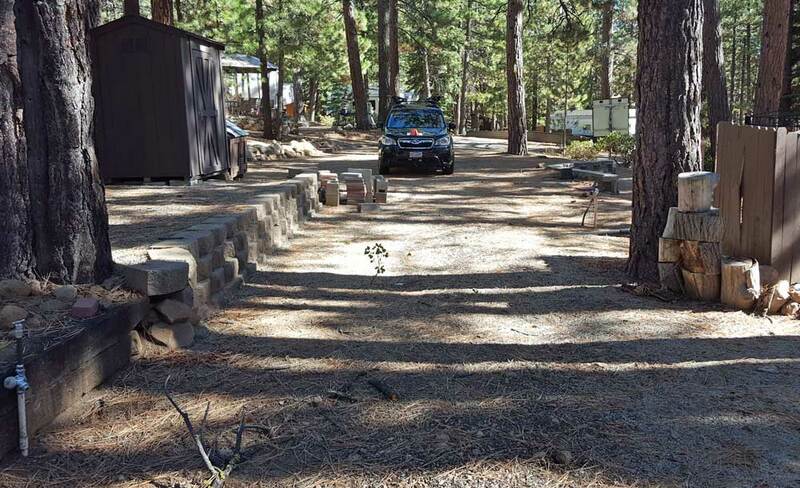 Their photos showed a very nice campground and the spot I reserved was 55 feet long, plenty of space for our rig and car. 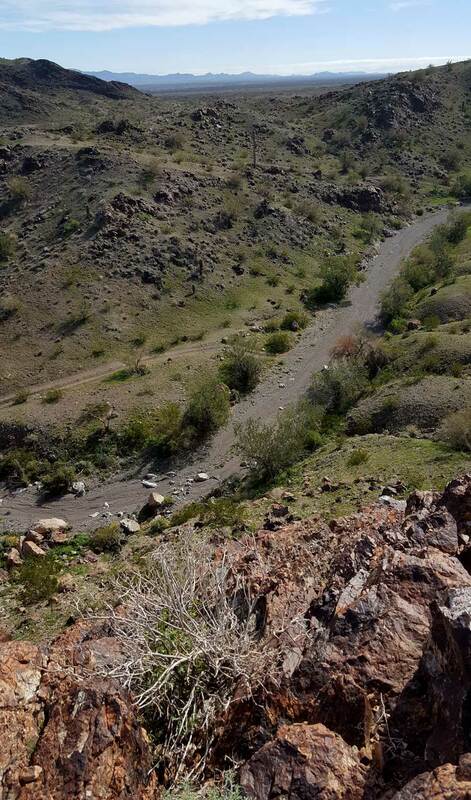 The photo above shows the climb to McWilliams. We started to become concerned when I saw the signs showing McWilliams was only 1 mile from the ski area. Surely they have plowed the campground, otherwise why would they give me a reservation. Apparently there is not usually snow this time of year. Click the photo to see what was waiting for us at the campground. Needless to say, we could not use our reservation so we turned around and continued north. We drove into a thunderstorm as we approached Tonopah and ended up parked in a casino parking area. It rained for a couple of hours. It will be cold tonight (forecast to be 27) but clear tomorrow as we continue north. 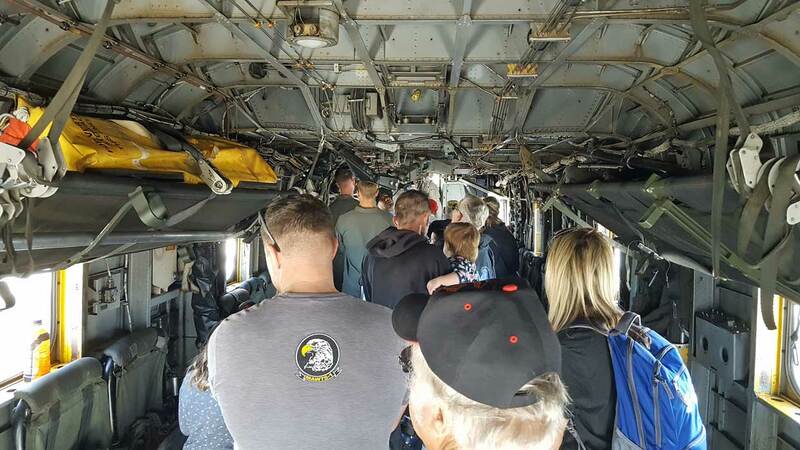 Friday, March 22, 2019: This was a travel day from Tucson (Escapade) to Havasu City, Arizona. We had some challenges along the way with pulling into a small parking lot for breakfast and barely making a U-turn in the parking lot. I had to backup a couple feet with the Forester in tow. We also had a tight U-turn in Bouse to get fresh vegetables at the mobile vegetable guy. We stopped in Parker to get cash at the credit union and someone parked directly in front of us. That required backing up again with the toad. Other than those challenges, everything went well. 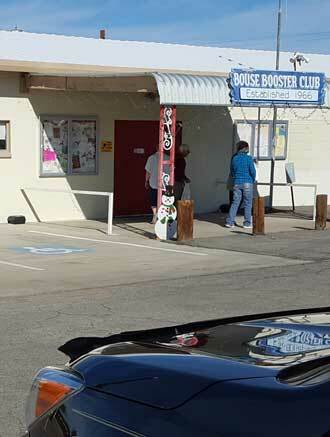 We decided to avoid the dirt and dust so we are boondocked at the Havasu City Elks Club. It is only $10 with no dust. 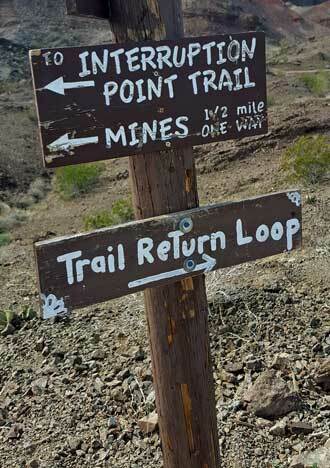 Tomorrow we are headed into the National Forest north of Las Vegas. Thursday, March 21, 2019: The last day of the rally. I started with another seminar, this one was how to deal with emergencies and disasters. An interesting talk. I learned of the Red Cross Alerts APP. We will be driving into the mid-west this summer. An area we have never been and we are concerned about sudden dangerous weather systems. This APP will help to warn us about stuff we don't know about. 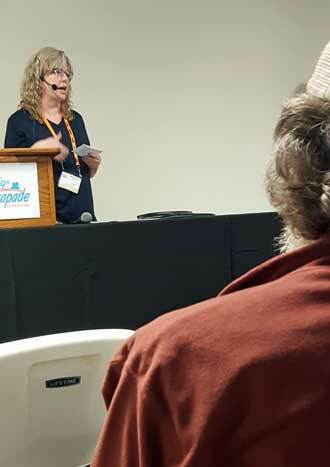 The closing ceremony was this afternoon where they promoted Escapade 60 to happen in Rock Springs, Wyoming in 2020. 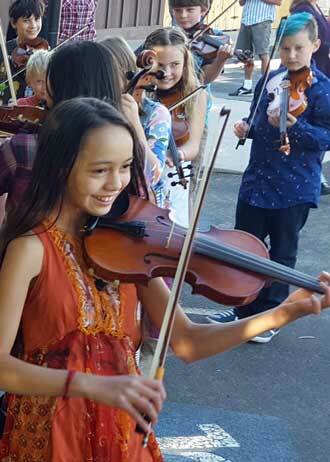 The final activity was the evening Fiesta with live music and food. I came away thinking the seminars were worth the price of the rally. Click the photos for more views. Wednesday, March 20, 2019: I attended another seminar this morning concerning Roadside Assistance. It was very informative and worth the price of the rally. The entertainment tonight was a talent show. This is showing off the talent of those attending the rally. 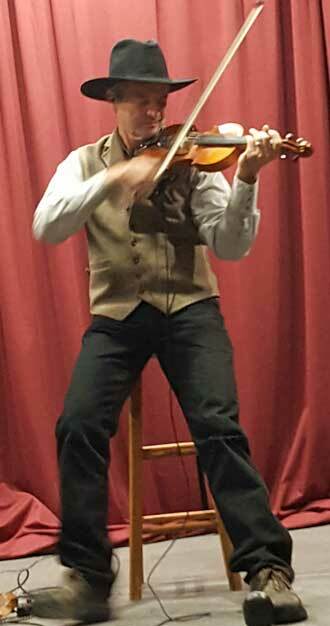 There was a variety of talent and instruments. The audience was very supportive. The kids started off the talent with an RV related tune and dance. Fun. 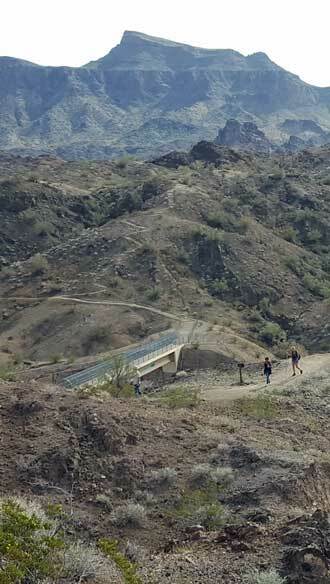 Tuesday, March 19, 2019: One of the attendees to the 59th Escapade in Tucson has photographed the rally using his drone. There are about 1,000 rigs parked here at the Pima Fairgrounds. With an average of two persons per rig, that's 2,000 people attending the rally. This is a big rally but not the largest I have attended. The Escapee administration has done a good job of scheduling valuable training sessions, entertainment, organizing methods of meeting people who have similar interests. We got a central location because we arrived early and because we had volunteered to be ROW representatives. Monday, March 18, 2019: Day two of the Escapade took me to four different seminars while our friends Nate and Cecelia helped Gwen in the booth on the ROW. 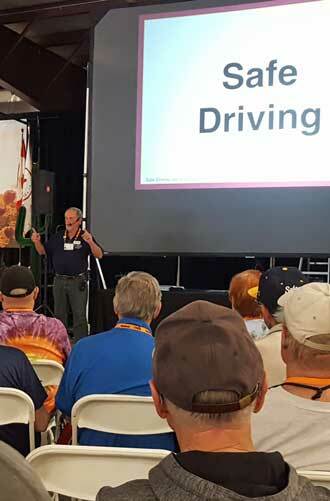 One of the nice things about any RV rally are the information seminars available from experts. I went to four 1 hour seminars. The first was concerning RV insurance and "fulltimers insurance". When you no longer own a home, you lose your "homeowners insurance". That must be replaced with "fulltimers insurance". The second seminar was concerning "extended service contracts" (ESC). This is like insurance for repairs the RV may need. It was very informative. I had an ESC for the Dolphin and used it once. 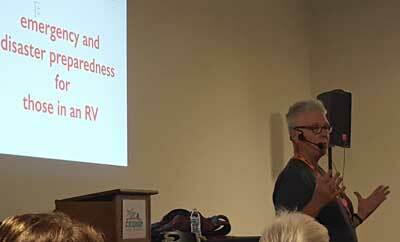 Third seminar was on driving an RV safely. Not much information which I did not already know. However, listening to some of the (silly) questions asked made me afraid to be on the road next to any of these drivers. 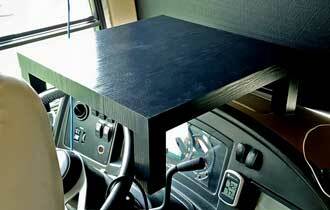 The fourth concerned equipment to make the entertainment center in the RV easier to use. Also very informative and will likely change the equipment I was planning to buy to extend the range of the cell signal I can pick up. This evening we had professional entertainment from the Redhead Express. This was a group of young talented muscians with very lively tunes. Sunday, March 17, 2019: The is the official first day of the 59th Escapade. Gwen and I spoke to many people attending the rally from our booth on the ROW. Click the photo to see our view from the other side of the booth. In the evening, the rally provided entertainment, American Rogues a Canadian Celtic band. 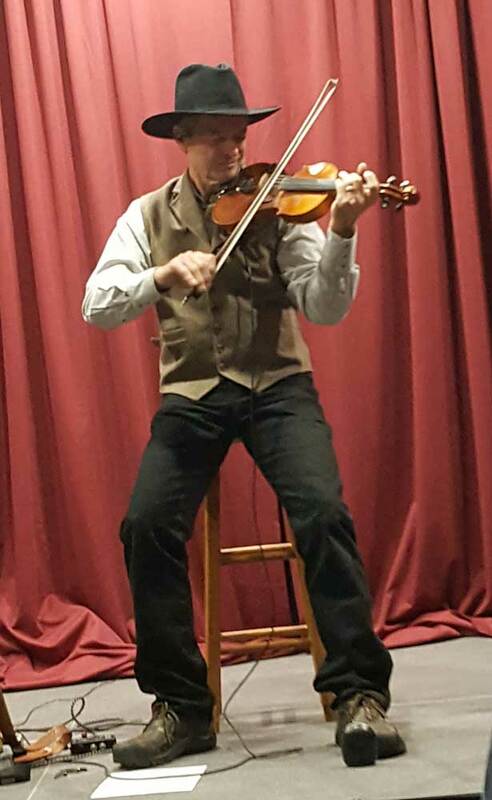 It was a fun group with some talented muscians. Click the photo for a view of the crowd. Saturday, March16, 2019: This was setup day for our booth at the Escapade. We have a lot of Oregon Magazines and maps plus a DVD to give away showing the park. Later in the day we attended a meeting of all the ROW representatives where we received instructions from the chapter director. Click the photo for a panorama of the ROW meeting. 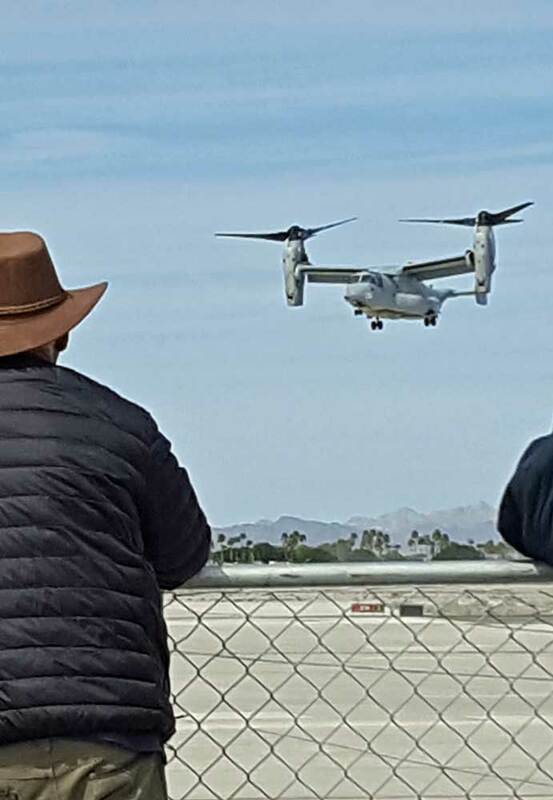 Friday, March 15, 2019: It did not take long to drive from Casa Grande to the east side of Tucson where the Pima County Fairground is host to the 59th Escapade. 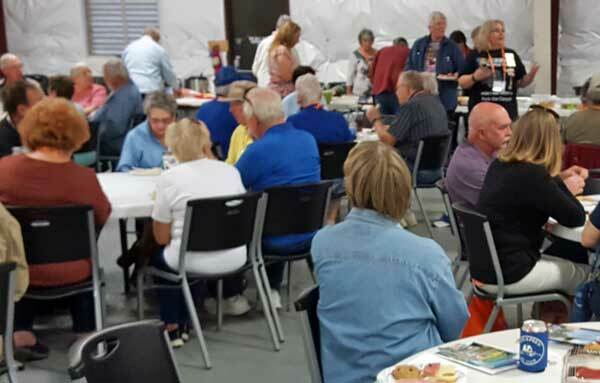 As Escapade is a five day rally of the Escapee RV Club. We are expecting a thousand rigs and there will be plenty to see and do. Gwen and I are on "The Row" representing Chapter 9 and Timber Valley RV Park (the only Escapee park in Oregon). This is NOT our first time to be "row representatives". We did it back in 2007 when the Escapade was in California. We must be in a booth four hours each day. Our parking location is premium, only about 100 yards from the front door of the main events and The Row booth area. Click the photo to see a 270 degree panorama from the roof of Mz Ruby. 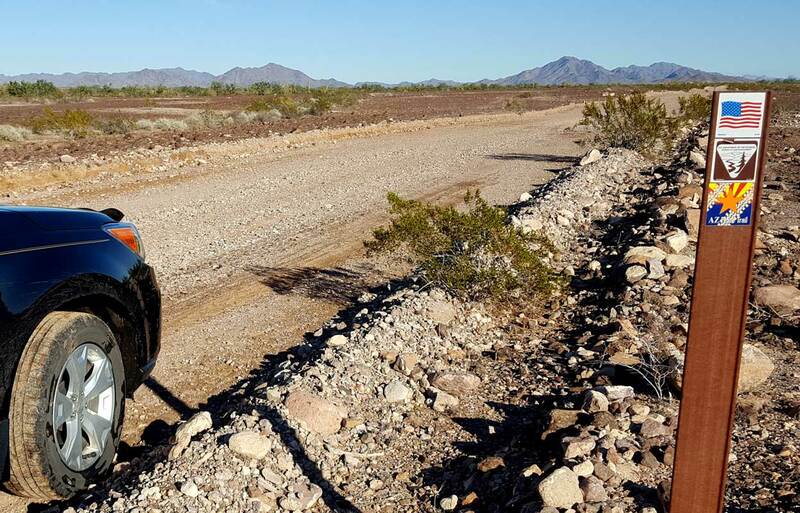 Thursday, March 14, 2019: This is moving day from Yuma to Casa Grande, Arizona. We have stopped at an SKP park and sitting in their boondock area. The SKP parks have an area where you can boondock for $5. 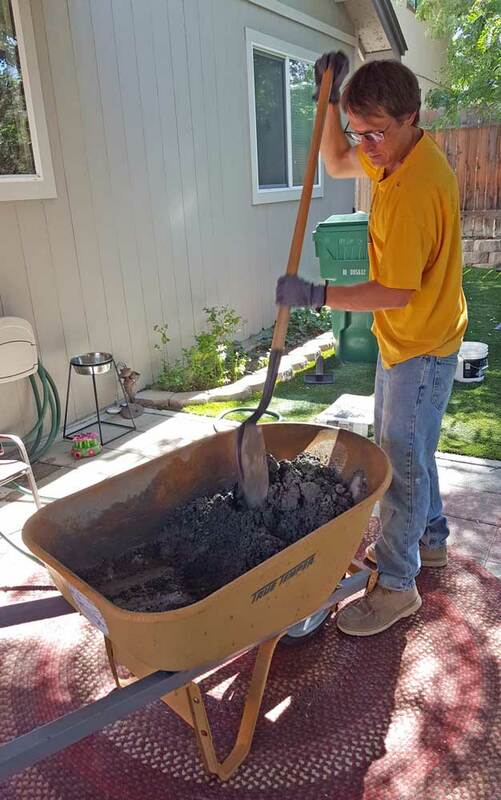 We don't need anything but level ground, no water, power or sewer connections. We took advantage of the boondock area of the Casa Grande park. First we had to wait for office staff to finish lunch to check us in. This was after a couple of "scolding's" from a park resident and the park manager, Tom, because I drove the wrong way on one of the streets in the park. Coming from the freeway I just couldn't make the sharp turn to follow the road directional arrows. I ended up right where Tom wanted me but without following the arrows. We never heard, "Welcome to the park" from Tom or his staff. It's like we ran over the office cat on our way to park in boondock. This is the same park where we spent six weeks back in 2014 and 2015. After parking I did attend the "meet and greet" in the clubhouse where I met the fine people who spend the winter in Casa Grande. We are on our way to the Escapade happening in Tucson tomorrow. Click the photo to see our boondock location. Tuesday, March 12, 2019: I was going to wash Mz Ruby and the Forester as soon as the weather permitted (it rained last night and is threatening today). However, Papi's made me such a good offer I couldn't pass up letting Papi and his helper do the work. They worked fast and finished the job in a bit more than an hour. They washed the roof. I was planning to pressure wash the roof when I return to Sutherlin, I still will. They continued and washed Mz Ruby and then did the car at no charge. Papi's van is parked in front of Mz Ruby. 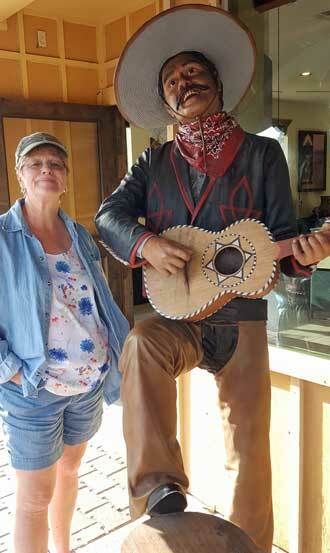 Monday, March 11, 2019: Like last year, we took advantage of three days free at a Yuma resort, Fortuna De Oro. We got a coupon while attending the Quartzsite RV Show. This will give us a chance to clean the car and motorhome and do the laundry before we head to the Escapade in Tucson. This is a huge resort with clubhouse, tennis courts, pools, hot tubs and we get to use it all for free. In addition, it has 50 amps of power so we can heat with electricity (yes, it turned cold and wet today). Click the photo to see a panorama of the street where we are parked. 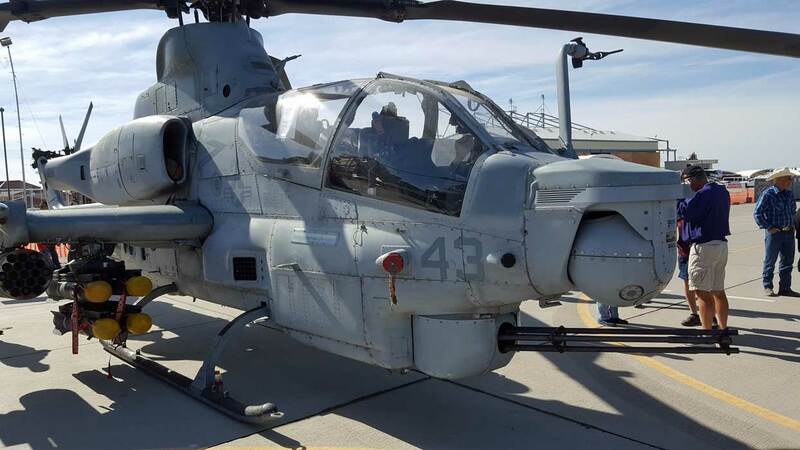 Saturday and Sunday, March 9 & 10, 2019: We were pleased to hear there was an air show at the MAS Yuma (Marine Air Station Yuma). 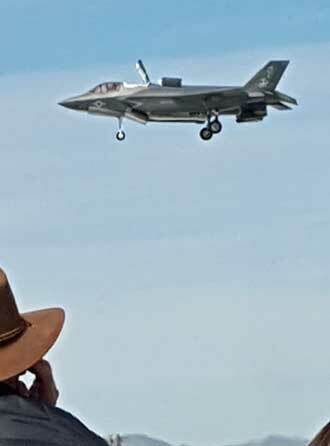 We hear and see the fighters and helicopters all the time when visiting Yuma and with the air show we get to see them up close. 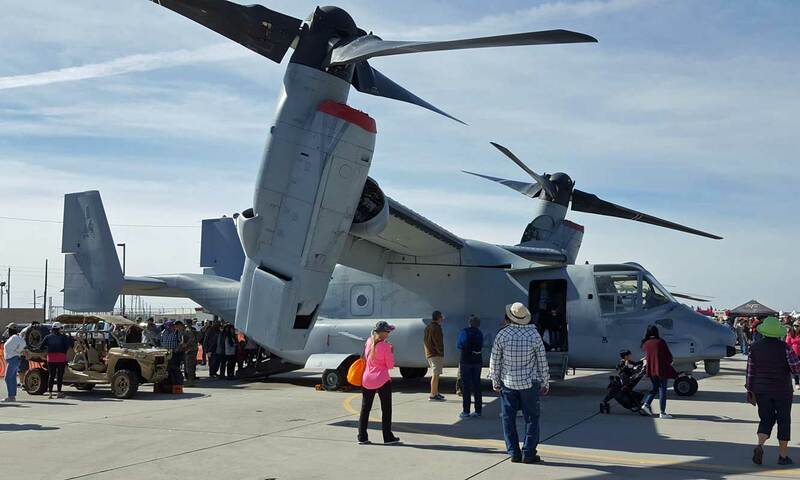 They had a static display, local vendors providing food and each aircraft had two or three of the crew present to answer questions. 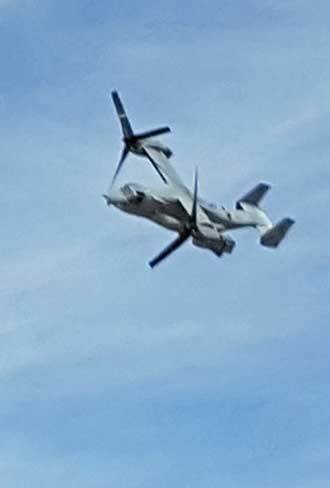 We paid for grandstand seating so the aircraft would fly directly in front of us. Click every photo to see more views. The show was only Saturday but I included Sunday with the photos because I spent the entire day getting prepared to leave the desert tomorrow. 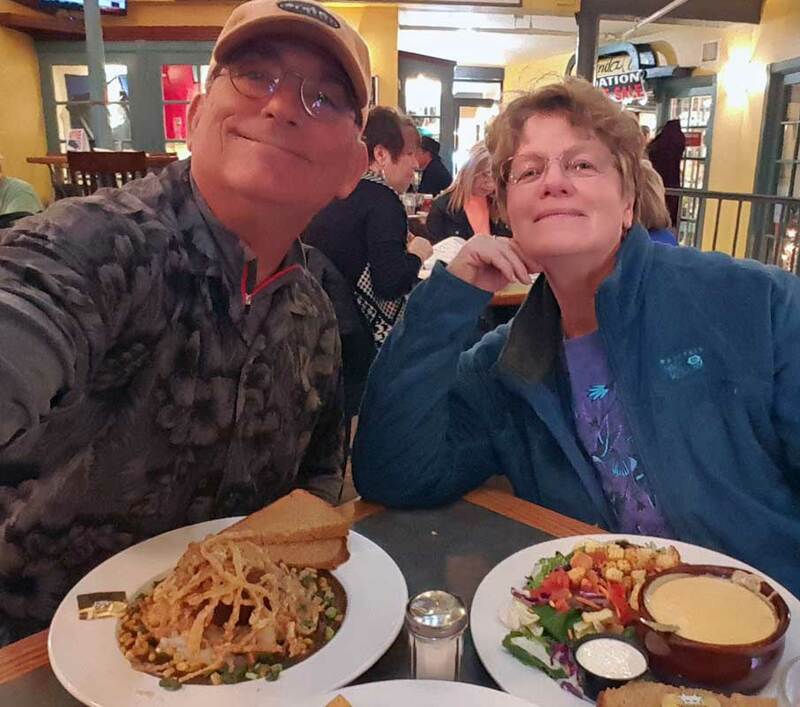 Thursday, March 7, 2019: We drove to Yuma today to learn if we could spend a credit at JC Penney then visit the Arizona Marketplace because Gwen wanted to learn if she could find a t-shirt to match the t-shirt days at the Escapade we are attending in a week. She had no luck but I found some nuts and bolts I can use to expand the solar system (yes, we need more solar panels to get a full charge consistently). After visiting the Marketplace we drove by a salad field. That is a field where a variety of salad greens are grown in a row, cut and bagged in that row then sold as a salad mix. Yes, it's easier to make and bag a salad mix if all the ingredients are grown together. Click the photo to see what I'm talking about. Tuesday, March 5, 2019: Today was the day I chose to do our income tax reports, however, I needed to pick up our mail first. I stepped out of Mz Ruby to the view in the photo. I knew immediately that one of the RV boondockers was on fire. At the moment I first saw it, I knew the RV was already totally involved. These RVs are built with materials which are very flammable. If a fire starts, you have only seconds to evacuate. From this first view, it took first responders about twenty minutes to arrive. 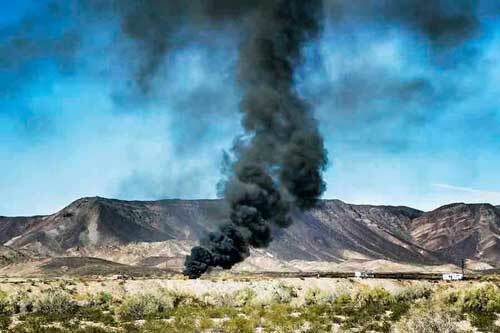 The burning RV was located on BLM land south of the LTVA where we are parked. That means it is a great distance from fire stations. Of course the RV was totaled within the first five minutes after the fire began so the need for a fire engine was to be sure the fire did not spread and to attend to anyone who might have been injured. 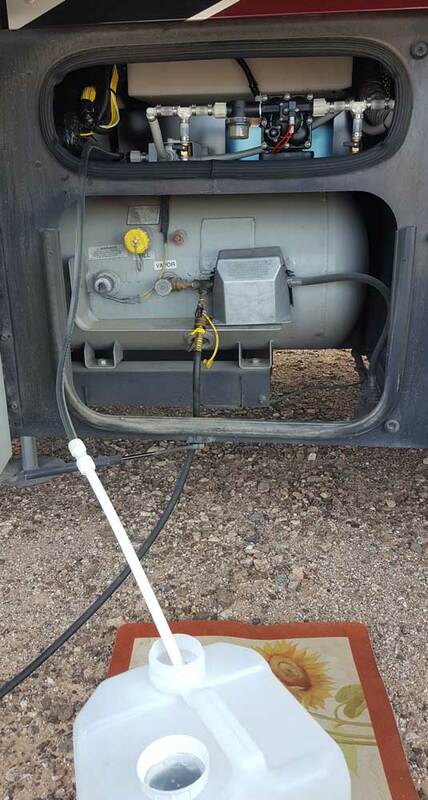 Another concern is the propane tank located on every RV. Only ten seconds before the first fire truck arrived, we heard the propane tank explosion. It was very loud and we are two miles from the incident. We haven't visited the site but know it will be only a few pieces of the steel frame. We don't know how it started or if anyone was injured. It is a warm day so I suspect it wasn't a heater starting this fire. It was likely an RV refrigerator which unless updated with safety features is very dangerous and can easily start a fire. Click the photo to enlarge. We have a residential refrigerator so no longer have a fire concern. 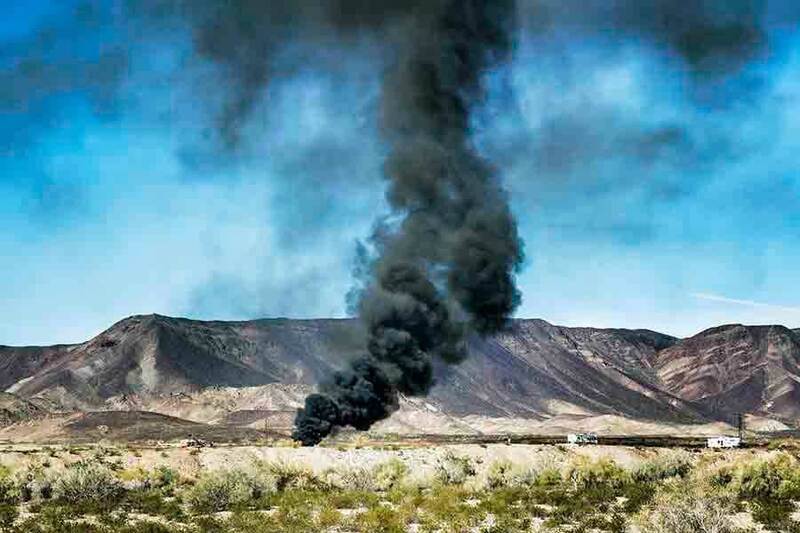 March 6 update: Here is a photo of what is left of the RV. Monday, March 4, 2019: Gwen and I took a drive north to Ferguson Lake about a thirty minute drive. 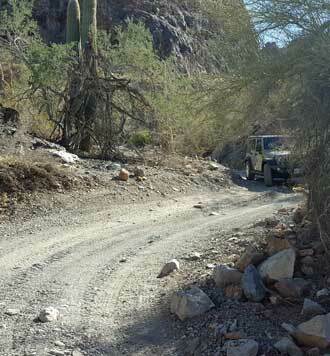 It is a very rough county maintained gravel road. 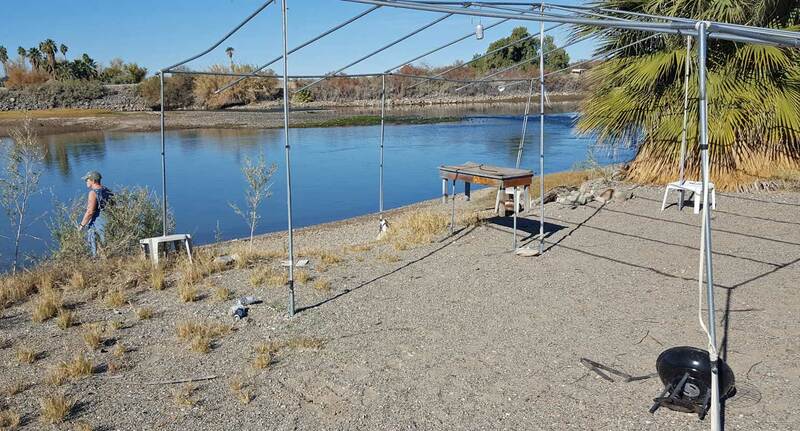 At the end of the road is the Imperial Valley Fishing and Hunting Lodge, "Members Only". This looks like a good place to go kayaking although the access to the lake is difficult. 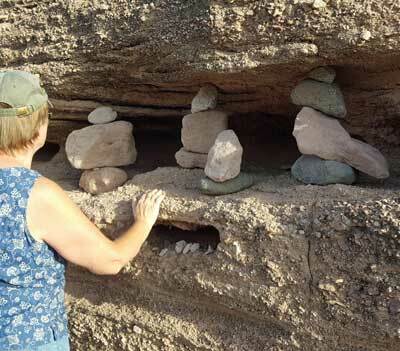 We also took a short hike down a side canyon and found some rocks stacked artistically in the eroded walls of the canyon. Click all photos for another view. 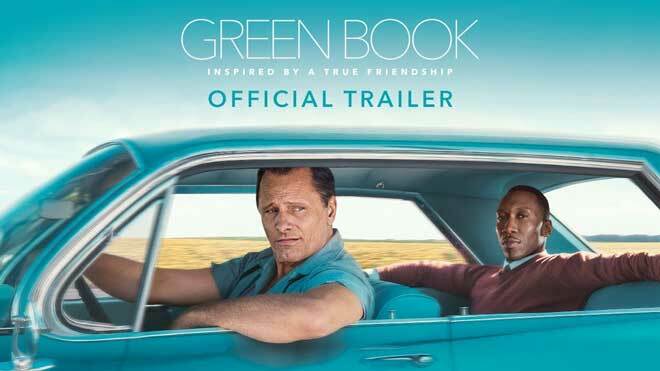 Sunday, March 3, 2019: Yes, we went to another movie today, totally different from the "Green Book". This movie was a combination thriller and comedy. That sounds strange and it will sound even more strange knowing about thirty bad guys get killed in this movie. If you have ever lived in a cold climate or visited the rocky mountains in Alberta Canada, you will enjoy this movie. The movie setting is Denver but the credits say the entire movie was filmed in Alberta. We have visited this part of Alberta and recognized some of the mountains. 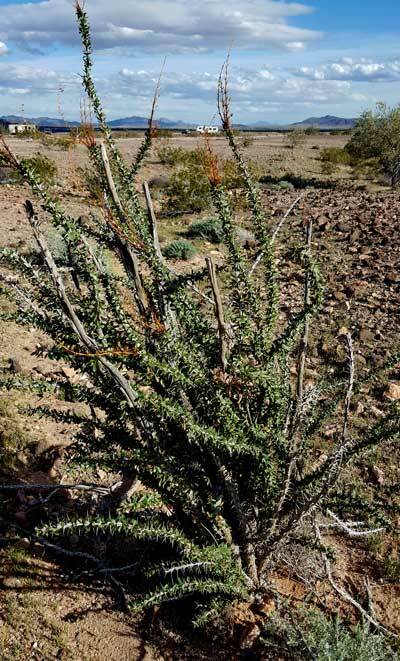 Saturday, March 2, 2019: The Ocotillo is one of our favorite desert plants. The one at left is a small one. They usually grow to be as much as twenty feet tall. They have red flowers at the tip. 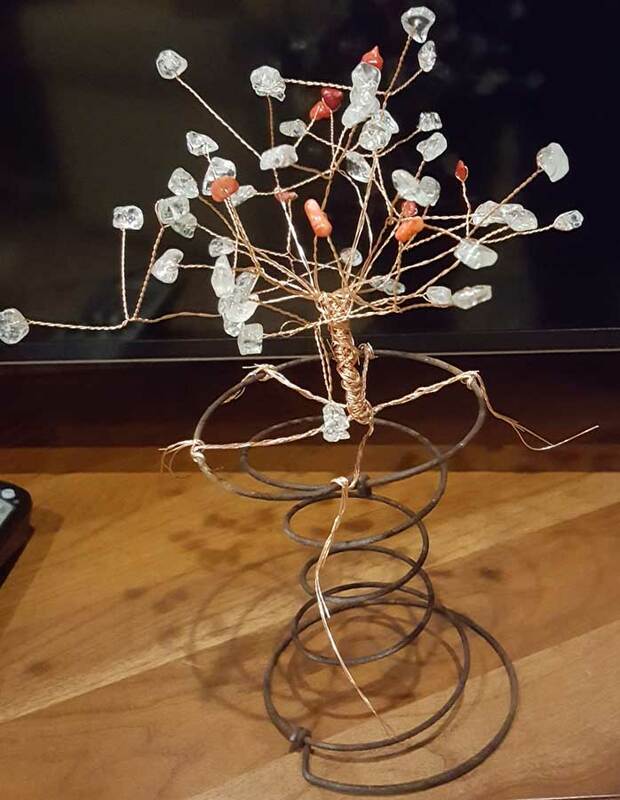 Gwen has done a great job of creating a copper Ocotillo. 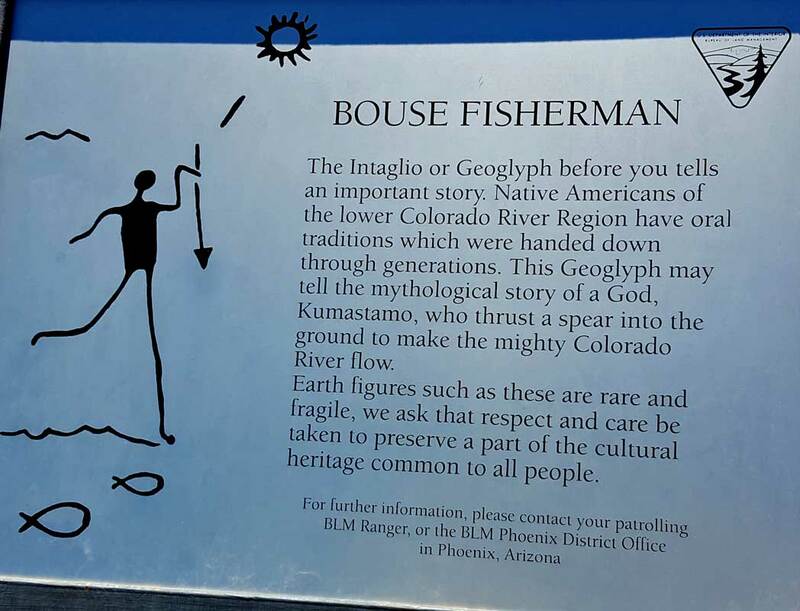 If you have ever visited the Arizona desert you will recognize it immediately but if you haven't been to the desert, someone would have to be told what it represents. 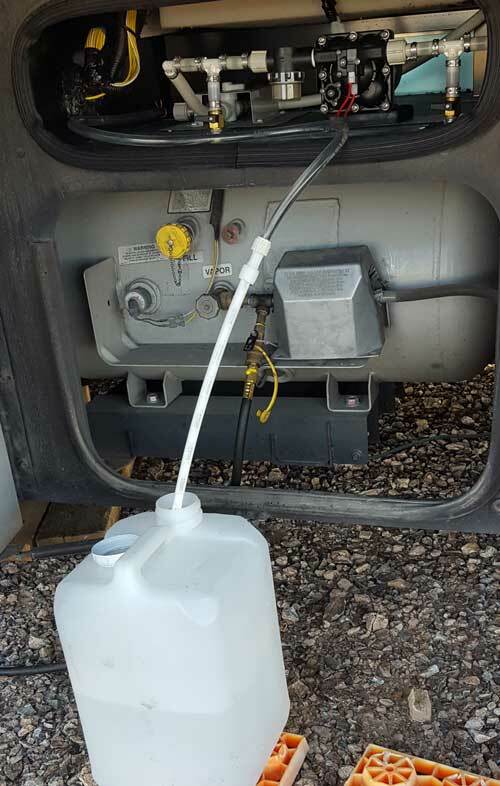 Friday, March 1, 2019: Ok, we are back in the desert which means I must get our water then pump it into our holding tank. 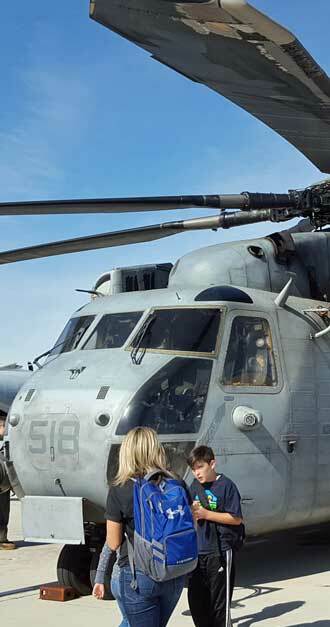 Fortunately the LTVA has fresh water only about a mile from our location. I picked up 18 gallons of water and transported it back to Mz Ruby. Click the photo for a view of pumping the water into Mz Ruby. We did have the time to take a hike toward the mountains. I turned around and took a panorama of the area where we are parked. Thursday, February 28, 2019: Gwen and I took ourselves to the best picture of 2018. Of course we have not seen all those nominated for "best picture" but we agree with this choice. It was entertaining from the first moment it began. It was well acted and completely drew in the audience. Thank goodness there was little violence. I was drawn to both characters and cheering for both as they changed during the course of the movie. 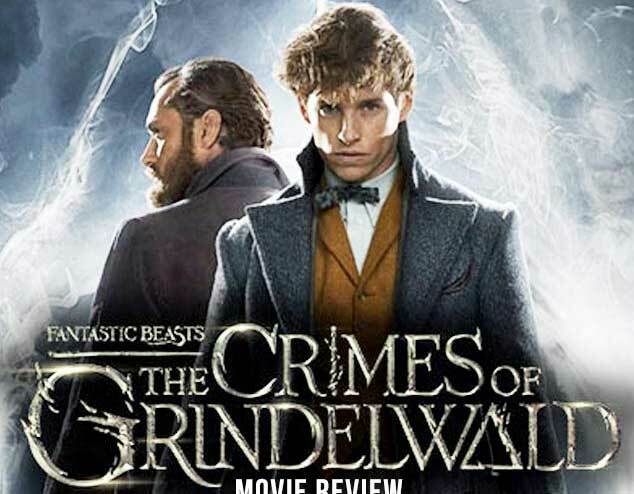 There were a few surprises which made the movie and characters even more interesting. Tuesday, February 26, 2019: One of the things I'm always saying is, "the weather gets bad (too hot or too cold) so you move to better weather, that's why the home has wheels." Gwen has had enough of the cold weather so we have moved to Senator Wash located about 20 miles north of Yuma, Arizona, the warmest place in the southwest. Senator Wash is an LTVA (Long Term Visitor Area) managed by the BLM. This is the premier LTVA in my opinion because of it's organization. 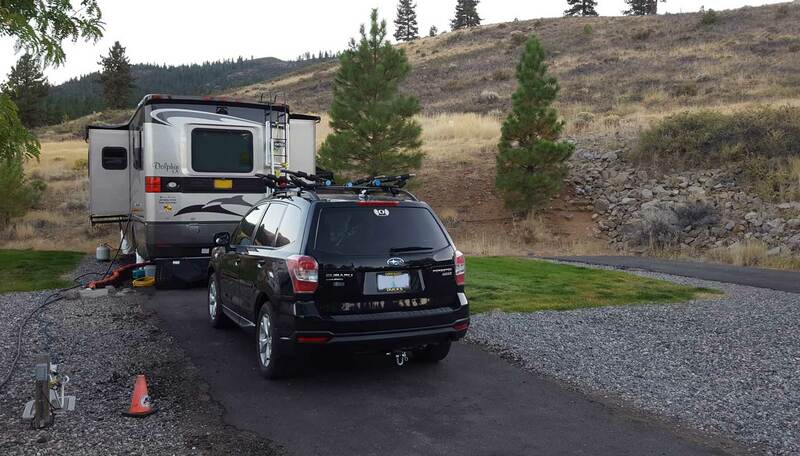 I previously wrote about long term boondocking and what was needed to make easier. A good, close source of fresh water, place to dispose of garbage and sewer. It is also nice to have shopping close by too. Like Bouse, Senator Wash has all the above. The BLM has set up a central location for all three only a mile from our location. This LTVA also has a well organized group of campers who return every year. They publish a newsletter, organize events and even have an onsite lending library. They also have a unique method of communication every evening. At 7pm each night, a CB (citizens band radio) is used to make "roll call". Everyone with a CB checks the reception of their radio by calling with their "handle". It is a method of radio check and after roll call, announcements are made concerning the events of the week. Someone monitors the CB 24 hours so in case of an emergency members will lead first responders to the 911 location. Note that the solar panels are raised only partially, the sun is higher in the sky than it was in Bouse. In another 3 - 4 weeks and there would be no need to raise the panels. Click the photo to view a panorama of where we are parked. 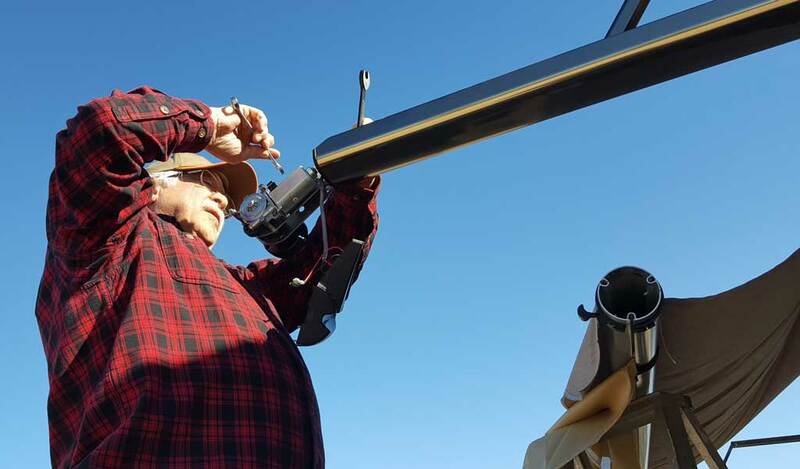 I always recommend Senator Wash as the location to learn how to boondock and as the location to get solar equipment and/or have it installed. 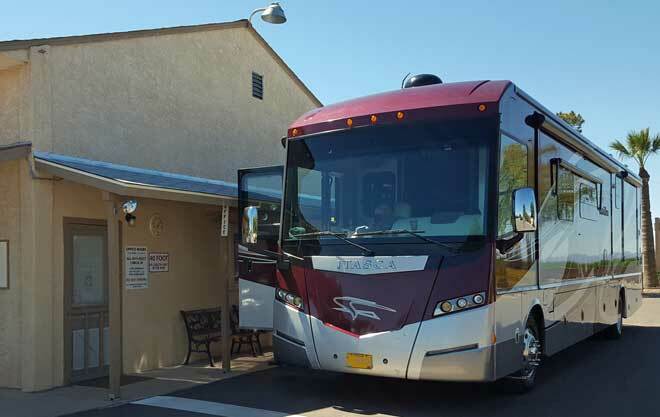 Monday, February 25, 2019: This was a travel day from Willcox, Arizona to Senator Wash LTVA north of Yuma, Arizona. 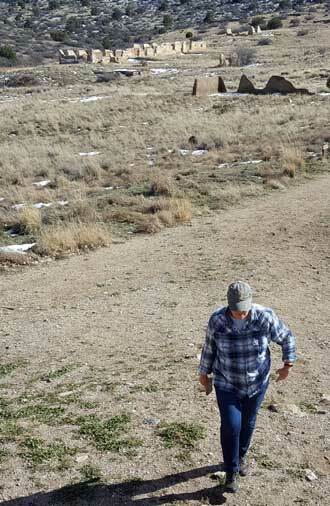 But I want to report on our trip to the Ruins of Fort Bowie, established to defeat the Chiricahua Apaches. 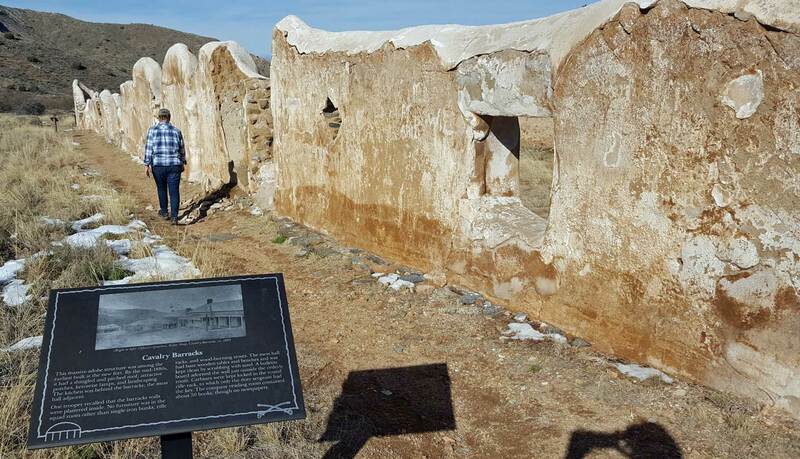 Fort Bowie was created to guard Apache Spring and Apache Pass. 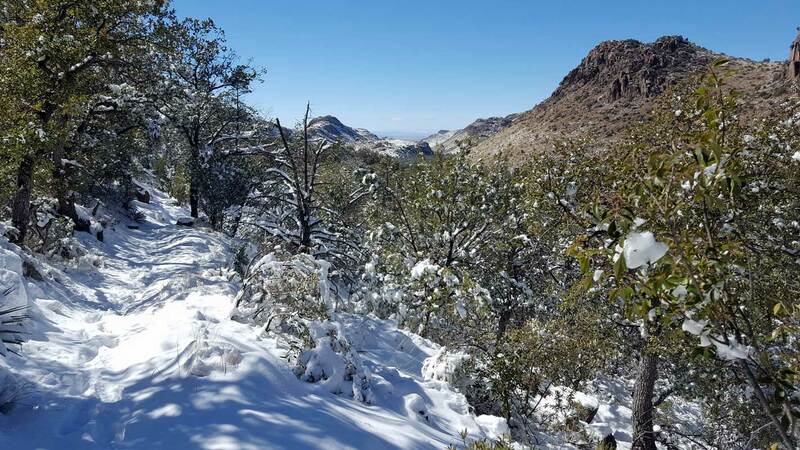 The army was attempting to control Cochise and Geronimo by limiting access to all the water sources in the area. 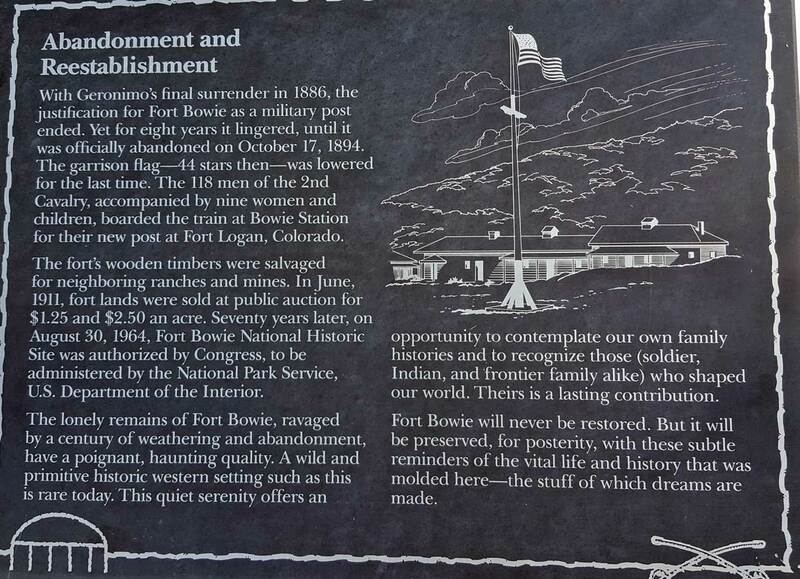 Fort Bowie was established during the Civil War. Geronimo surrendered in 1886 which ended the sole purpose but Fort Bowie remained in operation for another 8 years. 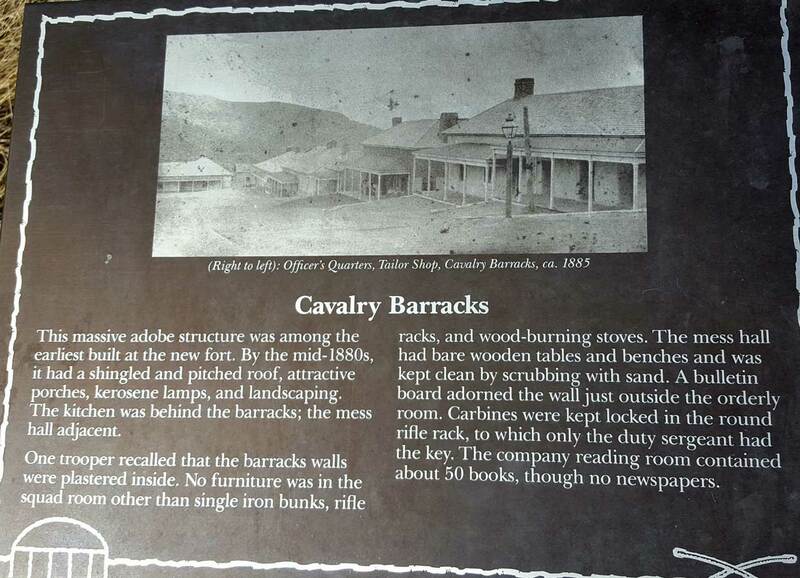 The calvary barracks is the largest building ruins. Click all the photos for more views. 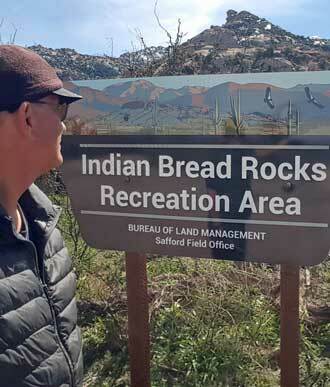 Sunday, February 24, 2019: About noon, Gwen and I took a drive 23 miles east to Bowie, Arizona then south to the Indian Bread Rocks Recreation Area. 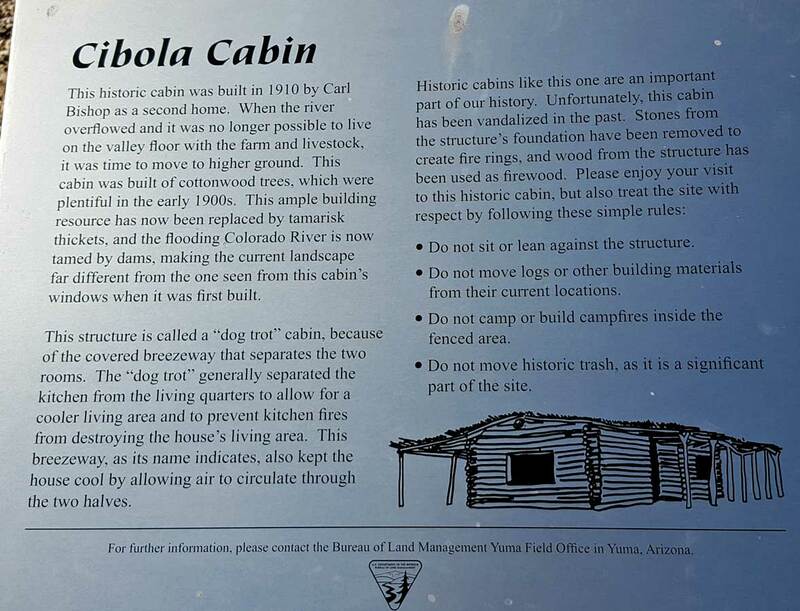 I read about this area on a boondock camping Facebook page so we were anxious to check it out. I didn't really see easy spots for us to boondock and the nearest water was about ten miles. I wanted to see the wild horses that where reported to be in the area, but, no horses. We DID see lots of free range cattle and many were next to the people camping in the area. The area reminds us of the Alabama Hills in California. This is an area controlled by the Apache Indians before 1870. Click the photos for more views. Saturday, February 23, 2019: Gwen and I drive to the Chiricahua National Monument hoping to get to the top of the mountain view points of the incredible rock formations. Unfortunately, due to the recent snow storm, the top of the mountain was closed. 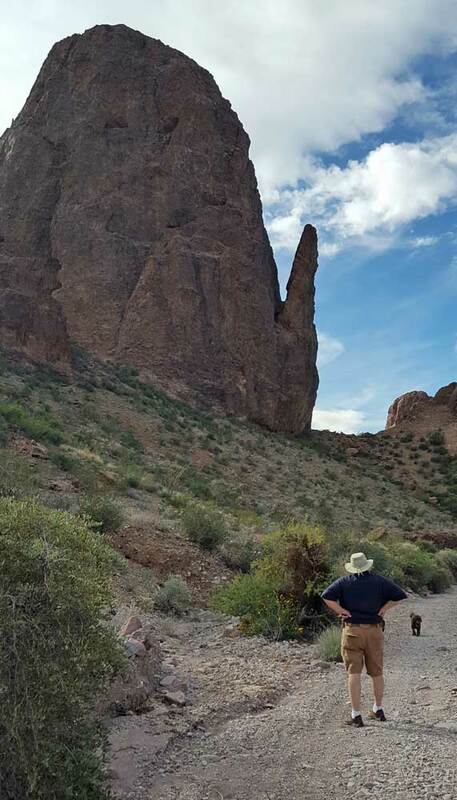 We were able to hike the trail from the visitor center however into the nearby canyon to get a peak of the rock formations. This is not our first time here. Take a look back at 2007 photos and you can get an idea of what it is like at the top of the mountain. We were sad to miss the great views at the top but realize the views we saw today only happen rarely in this area. Click all the photos for more views. 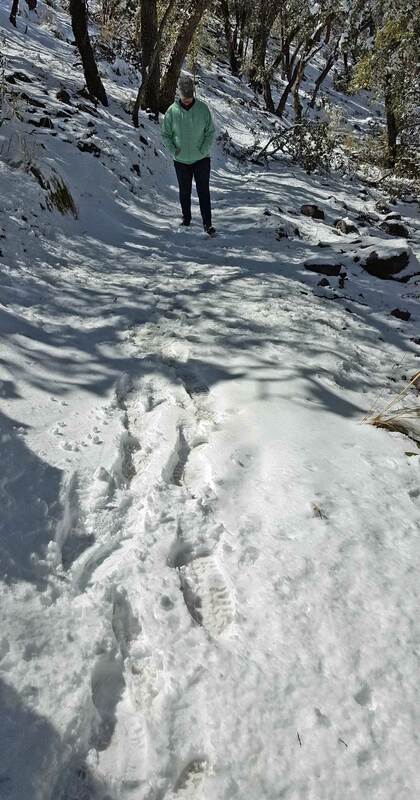 As we hiked to a higher elevation the depth of the snow increased. The deepest was 8" when we stopped the climb and turned back. We did not have the right hiking gear with us for these elements. Friday, February 22, 2019: Gwen and I try a local barbeque restaurant inside an old passenger train car just before attending the Dave Munsick concert. 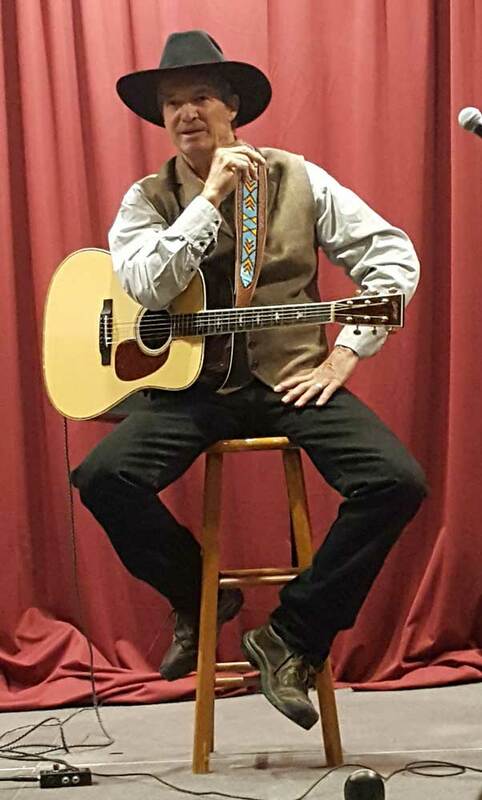 Dave is a cowboy story teller and song writer from Wyoming. 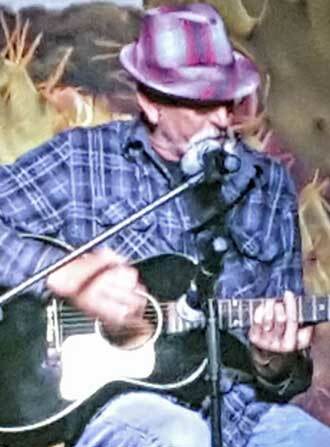 He sang about a dozen tunes but told the story of each tune before playing that tune. 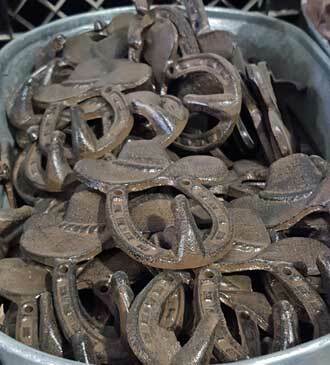 Some of the stories were very involved and educational for those of us who have not been "cowboys". If you have seen the show, "Longmire", many of Dave's stories reminded me of the plot and dialog of the Longmire stories. 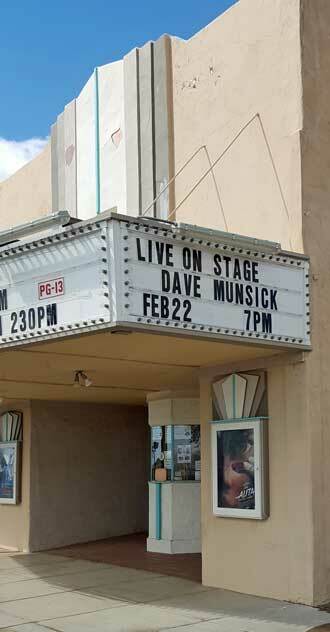 Dave's stories and tunes were about two hours long but he left us wanting to hear more. I made a short video which include parts of two of his tunes. Just listening to Dave's music is only half the entertainment. The tunes tell a story in only 3 - 4 minutes while his stories are 10 - 15 minutes and put life into the tunes. 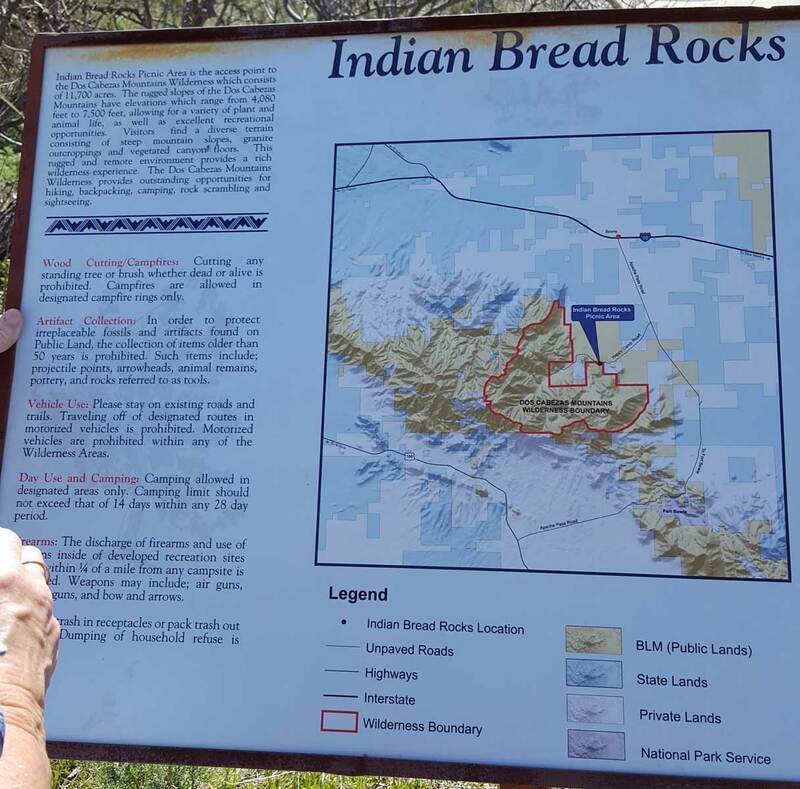 Thursday, February 21, 2019: We drove north of Willcox into the rural part of Cochise and Graham Counties. We found a surprising amount of agriculture for this dry area. We found lots of irrigation so there must be water underground. The buildings above were for tomato growers. Behind that photo is a huge new orchard, I assume for apple trees since they call this apple valley. 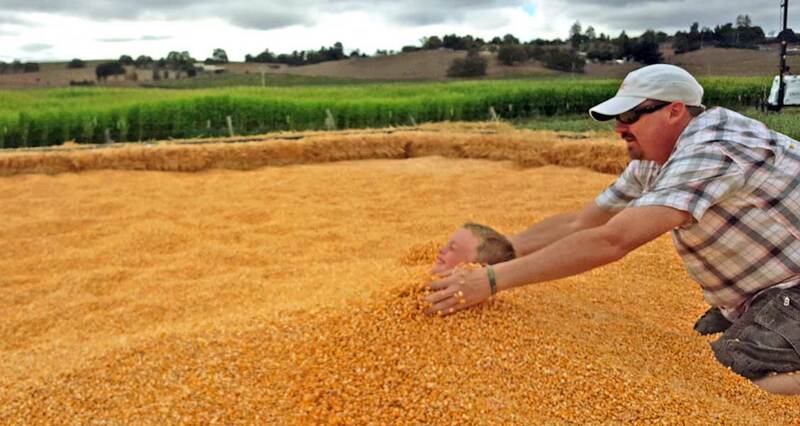 Lots of grain grown here too. 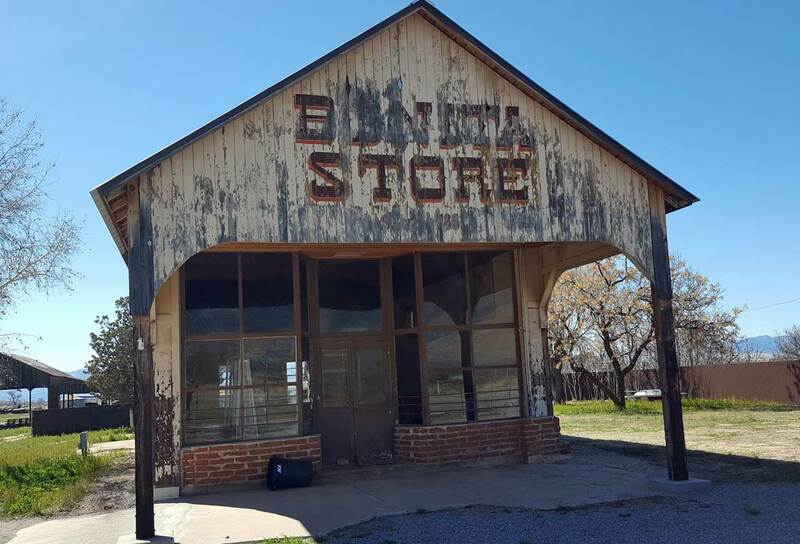 We drove as far as Bonita hoping to find another small village but only found an abandoned store and the Bonita Elementary School which must bus the kids from a long distance. Our Elks club parking is about 200 yards from a very busy railroad track (2 tracks). 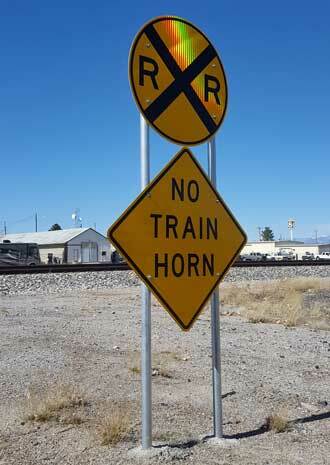 Fortunately Willcox has made a deal with the railroad to NOT use their horns at the crossings. Click all photos for more views. Wednesday, February 20, 2019: By reading a boondocker's Facebook page I learned of BoondockersWelcome. It is a location on the Internet where you can learn of private property where owners invite boondockers to park for free. They are boondock hosts who happen to also be boondockers themselves. When visiting the Website I learned there are many private property locations listed all along the summer route we are planning. So I joined with a reasonable $30 fee. I wanted to try it out before our summer tour begins so I requested a spot at "Nolan's Acres" in southeast Arizona. What is nice about this kind of parking, it is private property, not next to a freeway or railroad track. 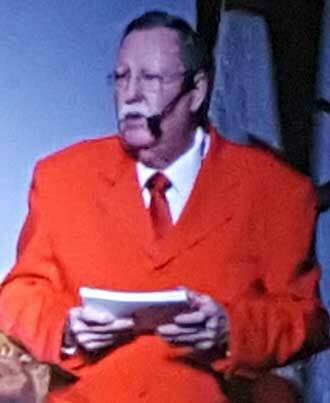 Our host is someone who knows the area so it is easy to ask for directions to all the sites we should not miss. Our first BoondockersWelcome was a success. We hope to find all the special, rural locations to park this summer. Monday, February 18, 2019: In June, 2013 the Yarnell Hill Fire began from a lighting strike. 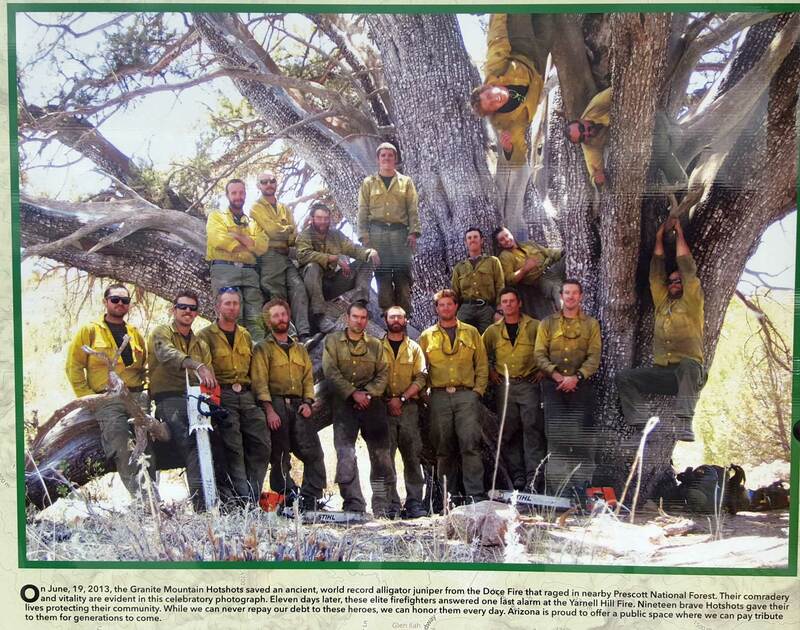 The Granite Mountain Hotshots from nearby Prescott, Arizona were called out to fight the fire. 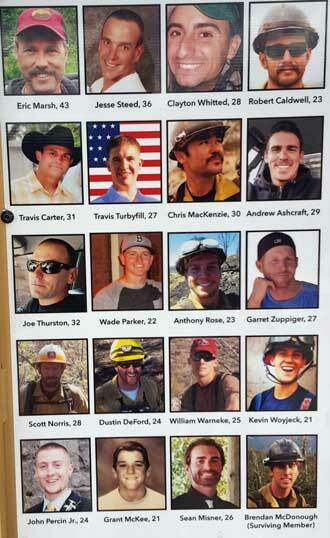 Nineteen of the twenty hotshots were overrun by the fire on June 30 and killed. 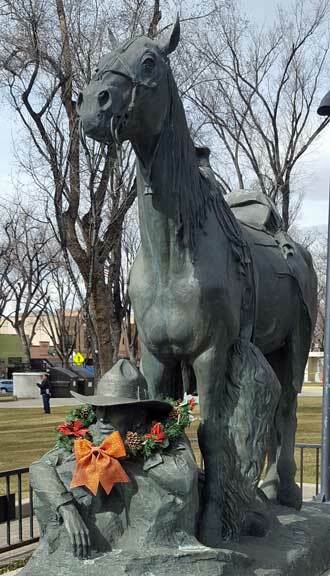 We visited the Granite Mountain Hotshots Memorial State Park today. 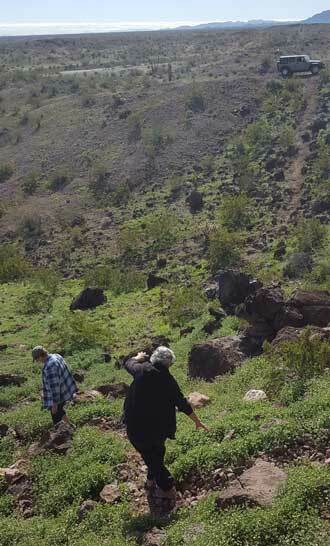 It consists of a parking area and a 2.85 mile trail climbing the Weaver Mountains to a location above the Fatality Site. A short trail from that point leads to the fatality site. 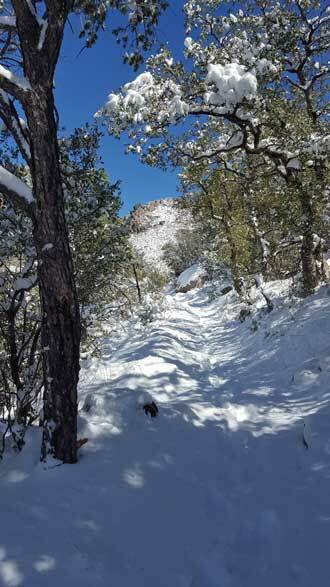 Gwen and I hiked much of the trail in the cold weather today. 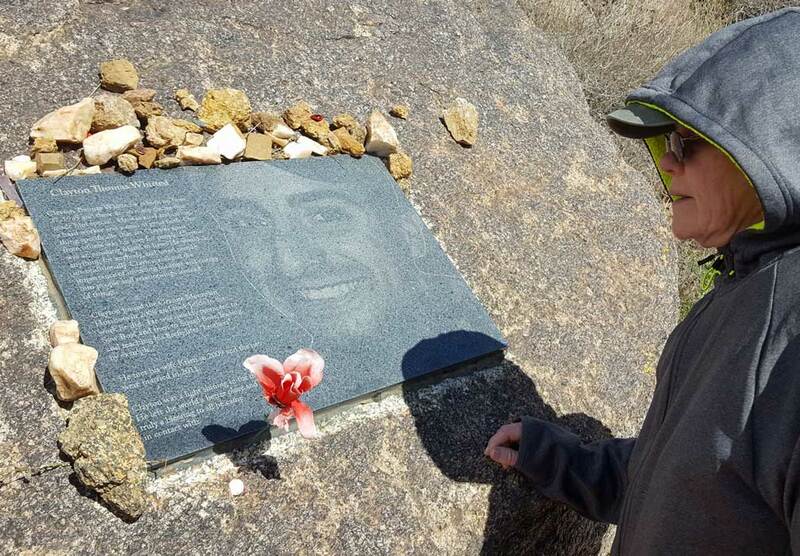 Nineteen plaques are scattered along the 2.85 miles describing each of the firefighters lost in the wild fire. The park is really well done and the trail is well made with gently climbing. We did not go prepared for a long hike. I highly recommend bringing trekking poles, water and a lunch for this hike. Today would have required some cold weather gear too. Click on every photo to see another view. Sunday, February 17, 2019: Back to Wickenberg today to do more exploring and for a good lunch at Cowboy's Cook'n. This time we found some gifts for ourselves. 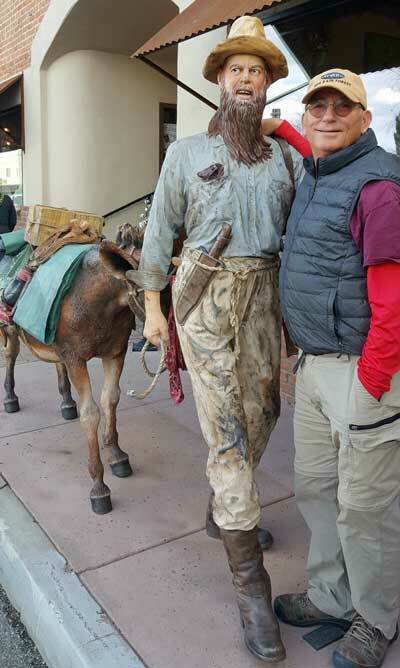 I met this prospector downtown but he wouldn't disclose where his mine was located. Yes, it was cold today. The forecast actually calls for snow overnight in Congress. Now why did we come to Arizona. 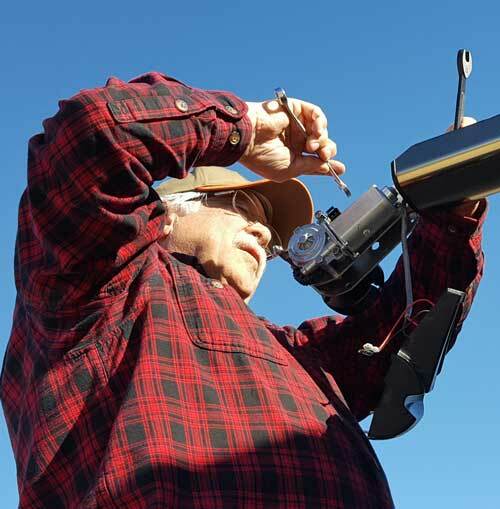 Still looking for warm weather and a solar sky. One more day in Congress and we are leaving for southeastern Arizona. Saturday, February 16, 2019: I had two projects to do today. Both with Mz Ruby. First, I noticed on the drive to Congress, several of the Mz Ruby tires had lower pressure than they should have. Once I arrived in Congress I tried the on-board air compressor to add air to the tires but it was too slow. Today, we drove Mz Ruby to the other end of the park where there was a huge air compressor. All tires are now up to pressure and I plan to watch the pressure to learn if these tires are losing pressure. The second project is to change the line containing the 30 amp fuse between the solar charge controller and the batteries. Gary had two of his fuse holders melt on his solar installation so I decided to be proactive and change mine before it melts. 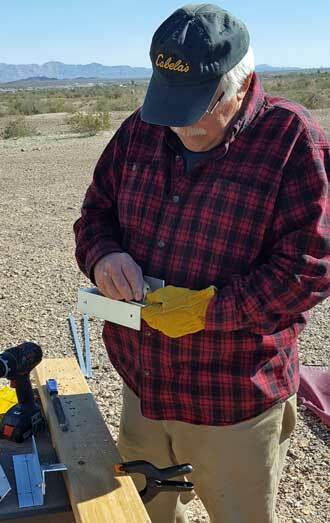 I purchased a line containing a 50 amp fuse and the solar shop in Quartzsite says, "This one won't melt!". So I waited until dusk. I didn't want any charge on the line coming from the panels. It didn't take long to switch one line for the other, it is ready for the new batteries on Tuesday. Now for the horse and cowboy to the right. 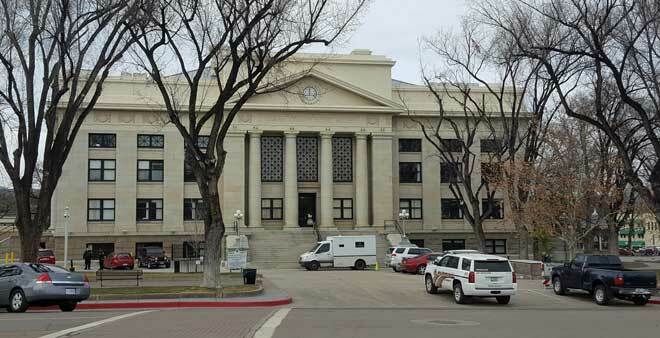 It was in the courtyard at the Prescott Courthouse. I thought it was nice. Must be important ...! Thursday, February 14, 2019: This has been a wet Valentines Day. 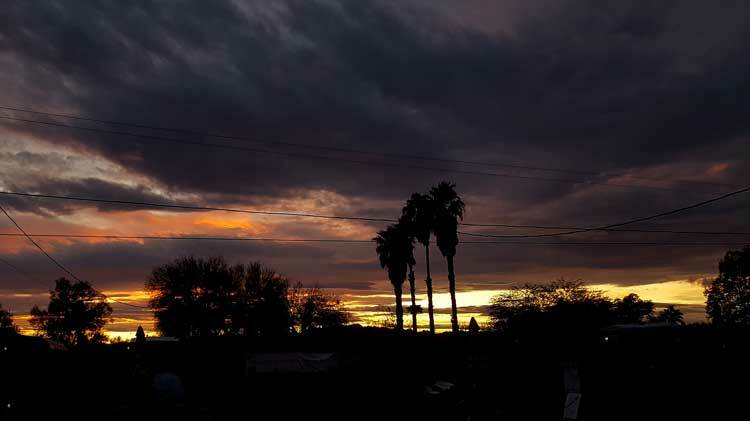 It has been raining all day, unusual for almost any part of Arizona. Everyone in the park seems to be hunkered down in their RVs. I took a drive to a nearby auto parts store looking for an odd size light bulb. When exiting the store I noticed the garbage can. I believe the story is, do buy anything until your really need it. I Arizona, you may never need windshield wipers except to wash the dust from the windshield. 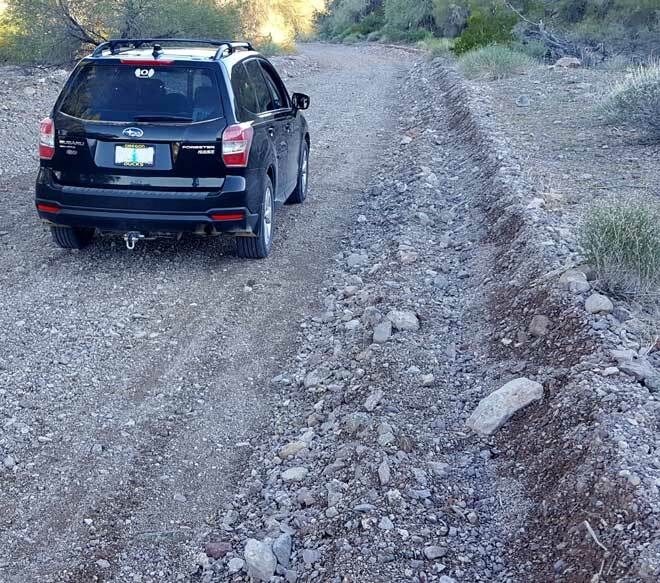 Wednesday, February 13, 2019: We travel to Prescott on a road from the west marked with a sign, "No truck longer than 40 feet". 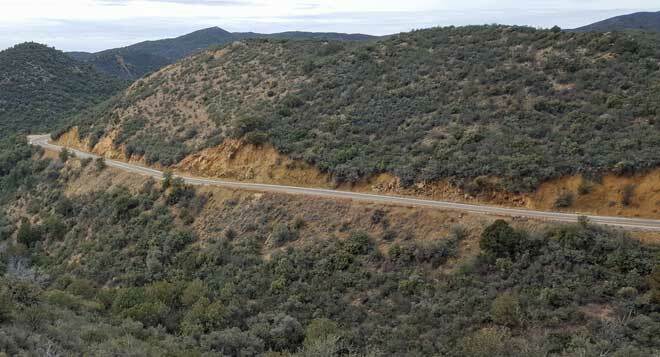 The hairpin turns are so narrow and sharp, a longer truck (or motorhome) would not survive the road. We started at the Courthouse Plaza with shops surrounding the plaza. The courthouse looked busy today. We did not see many tourists but figure the season for this town is during the summer since it is a mile high. We actually saw snow on the ground during our drive to the city. Prescott is an artsy city. We chose to have lunch at the popular Prescott Brewery. Gwen chose the Jalapeño Beer Cheese soup while I had meatloaf. 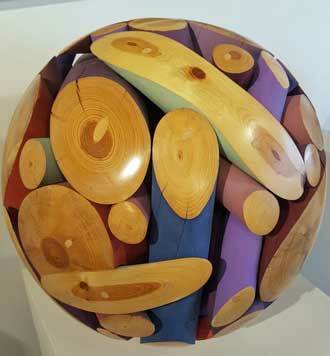 The wooden ball in the photo is about 16" diameter with a price tag of $5,000. 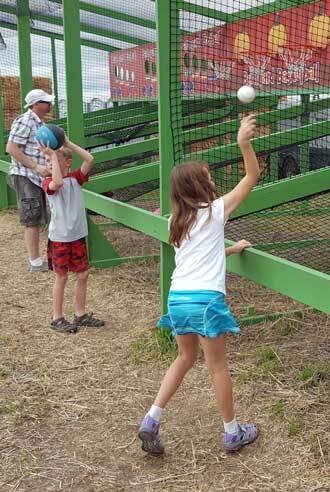 Behind the ball is a rectangular block standing 4 feet tall with a price tag of $8,000. 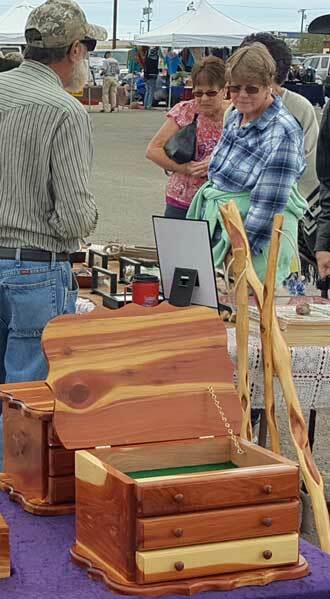 I took those photos to share with Gary and Jeanne because they are woodworking craftsmen. 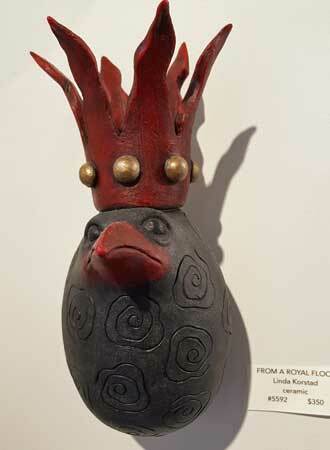 We enjoyed our time because we like looking at crafts as art and we found a few items to bring back to Mz Ruby. Click each photo to see the hidden photo behind. 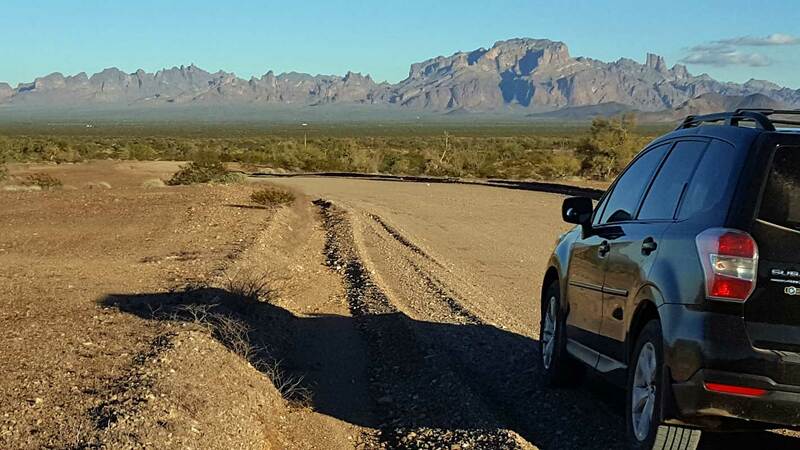 Tuesday, February 12, 2019: We made a morning trip from Bouse to Congress, Arizona, about 100 miles through the back roads. We are staying a week at the Escapee park. We have been here once before, twelve years ago. The park has not changed much and we are parked very near the same location. It is on gravel with other RVs very close. It reminds me of our time in Ehrenberg, a coat of dust every time a car drives by, plus a yappy dog someplace behind us. It is making us miss our quiet desert location already. Click the photo to see our space. We plan to visit Prescott tomorrow. 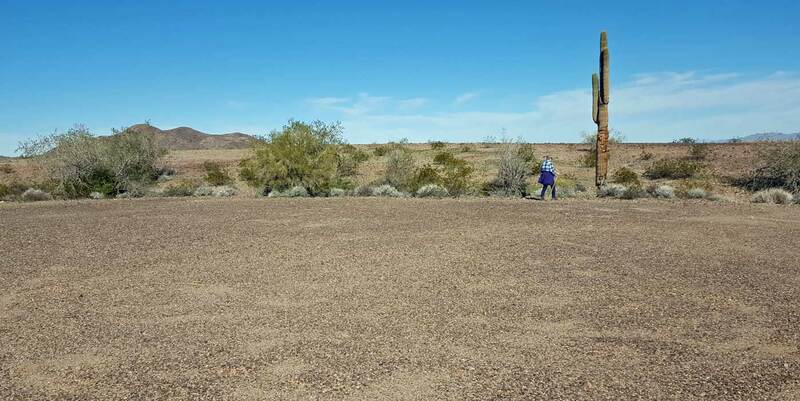 Monday, February 11, 2019: Today is our last day in the Bouse desert. We are moving on tomorrow to explore more of Arizona. Congress, Arizona will be our next destination for a week so we can visit Prescott (rhymes with biscuit). We spent the day getting ready to move early in the morning. We do know how to manage our black water holding tank. We arrived on January 14 and are leaving on February 12, that is 29 days without dumping the black water. We will dump tomorrow just down the road at the county park. The pencil drawing of Mz Ruby was done using a new APP on my phone. 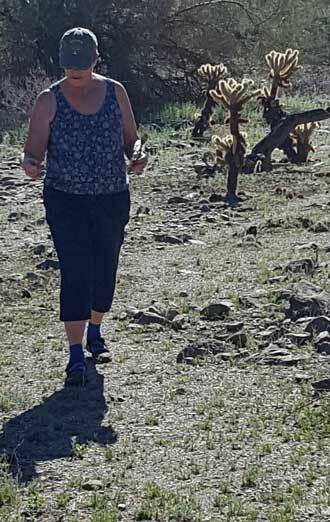 Saturday, February 9, 2019: Jeanne and I continue to look for ways to use the springs we found in our craft project. 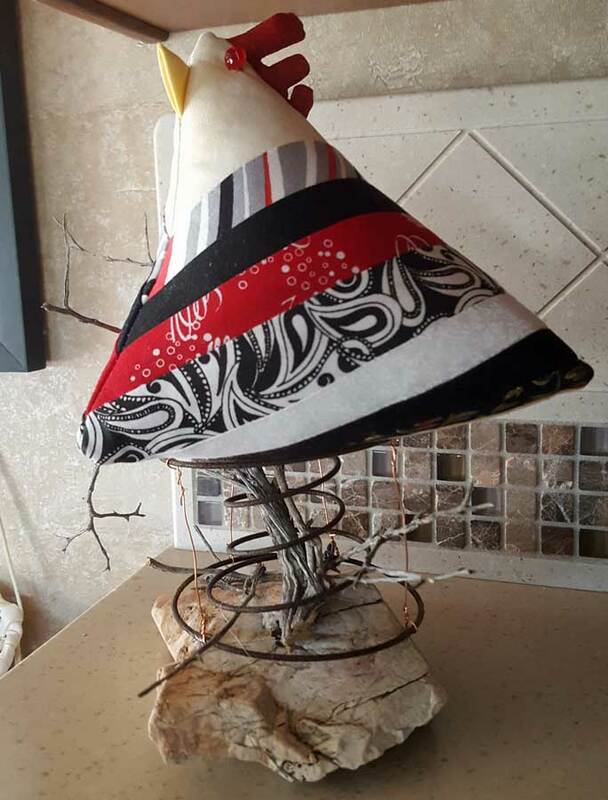 I purchased the chicken at the left at the Quartzsite craft show the sat her on top of the spring with branches underneath. Click to see her inside. 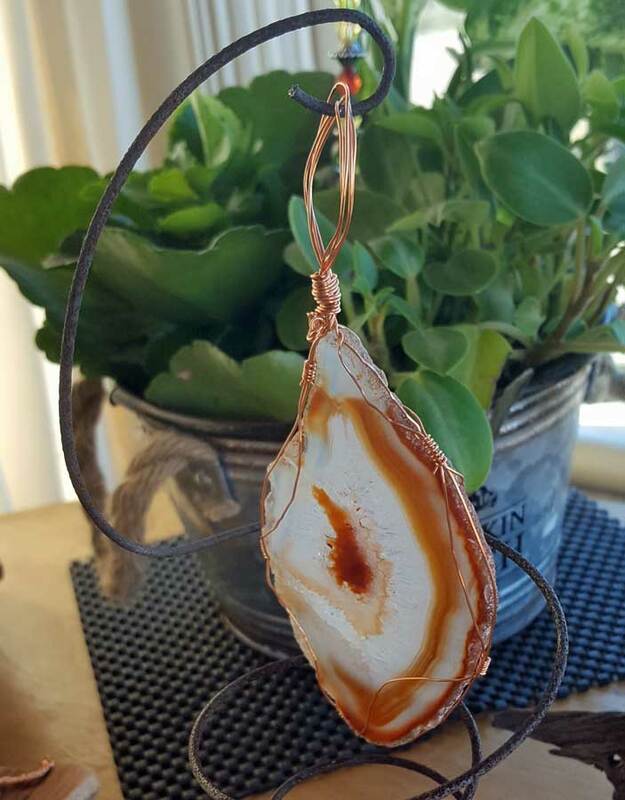 Jeanie reshaped the spring a bit and did a wire wrap on the stone she purchased. Now the stone is bobbing on the spring. Click the stone for a closer view. Maybe my grandkids will have some more ideas. 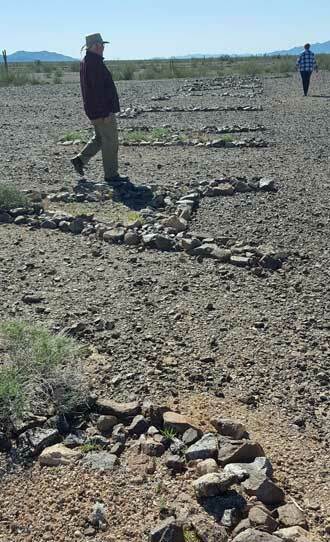 Friday, February 8, 2019: Back to the desert again in search of "Quartzsite" in rocks and the "North Arrow". 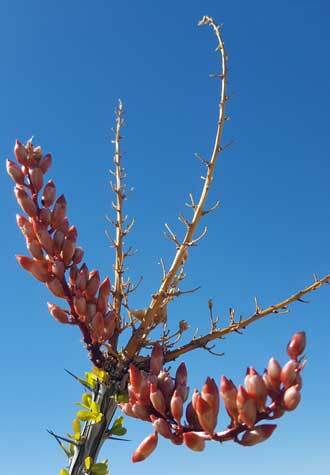 First we got distracted by the blooming Ocotillo. This is usually dry, thorny bush, so dry it looks dead but after a little rain it pops to life again. Click the photo for another view. 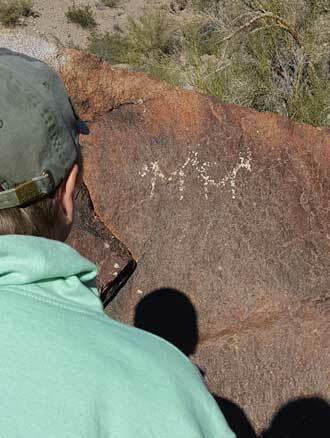 We found "Quartzsite" and the North arrow in rocks too. Click that photo for the north arrow. Someone spent a lot of time picking up then moving rocks. 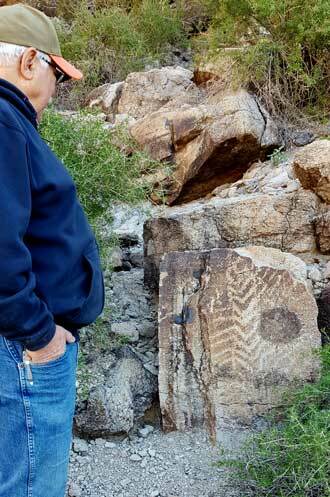 Thursday, February 7, 2019: Gary and Jeanne drove Gwen and I into the Bouse desert to find the Bouse Fisherman Intaglio discovered about 65 years ago. 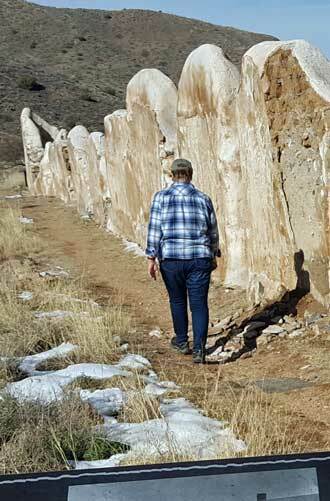 The claim is that this was done by Indians at least 1000 years ago. You must have a drone to see it (photo at left) because from ground view it is hardly noticeable (click the left photo for a ground view). So I'm not sure who the Indians expected to see it. Click the right photo to enlarge so you can read it. 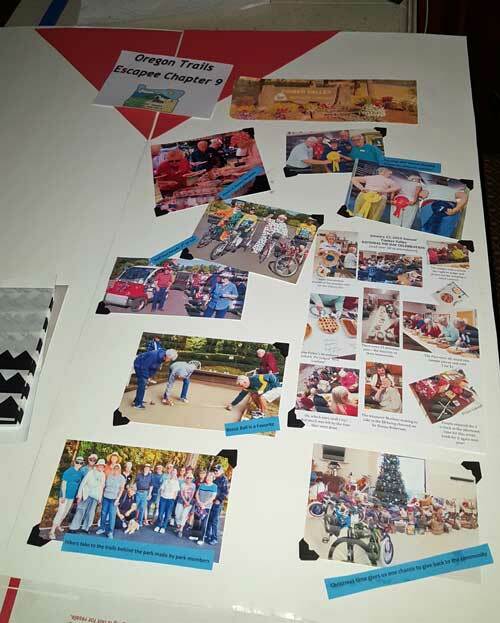 Wednesday, February 6, 2019: Gwen and I have volunteered to represent Escapees Chapter 9 and the Timber Valley Escapee Park in Oregon at the Escapade happening in Tucson in a month. She worked all day on creating a new display of photos to show at the Escapade. It is only partially done. We are looking forward to it. We will be on (what is called) "The Row" of representatives. This will not be our first time to be on The Row. We represented Chapter 37 back in 2007 so we know what to expect. 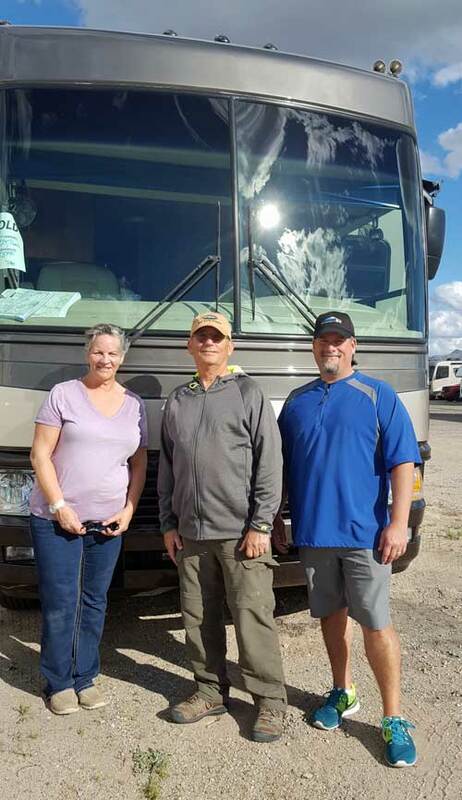 It is a fun, busy time where we will meet a lot of other RV travelers. No photos of what I did today because I spent nearly all day on the Internet. I cancelled the insurance policy on Miss Dory. 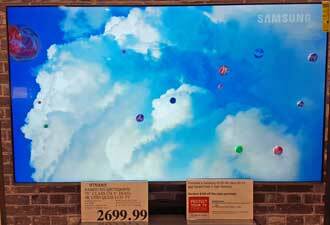 Then I cancelled and requested a refund for the extended warranty we purchased at the time we purchased her. I joined Boondockers Welcome and requested a stay near Tucson. It wasn't long until I received a notice that the dates I wanted were already booked so I requested a location near Willcox, Arizona. That location was available and we were accepted. You'll see photos as we camp there. This is somewhat of an experiment. We plan to visit Wisconsin this summer and stay at many of the spots listed in Boondockers Welcome. I called Cummins Diesel with questions about the engine in Mz Ruby but didn't much help. It may mean a trip to Cummins service but I'd sure like to wait until Oregon for that. Next, since Miss Dory has been sold my thoughts went to selling the fifth wheel parked on our lot in Sutherlin. I know when that sells, we will have to switch from State Farm insurance to something else because State Farm will not insure "full time RV" nor do they offer "full timer" insurance. 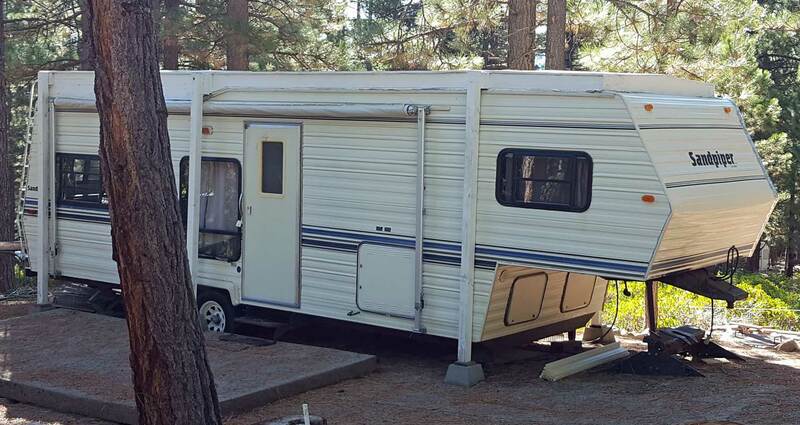 When you are full time RV, you no longer have "home owner" insurance so no liability insurance. Companies like Progressive know this so offer "full timer" insurance which is personal liability insurance. For that reason, the fifth wheel is insured by Progressive but everything else is insured by State Farm. So I contacted Progressive today for a quote on Mz Ruby and the Forester. I learned insuring with Progressive would save us quite a bit over State Farm. Something to consider. Next I began to investigate replacing the house batteries on Mz Ruby. That is going to be very expensive and there is much to consider. Should I replace with AGM, the style battery used currently or should I switch to the new lithium batteries. That is a question without an answer yet. 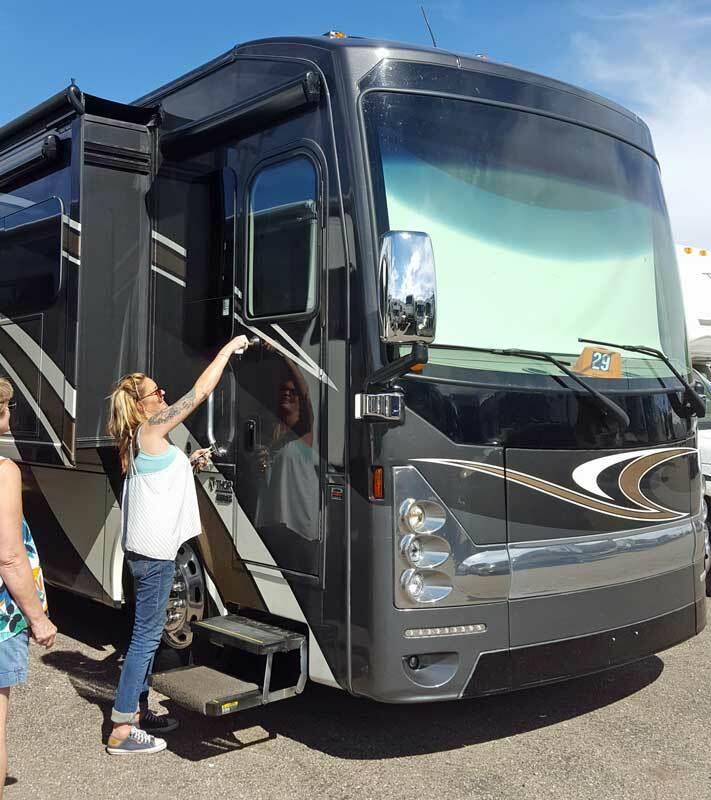 Tuesday, February 5, 2019: At little more than three years ago we happily purchased Miss Dory, our first Class A motorhome. She was absolutely perfect for us after a few improvements. But after three years we decided we wanted something larger and with a few more features. 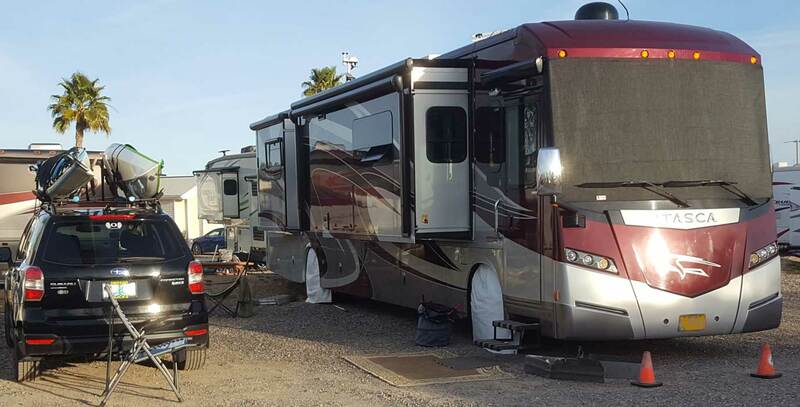 We put Miss Dory on a consignment lot in Quartzsite, Johnson RV. 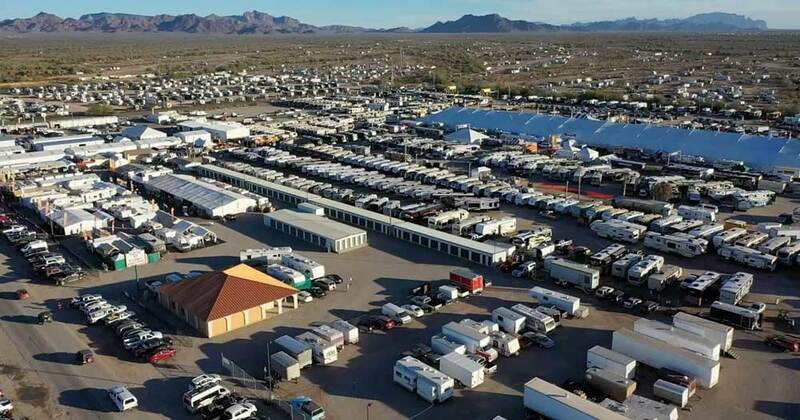 Johnson RV is really an Oregon dealer but comes to Quartzsite only two months of the year to catch the large RV crowd here for December and January. Jeff is the salesman I worked with in the right of the photo. Pamela and Ray purchased Miss Dory from Jeff and we accidentally got to meet Pamela today. Ray was off to Blythe, California doing paperwork to avoid Arizona Sales tax just as we had to do three years ago. Pamela is on the left in the photo. We learned that they plan to take Miss Dory to Alaska and already have a chest freezer on board to store the fish. Miss Dory knows the way to Alaska already. I told Pamela some of the special tricks with Miss Dory which Jeff had not mentioned. I also found several more keys to give to Pamela. They are getting a very good motorhome and are very excited about it. We were very glad we got to meet them. Jeff has been a good guy to work with too. He was as happy as we were to sell such a good motorhome. 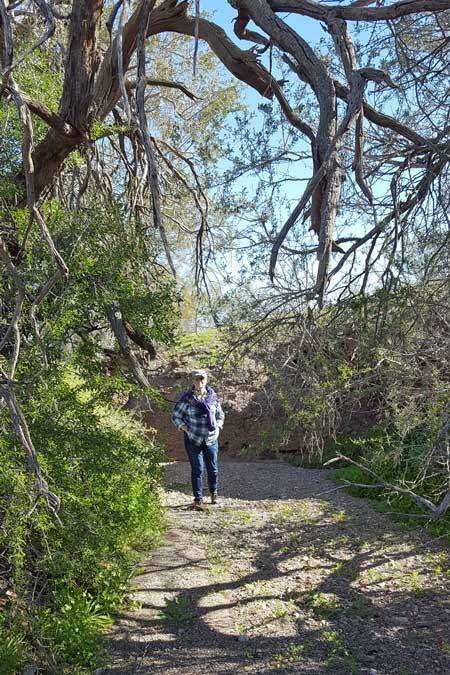 Monday, February 4, 2019: Today was a trip to Parker, Arizona with Gary, Jeanne, and Gwen. The trip was for groceries and laundry but the laundromat was too crowded, we ended up doing the laundry in Bouse later in the afternoon. After grocery shopping we ended up at an unusual Mexican market with a small restaurant on the side. A life size photo of this woman was part of the decoration. I insisted Gary stand with me for a photo. Pretty funny. 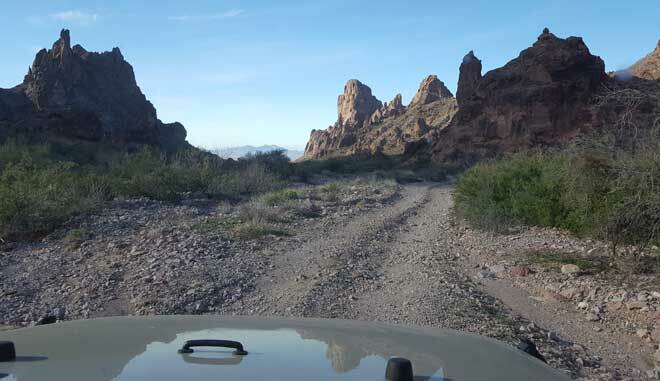 Sunday, February 3, 2019: This is our first desert drive into the area around Bouse. Our first stop is a hole in the rocks which turns out to be a pretty large cave. 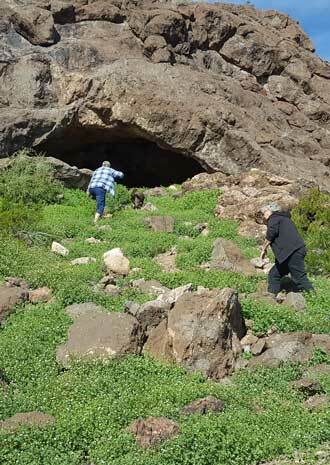 This cave might have been used in the distant past as a home for several families, it is that big. Click the photo to see another cave view from the inside. We drive deeper into the mountains and find some great views. We had lunch on the top of one of the mountains with another great view. Click the photo to the right for another view. 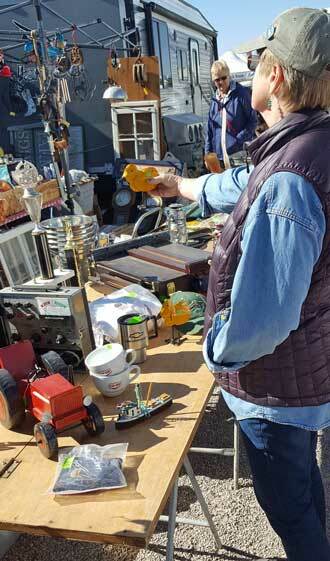 Saturday, February 2, 2019: Yesterday it was a small flea market in Bouse. 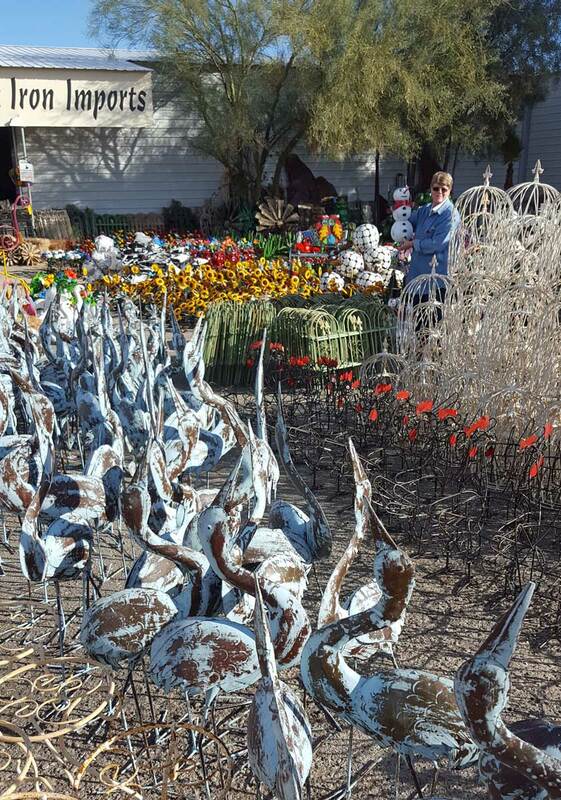 Today is the main flea market in Quartzsite. The first Saturday of the month the QIA sponsors a flea market and art show inside and outside the QIA building. 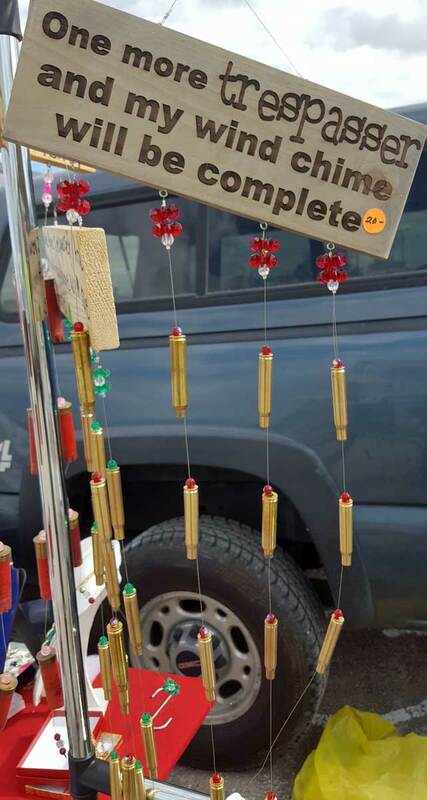 All of the flea market items are found outside surrounding the building however, not everything outside IS a flea market item, some are well done crafts. 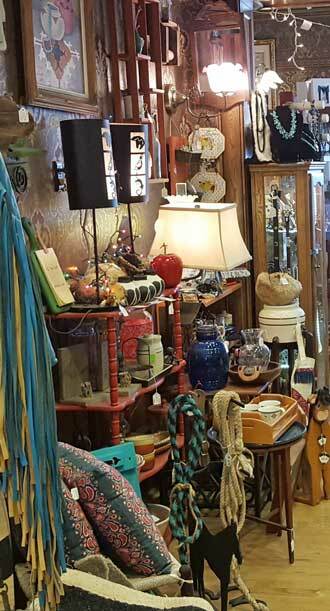 Inside is mostly handcrafted crafts of all kinds. 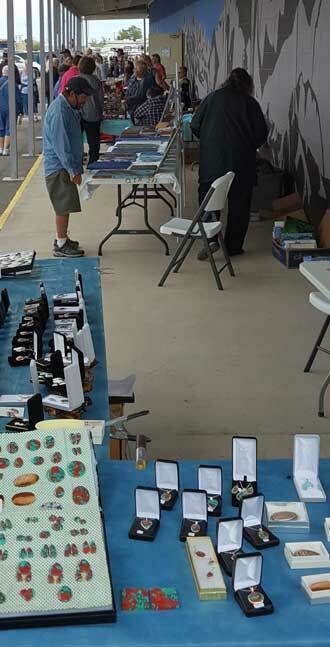 Lots of jewelry and rocks (because we ARE in Quartzsite) but many sewed, knitted, carved and sawed items too. We did buy a few items for Mz Ruby and Gwen likes moisturizing cream so we purchased some special for her. Click all the photos for more views. 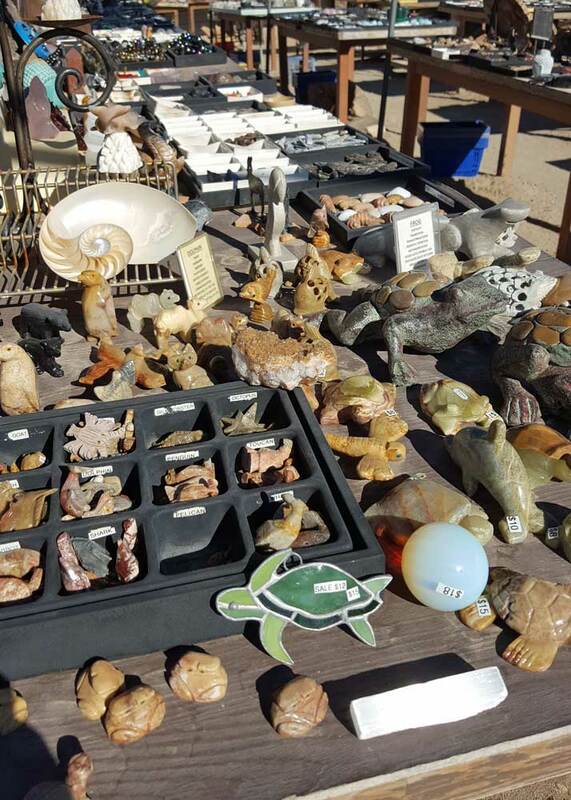 Friday, February 1, 2019: The first Friday in Bouse is the day a flea market happens at the Hwy 72 Bouse Rest Stop. 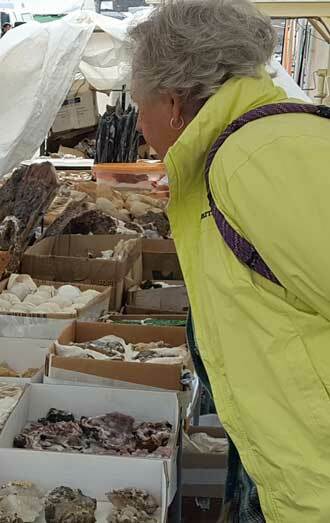 After a trip to the post office to mail Valentine Cards to the grandkids, I stopped at the flea market. I actually found an item for Gwen and some pots I hope to turn into art. 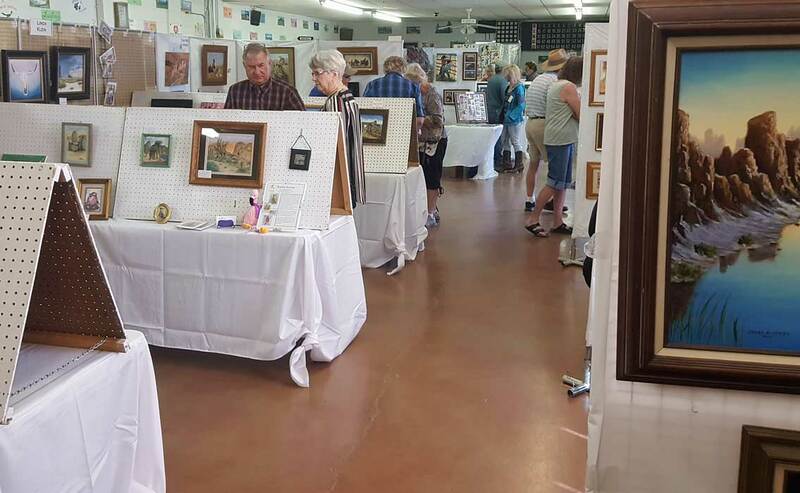 Next, I stopped by the community center to view the art show happening there. No purchases at the art show but it was very busy, artists were sitting next to their work. Folks were having food, drink and buying raffle tickets. The last stop was at the community park for fresh water, 20 gallons for $1. Click the photos for another view. 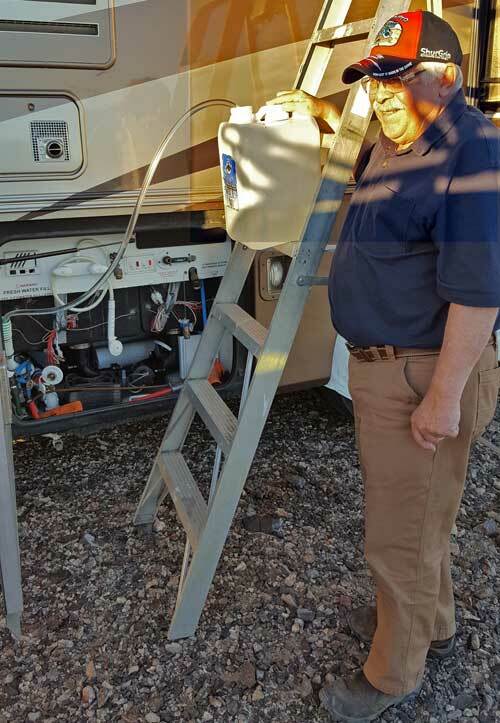 Thursday, January 31, 2019: Three years ago I helped Gary install a solar system onto his motorhome. We originally installed two 180 watt panels but now Gary has decided to install a third 180 watt panel to give a faster charging time and/or better charging when the sun is not optimum. 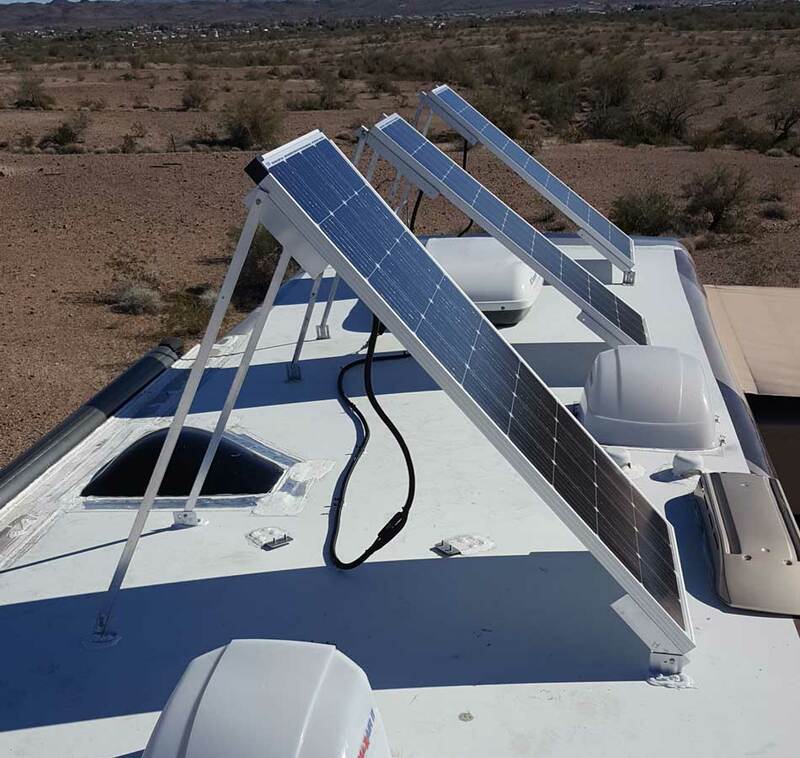 RV solar systems simply charge the on-board batteries so in a sense a solar system will do no more that what the batteries will do. So all DC components in an RV are powered by the batteries. That would include lights, fans, water pump and furnace. The batteries will also power AC items if you use an inverter and the AC items does not require lots of power. 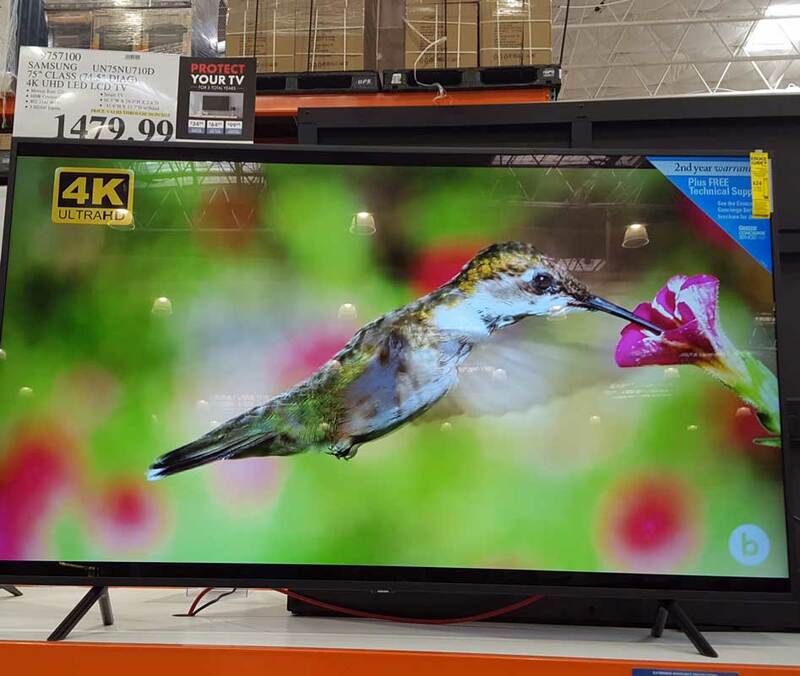 So the TV, stereo, coffee pot (for a short time), etc. can be powered by the batteries also. In general, the more solar panels you install, you also need more batteries to store the power. In Gary's case, he has four 6 volt deep cycle batteries and his three panels will send about 30 amps to the batteries when the sun is optimum. 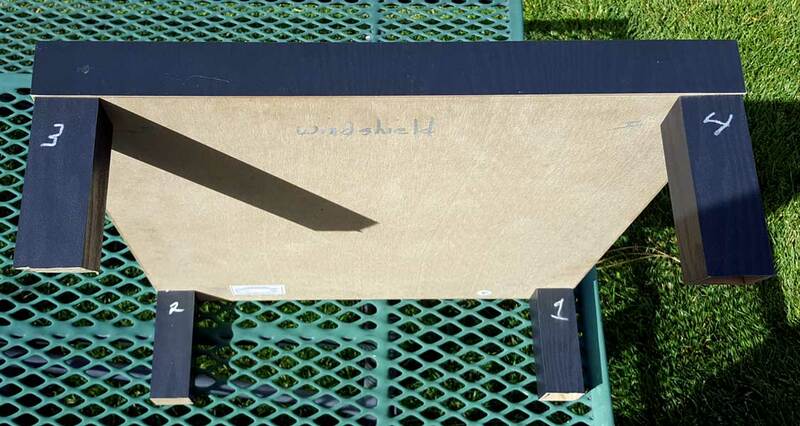 He has tilted his panels to the south to point them directly at the sun. That will give him optimum power about two hours each day. He won't have to tilt the panels later in the year (about the end of March) because the sun will be higher in the sky. Once the installation was complete, both Gary and I were excited to see the reading on his charge controller showing nearly 30 amps to the batteries. Click both photos for more views. 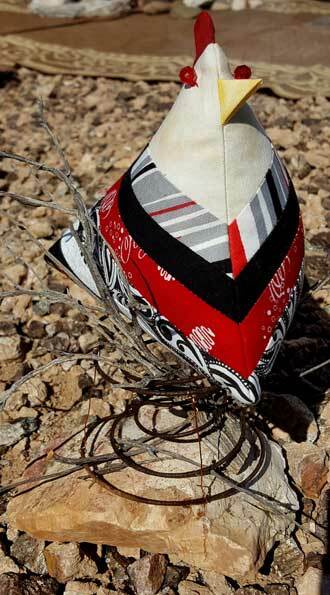 Wednesday, January 30, 2019: Turning desert trash into art, or at least attempting art. We found this old rusted spring seat. 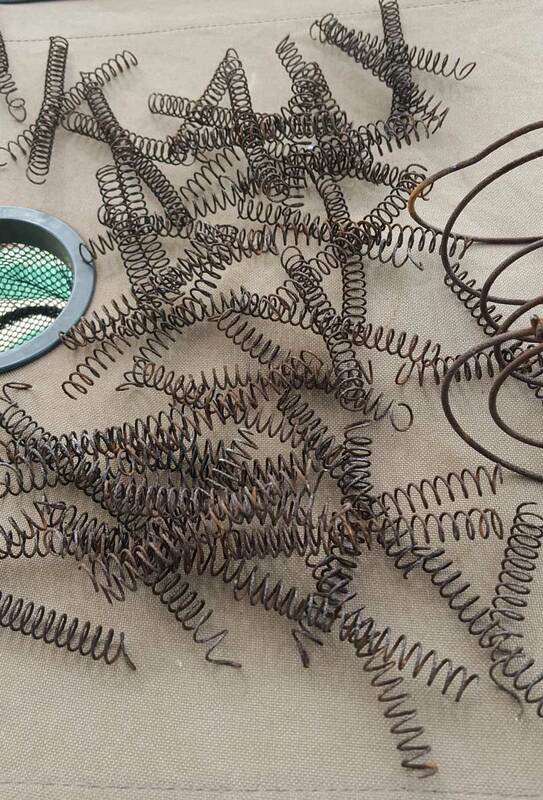 I began the work of pulling it apart to get to the springs. 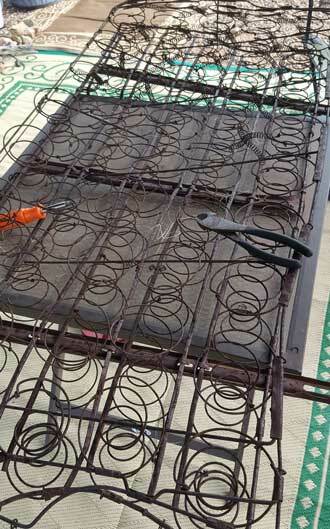 We found more than 400 photos on the Internet showing how to turn coil springs into art. Here was my first attempt. Gwen has suggested that I fill the coil spring with desert rocks. 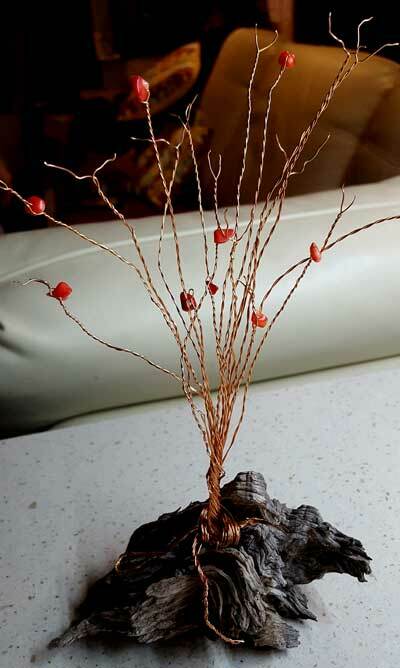 I think that is a great idea and will make my desert tree look much better. 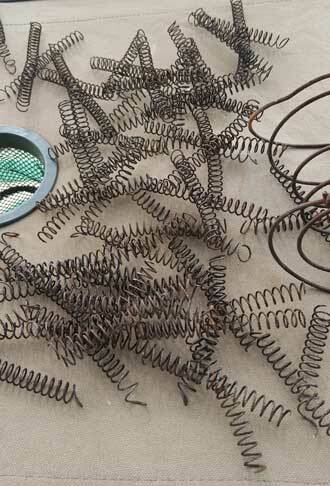 I'm not sure what I will do with the small coiled springs. 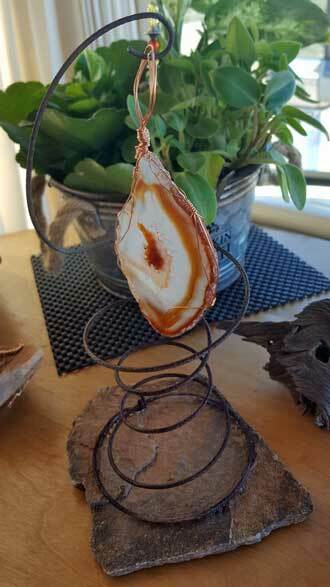 One idea is to use them as hair when I make some Native American art using the Ammonites I bought today. Here is the idea I found in one of the Wickenberg shops. 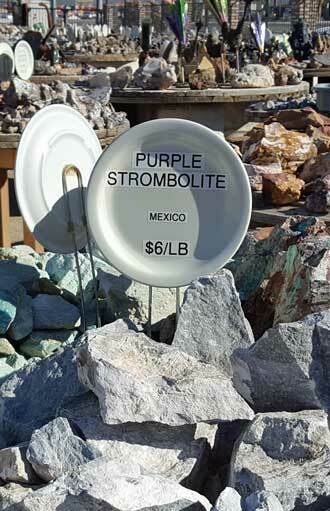 The Ammonites are relatively inexpensive at one of the shops in Quartzsite. 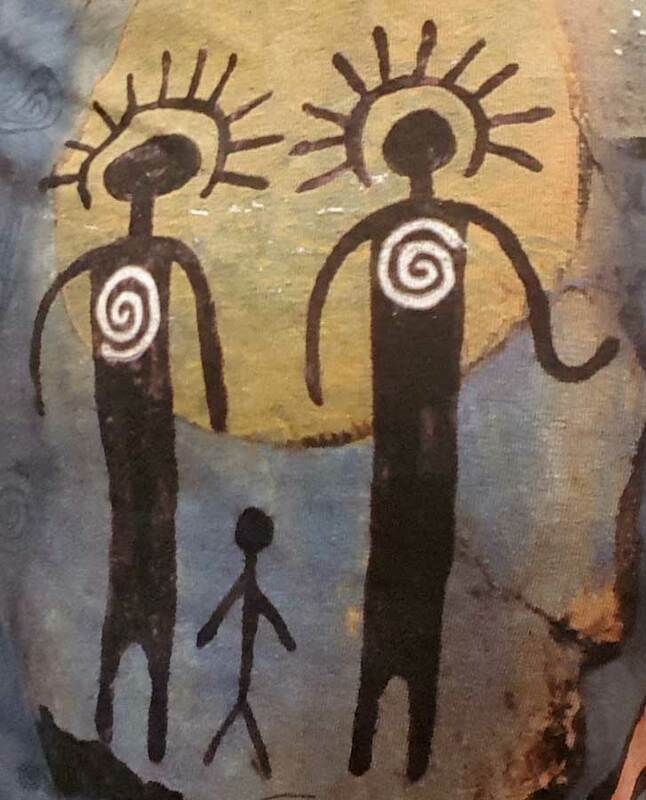 Here are the same figures on a T-shirt I purchased at the Hoh Rain Forest last year. Click both these photos to enlarge. Monday, January 28, 2019: Gwen and I drove 1.5 hours to Wickenberg, Arizona to explore old town. 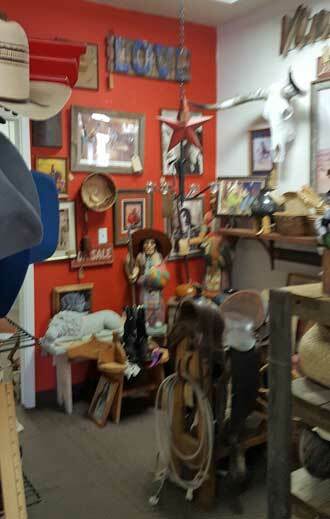 We walked thru most of the western shops and antique shops in old town. Gwen found a few things she liked and bought for Mz Ruby. I found things for the grandkids. I also found the part I needed for the Mz Ruby toilet. It will be replaced tomorrow. Click the photos for a sample of our day. 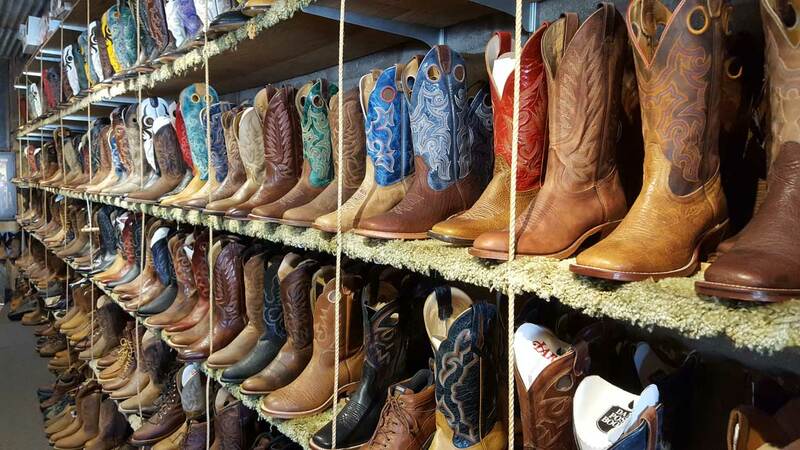 Wickenberg is a western town with lots of western wear, furniture, decor, boots, hats and clothing. It is fun to see the different western themed items. Saturday, January 26, 2019: Probably a hundred off-road vehicles passed in front of our parking location today. The check point was only 1/4 mile down the dirt road. Fortunately, we had a strong wind from the north blowing the dust away from us. It was obvious, some of the racers were very serious as they flew down the road while others were in the race for an enjoyable Saturday ride. I have made a short video but check back to see it. I need better Internet to upload it. Friday, January 25, 2019: Gwen and I decided to go on a three mile hike to an old parking location we used several years ago. This location was chosen because it was further into the desert making it more private. It was also chosen thinking we would have less wind. 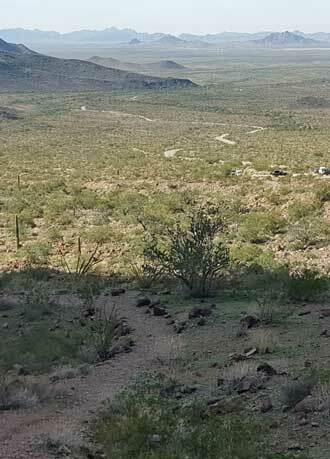 There is much good about the old spot but the negatives are, 1) a longer drive into the desert, 2) no cell phone access which also means, 3) no Internet access. For those reasons, we haven't visited this location since our first time in 2010. There are many campers in the desert who like to be much farther into the desert both for privacy and to drive their desert ATVs. Click the photo to see the old parking location. Thursday, January 24, 2019: This was a warm day, a good day for laundry and drying the laundry on a make-shift line I've strung between the car and Mz Ruby. Click Gwen's photo to see what I'm talking about. 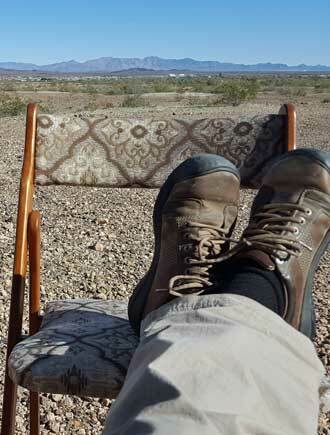 Meanwhile, I'm also sitting in the sun but I'm making a study of the mountains and the distant town of Bouse. Click on my feet to see a panorama of what I'm seeing. Gary and Jeanne's motorhome is off to the right in the panorama. Click a second time to enlarge the panorama then scroll right and left. 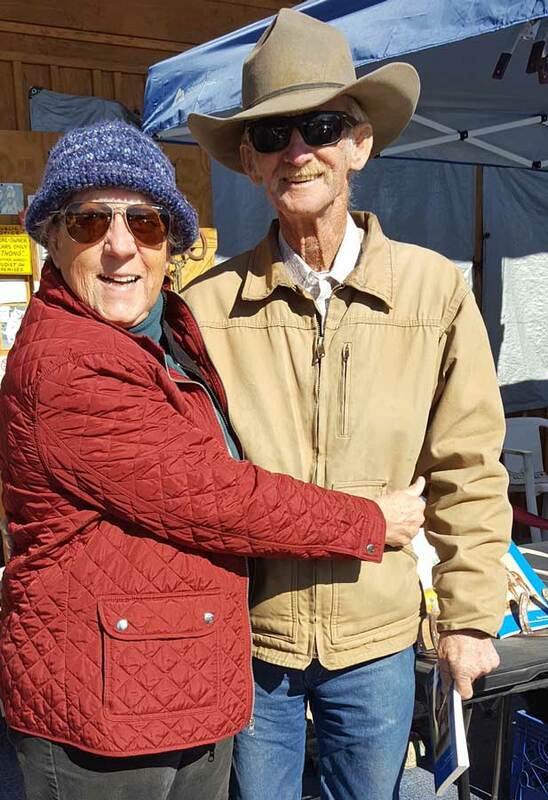 Tuesday, January 22, 2019: Gary and I return to the Big Tent today and this time Jeanne and Gwen have joined us. 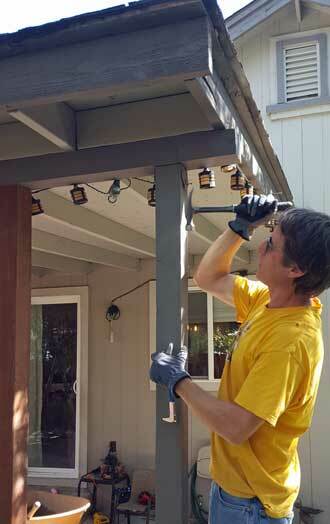 Gary is after another solar panel for his solar system. I am after an oil filter for our generator. But while we are in the area, we tour the booths surrounding the Big Tent. 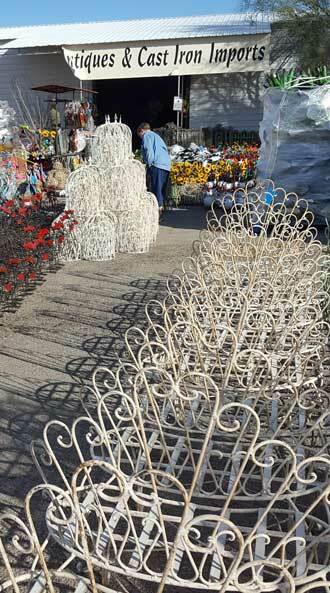 That is where you will find some of the more unusual items. Click the large photo above for another view. Monday, January 21, 2019: We had grocery shopping to do in Parker, Arizona so stopped by WalMart where I picked up another "end table" to adjust and use at a steering wheel table. I did this for the Dolphin but could not transfer because the legs were too short. Only 2.25" of two legs needed to be shortened. I used the cut ends to create spacers for the steering wheel. 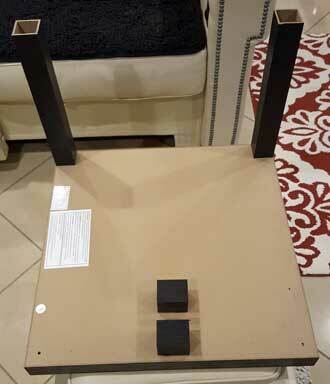 Two legs, then, support the front of the table and the steering wheel supports the lounge side of the table. Creating a steering wheel table makes the cockpit portion of the front end useable. A lamp, flowers, candles, books and other memorabilia can be set upon the table. Click both photos for additional views. Sunday, January 20, 2019: It is time to add water to the fresh water tank. 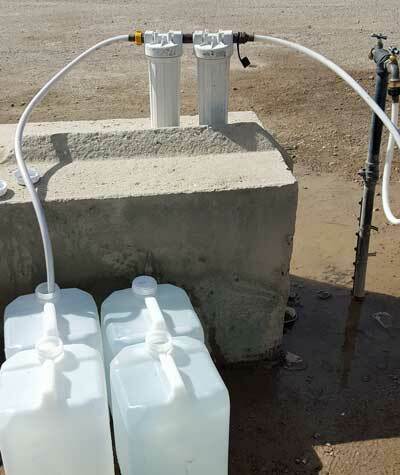 I am able to switch a couple of valves then use the on board water pump and the antifreeze system to pump water from a five gallon container into the freshwater holding tank. I usually put 20 gallons into the tank at the same time so I have four five gallon containers. Gary, on the other hand, has figured out how to siphon water into his holding tank by putting the five gallon container onto a ladder then siphon into the gravity feed tube to fill his fresh water tank. We purchase the water from the local county park. They ask for 5¢ per gallon so the 20 gallons is a dollar. I usually pick up 20 gallons about every three days. Saturday, January 19, 2019: The "Big Tent" has opened today and will stay open for about a week. The crowd was enormous, shoulder to shoulder walking the isles inside the tent. 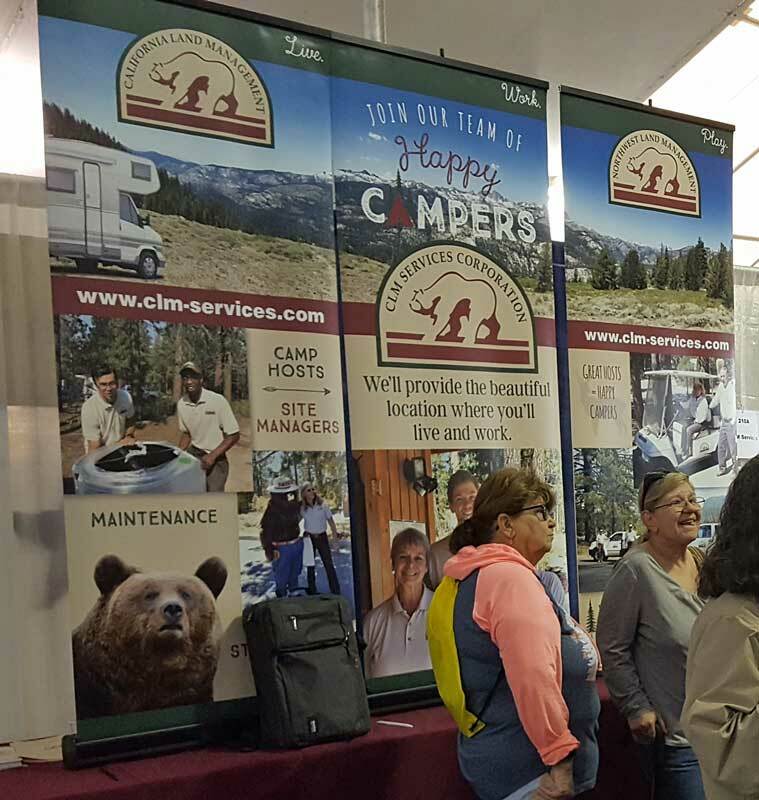 It is billed as an RV Show event but inside the tent you will find a huge variety of products to buy and "Workamper" jobs to be had. 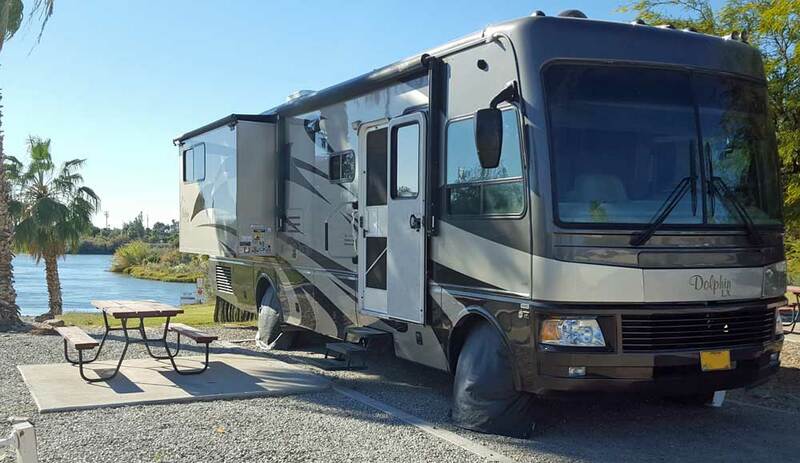 Examples are the usual RV parts and accessories, clothing, flagpoles, solar panels and controllers, food mixes and sauces, Cummins engines, engine additives, cleaning products, RV resorts and touring companies, plus much more. 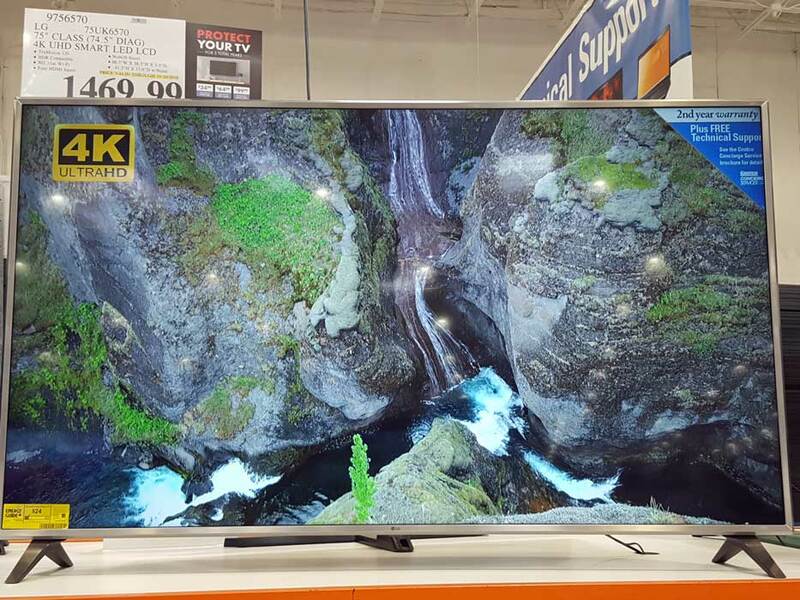 In general, there are good prices slightly better than what you might pay online or at the local RV store. It really takes much more than a day to explore everything. 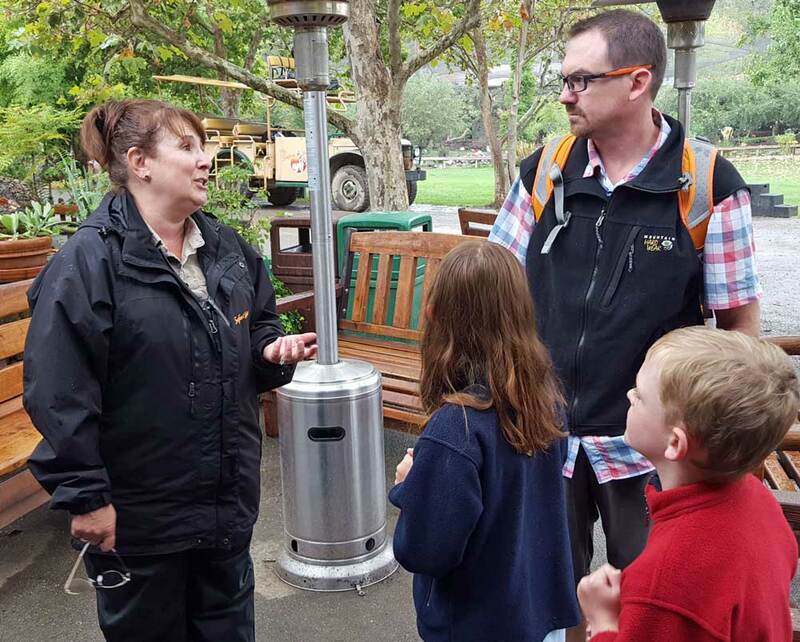 This is also a good place to learn about workamping jobs and camp host volunteering. 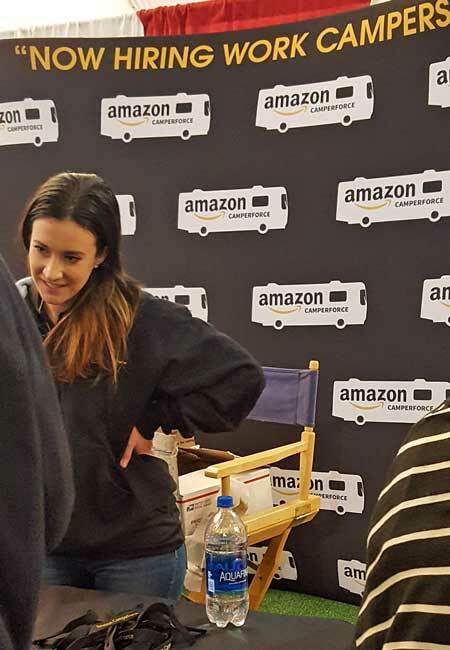 There were many booths offering workamping, Amazon was one of those. Behind the Amazon photo is CLM (California Land Management). CLM is who we worked for back in 2010. Several of the major RV clubs also had booths such as FMCA and Escapees. I came specifically to see Craig. I purchased his tire pressure monitor system last year. My monitor needed a free upgrade which he performed while I walked the show. I also purchased a signal booster since this motorhome is 7 feet longer. The signal from the toad needs boosting although installing new batteries helped a lot last trip. I don't want to take the chance so purchased the signal booster. I signed up for more free drawings and got several free shopping bags and a free T shirt. I hope to go back when the crowd is less so I can see more. Click both photos for more views. Friday, January 18, 2019: When Gwen is looking for something to break the stress of living in the desert, this is what she likes to do. It only took her about 3 hours to complete this one. 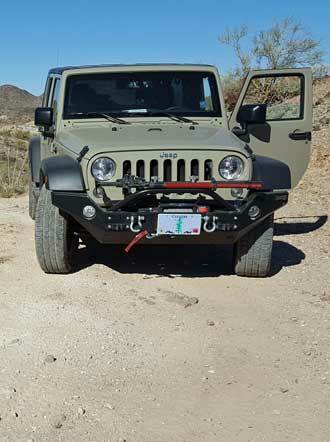 We did drive to Quartzsite today for a couple of parts we needed. 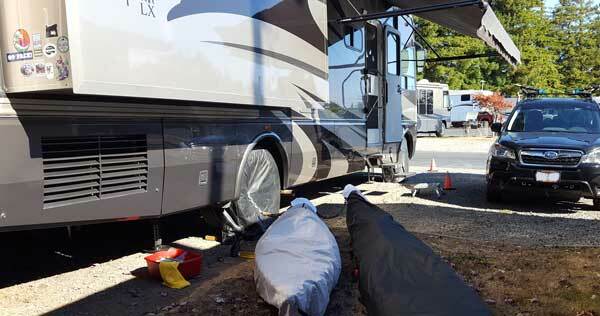 We'll be going again tomorrow because tomorrow is when the "Big Tent" opens, one of the largest RV shows in the west. Folks come from far-away states to see what is happening in the "Big Tent". Pictures to follow tomorrow. 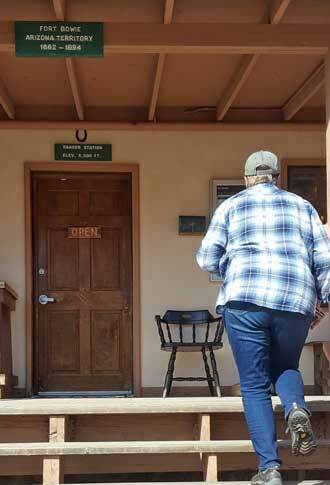 Thursday, June 17, 2019: One restaurant/bar has been in Bouse, Arizona for the longest time, the Ocotillo Lodge. Every Thursday is "Rib Night" so Jeanne, Gary, Gwen and I drove the few miles for ribs. We hated to miss the sunset but I caught it out the back door of the Ocotillo. 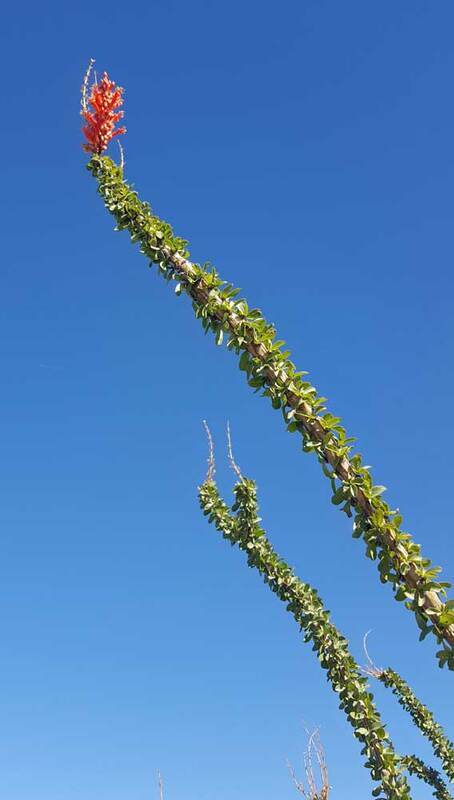 Click the photo for a panorama of the inside of the Ocotillo. Yes, Jeanne DOES talk with her hands. 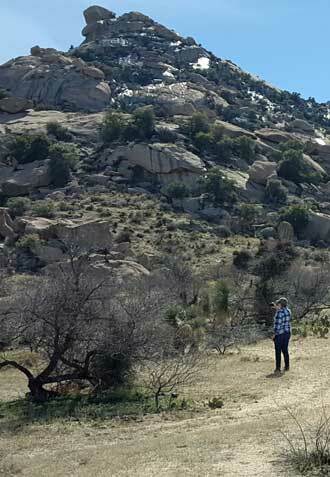 Wednesday, January 16, 2019: The weather is back to sunny and warm today so we had to take a hike into the desert. 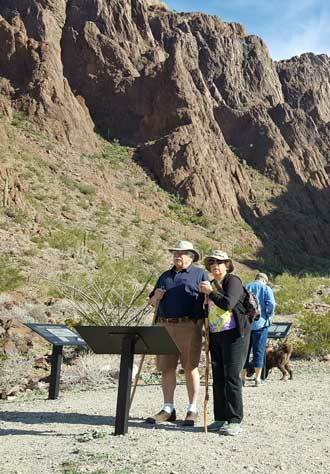 Jeanne and Gary have joined us so Jeanne joined Gwen and I for the desert hike. 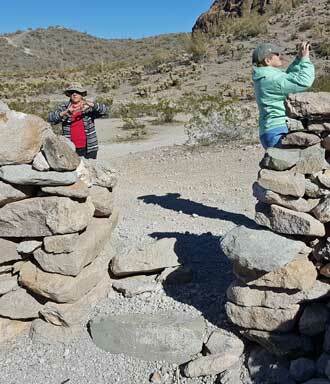 We are still exploring looking for the right rocks for Jeanne and Gwen's new projects. 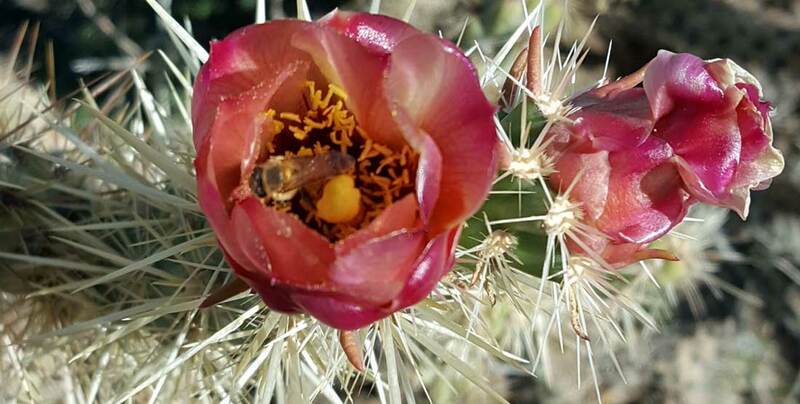 We are expecting the "greening" of the desert after the rain we received yesterday. 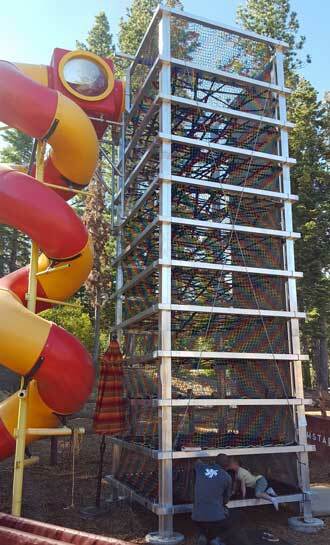 After the hike, I climbed to the top of Mz Ruby to make an adjustment. This is the view to the rear. Click the photo for a huge 180 degree panorama of the desert surrounding us. Be sure to click the panorama and scroll left and right to see the entire panorama. A short story about what we have discovered with power to the residential refrigerator. During the storm we had to charge the batteries with the generator and the batteries held enough charge to keep the refrigerator all night. Last night the batteries were at 12.7 volts. After sending power to the refrigerator all night they were at 12.5 volts this morning (75%). No generator today for the first time and I learned all solar panels are working. Our previous solar experience was batteries fully charged by noon. Today, our batteries were fully charged by 1 pm. Very good. I am surprised at how well everything is working. 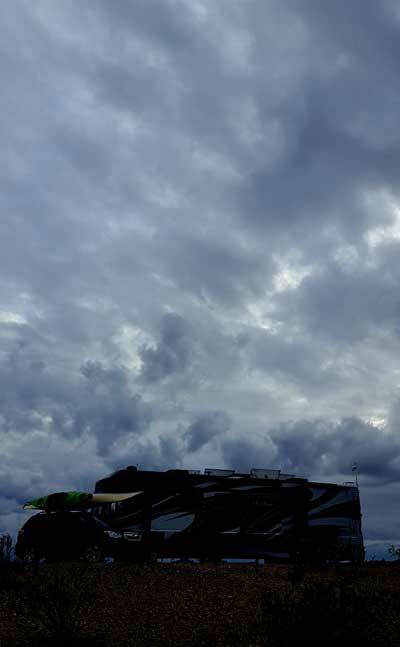 More clouds are forecast for tomorrow so it may be a new experience. Tuesday, January 15, 2019: The storm arrived last night with rain most of the night. That is unusual for this part of Arizona even in the winter. 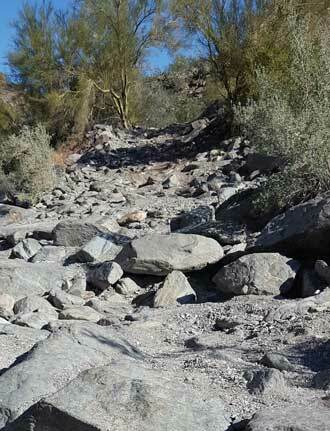 Before the storm the Bouse Wash was dry, this morning it is running. This photo was taken from the bridge over the Wash. 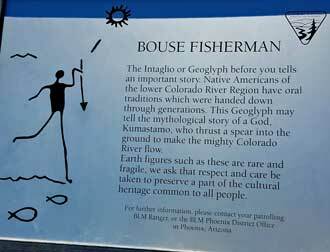 I drove over to Yellowbird Road where the Bouse Wash crosses with NO bridge. 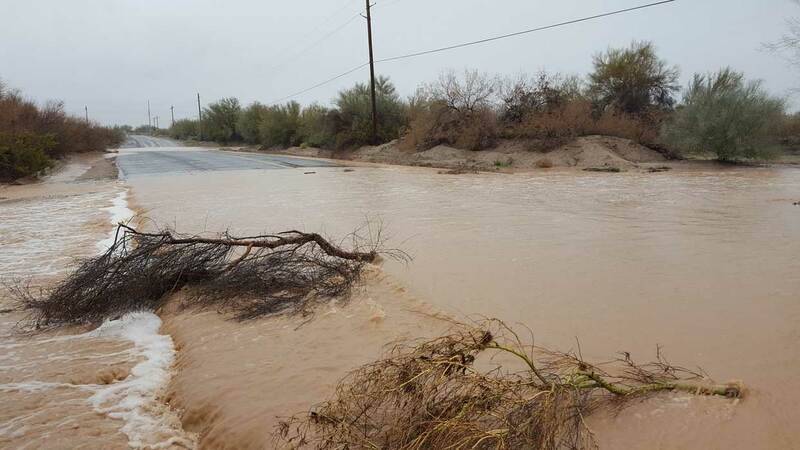 The road leading to Quartzsite has a sign, "Road Flooded". That did not stop us from driving to Quartzsite. Some of the washes crossing the road had 4" - 5" of water but nothing to stop our trip. I did check the little wash behind Mz Ruby and it had only a few wet spots, not enough to be running. My weather station measured 1.4" of rain. Monday, January 14, 2019: This was moving day. 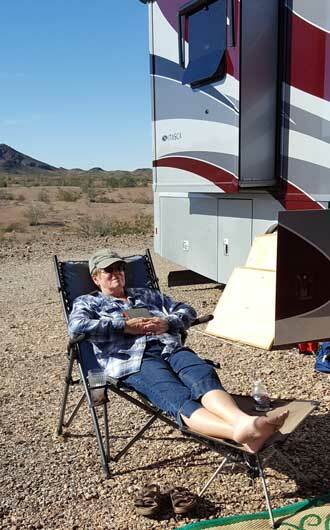 We experimented with the winter RV park since I had won a $500 gift certificate for the Arizona Oasis Resort in Ehrenberg. The conveniences were nice but noise, dust and crowded conditions were annoying. As you know, I spent a month preparing Mz Ruby for this day. 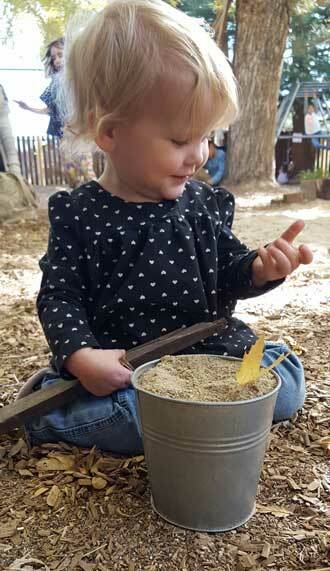 We are now teaching her how to live off-grip in the desert. We now have 360 degree views and our nearest neighbor is at least 1/4 mile. We are looking forward to Gary and Jeanne joining us tomorrow or Wednesday. We have moved today to beat the incoming storm since I spent three days polishing Mz Ruby, I didn't want to drive her in the rain. Click the photo to see a daylight view. 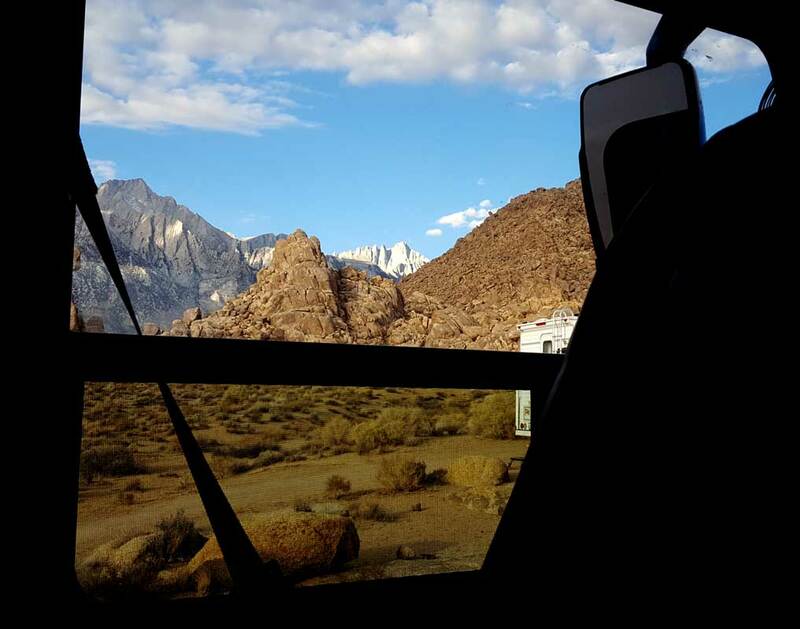 There are eight things to look for to make long term boondocking comfortable (anyone can boondock for one night, you arrive with batteries fully charged and holding tanks easily accommodate overnight). 1)Spectacular views, 2)Easy access to fresh water, 3)Easy access to garbage disposal, 4)Easy access to a dump station, 5)Easy access to propane, 6)Comfortable space from other boondockers, 7)Decent cell/Internet service, 8)Level parking. 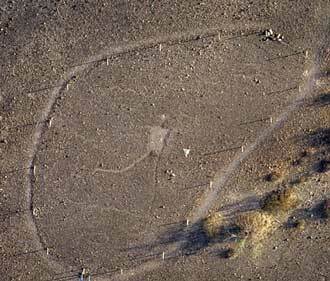 We have all eight in this location near Bouse, Arizona. We are "teaching" Mz Ruby, but she is teaching us too. This is our first RV with a residential refrigerator so we will be learning to manage our six AGM batteries with a combination of solar and generator if necessary. We DO expect to use the generator these first two days since the storm will block our solar panel view of the sun. Saturday and Sunday, January 12 & 13, 2019: These two days will decide who will be in the NFC and AFC Championship. I'm a fan of Kansas City, fortunately they won. 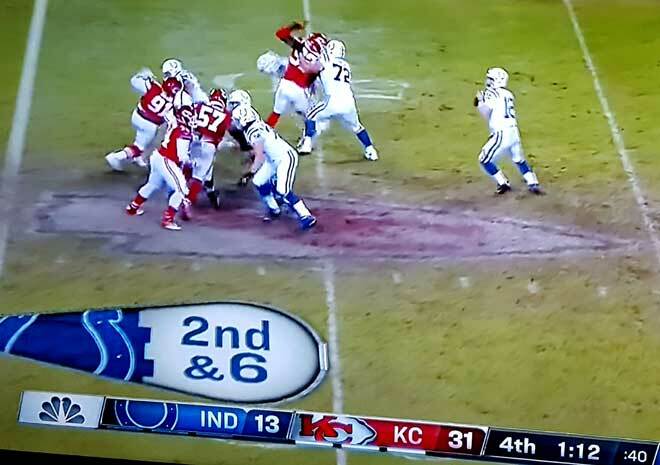 I would also have preferred the Chargers to win but they should have snuck out the back door during halftime. Now, it will be Brady vs Mahomes next week. We are leaving Ehrenberg tomorrow mostly due to "hitch-itch" but not going far. 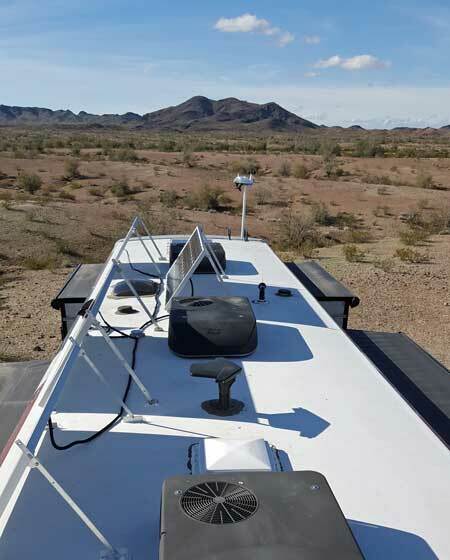 We ARE moving to the desert to learn what it will take for off-grid parking with this new motorhome. I have been packing all the outside stuff and throwing more away. I was able to get everything inside but it seemed like there was more than usual to be stored. Let the boondocking adventure begin! Friday, January 11, 2019: We got a new project idea when looking at the rock and gem show. 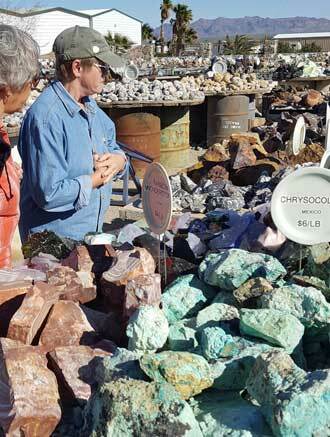 Today we went shopping at Gem World in Quartzsite for the parts needed on the new project. I also found more things for the grandkids. We got the wire and beads we needed for the new project. After Gem World, the girls wanted to go to the "kitchen store". There are many more booths setting up in the Tyson Wells area across from the "Big Tent" which will open on January 19. So, while the girls when to the kitchen store, I went searching the new booths. I found a large tool booth which deserved exploring. I found a few little things to buy. Click the photo to see a panorama of the tool booth. Be sure to click a second time to enlarge. 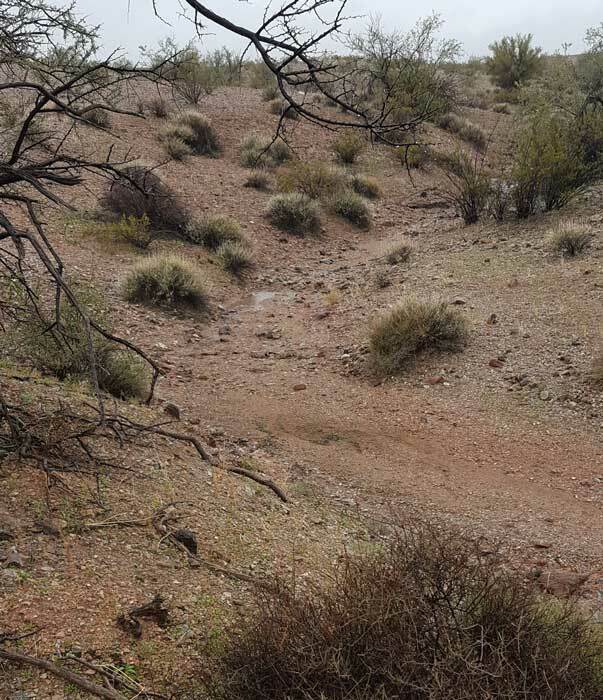 Thursday, January 10, 2019: Off to the desert again to learn if we can find our way on the Arizona Peace Trail from Ehrenberg to Quartzsite through some rugged mountains. The trail is there but titled, "the good, bad and ugly". 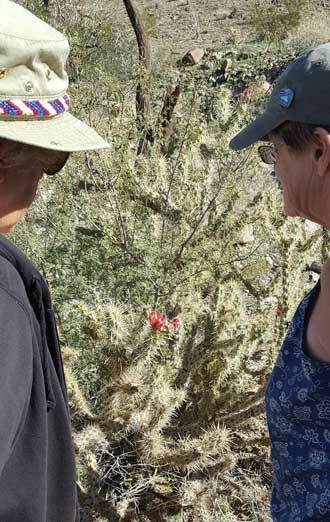 We didn't get far before Gwen and Jeanne spotted a cactus flower they wanted to check out. 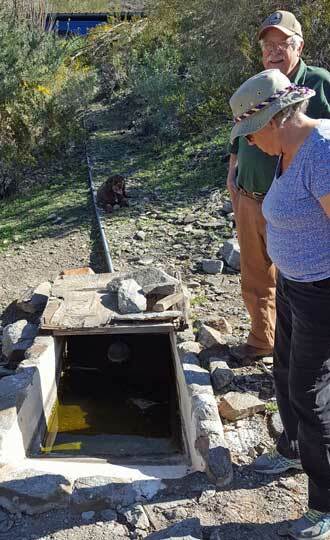 A little farther and we found a wilderness wildlife watering system. 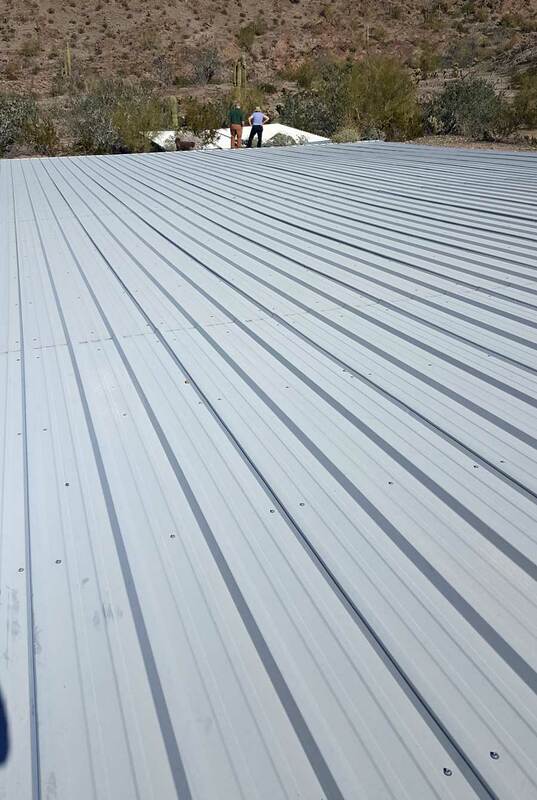 A large number of aluminum roof panels are installed on the ground. They collect dew (and the few rain drops). 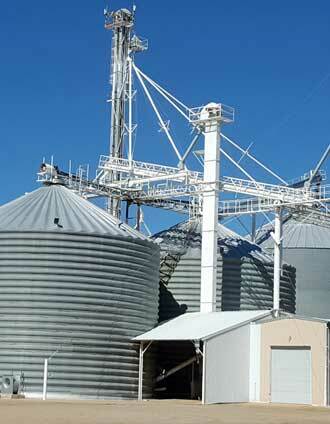 The water rolls down the panels into a trough then collects in a very large holding tank. The holding tank slowly empties into a drinking trough. The water flow is controlled by a float valve. We continued and the trail turned bad with larger and larger rocks. Further and the trail turned ugly! So ugly we decided not to take the Jeep any further. The rocks and gaps between the rocks got big enough to cause the Jeep to hit bottom and potentially get high centered. 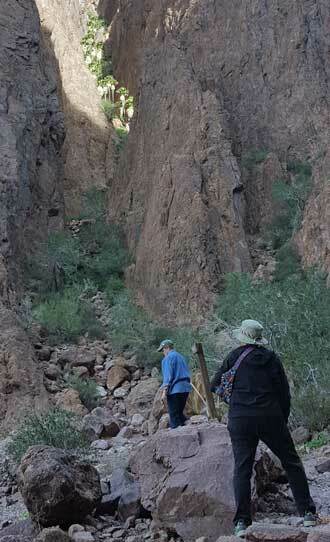 Gary and I explored further and found that the rocks on both sides of the trail got too close together. The Jeep would not fit through this narrowing path. We turned around. Click on all the photos for another view with one exception. There is nothing behind the trough photo. 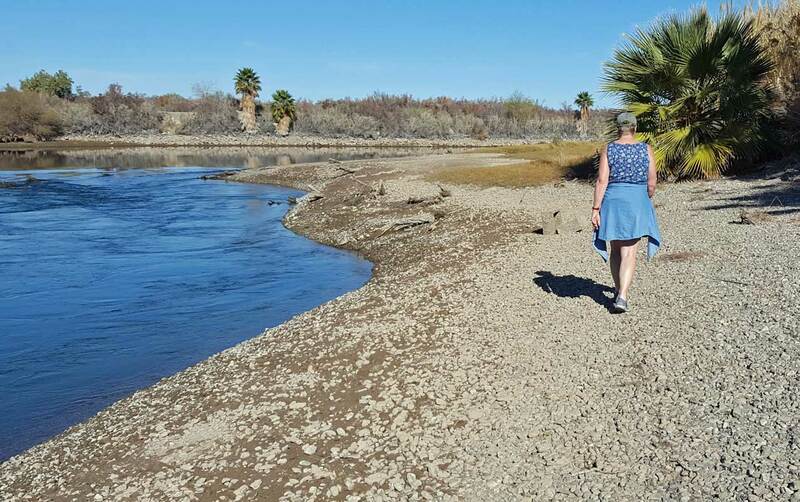 Wednesday, January 9, 2019: Gwen and I go exploring north of Blythe and discover the Mayflower County Park on the west side of the Colorado River. This park is a large, grassy, treed field with water and electrical boxes scattered around the field. The monthly fee is very reasonable at a bit more than $300 per month. There is no sewer connection but the cost of the space rent includes a pumping truck three times each week. 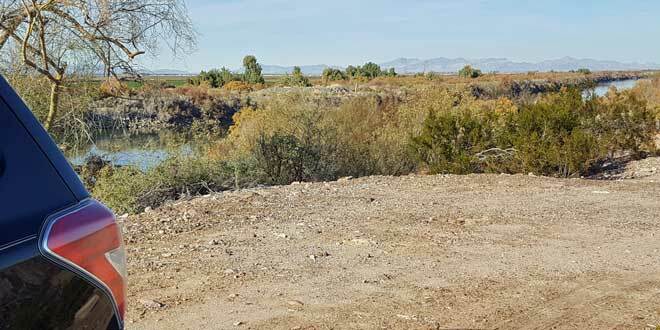 The feature here seems to be the quiet location and access to the Colorado River. I see no hiking trails or other activities. Click the photo for a photo of the river access ramp. Looks like you need to like your neighbor in this park. 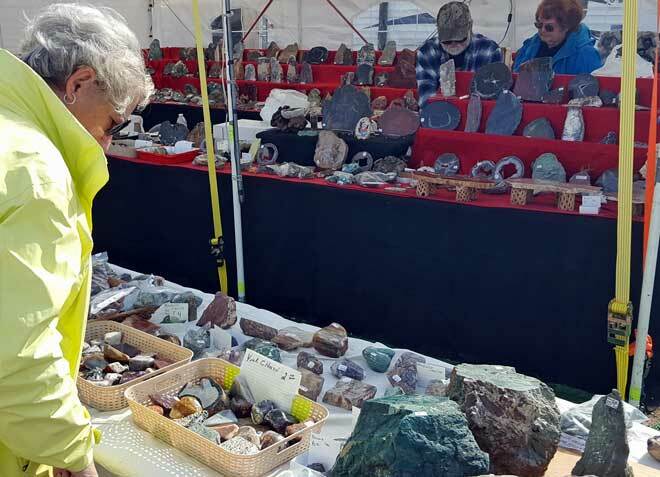 Monday, January 7, 2019: The Quartzsite Winter Rock and Gem show has opened with about 200 booths. We saw only about 20% of the show before we were exhausted. 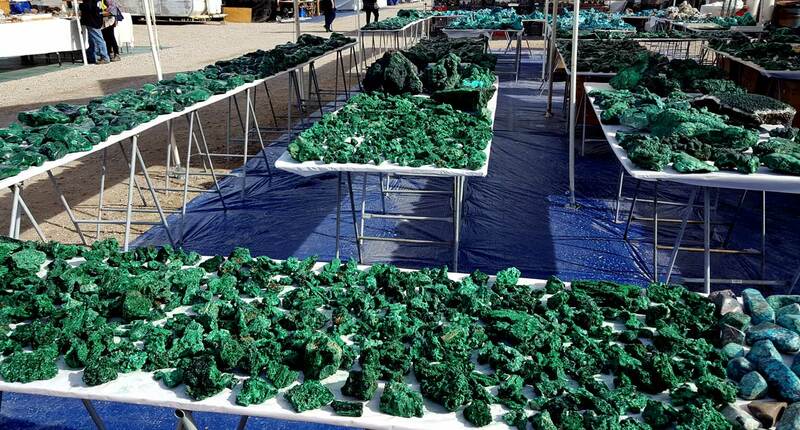 Every rock from every country was available to see and buy. 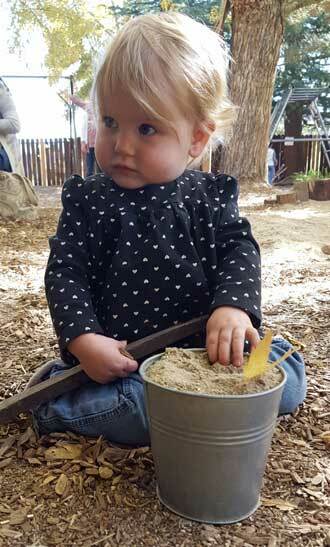 This is an interesting way to learn about rock collecting and rock preparation. 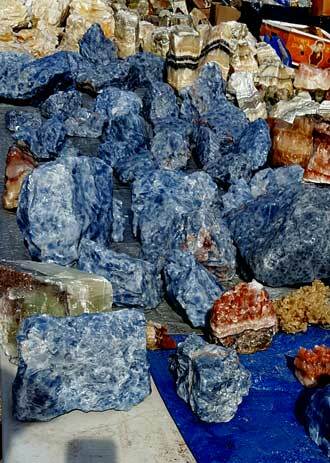 I did find some special rocks for the grandkids, I hope they like what I got them. Click all photos for larger views. 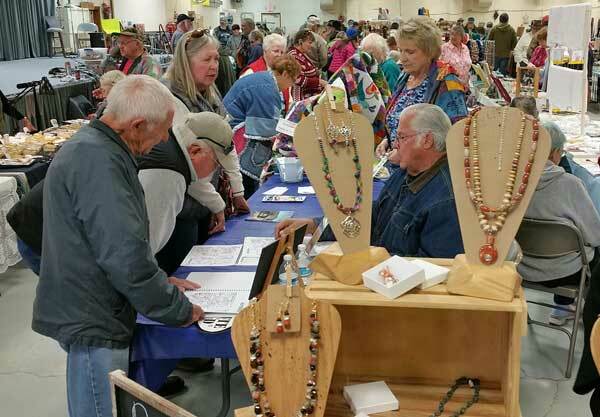 Sunday, January 6, 2019: One day each month during the winter months the QIA (community center) in Quartzsite sponsors an art and craft show. 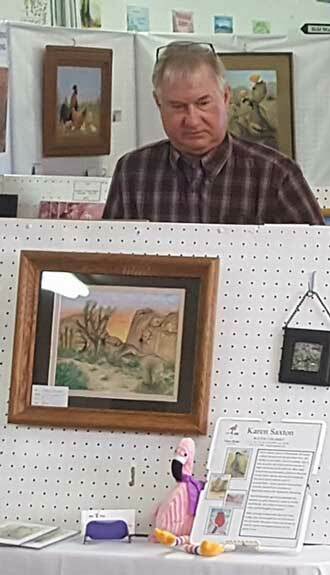 This is different from all the other booths in winter Quartzsite because the majority of what is shown at this show is handmade from local artists or artists who spent their winter months in the Quartzsite area. There are so many booths it fills the inside of the QIA and the parking lot. Friday and Saturday, January 4 & 5, 2019: Gwen and I wanted to see friends Steve and Tina in Phoenix and do some serious grocery and Costco shopping. Gwen wanted a product at the Bath store in a mall so I went to Sears hoping to compare some tool chests. Instead, the huge Sears store was in the last two days before closing for good. Sears is one of those major historical retailers who has NOT figured out the new retail marketing techniques mostly (IMHO) because they have stayed with old management who can't figure out why marketing isn't working when it worked so well back in the mid-twentieth century and before. Instead, they are closing stores dying a slow death. 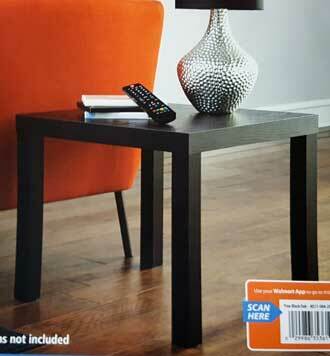 Click the photo to see a retailer who HAS figured out how to market to the twenty-first century. 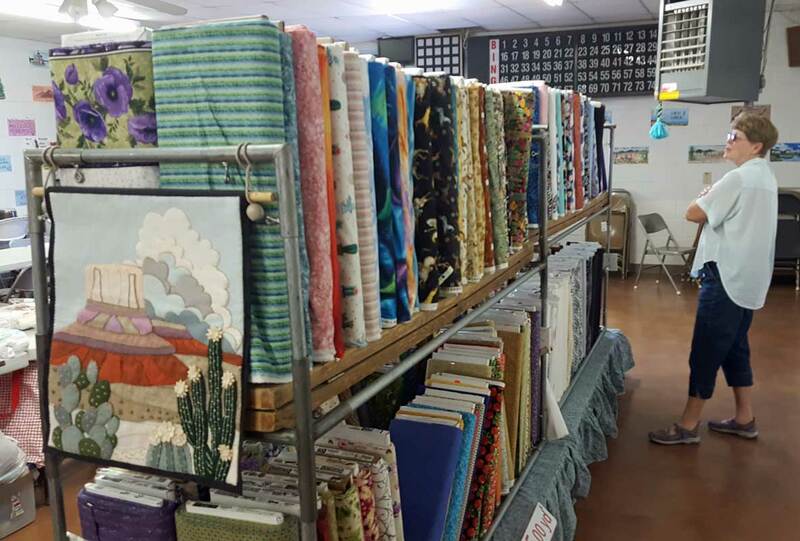 So of course we visited one of the best quilt stores in the Phoenix area as well as one of the best discount grocery chains, Winco Foods. Before returning to Ehrenberg we had breakfast with special friends, Steve and Tina. We are hoping to do a hike with them in February. 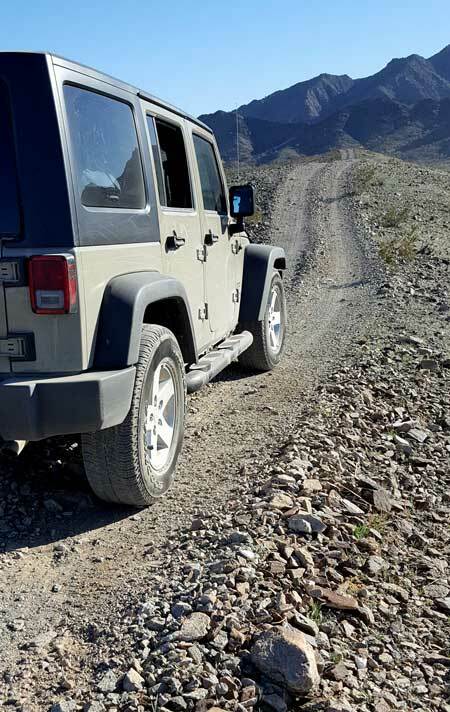 Thursday, January 3, 2019: We took another drive into the desert, this time looking for a remote marble quarry. We found the quarry but it was behind a large fence with a worker digging at the side of the mountain. We drove down into a wash and had lunch. After lunch we continued our drive onto a route much more rough than any we had been on previously. 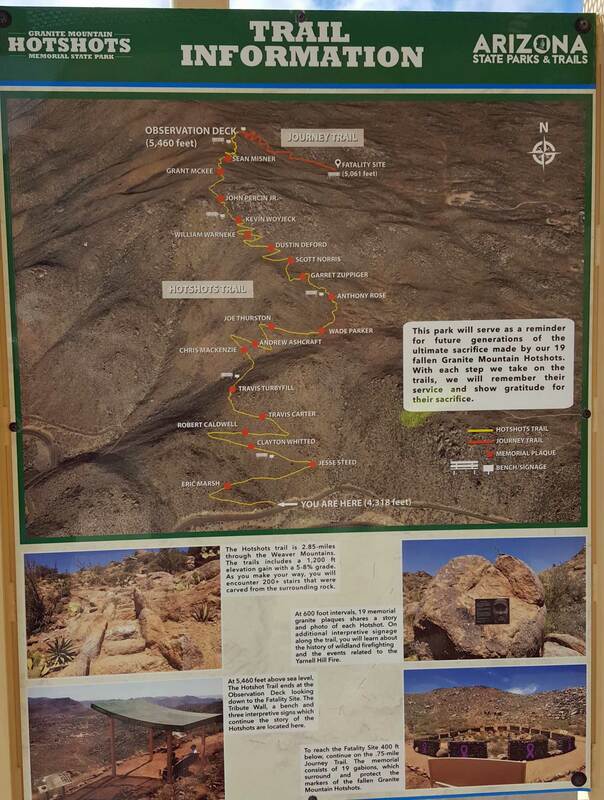 Our journey took us to a high point where we had a 360 degree view of the desert valleys. We also took a wrong turn ending at a dead end. We had to hike the area to learn where we had gone wrong. Click the photo at left to see our dead end location. Click the above photo for another view. We began our adventure on the northeast side of Quartzsite circling a mountain to the north and returning to the northwest side of Quartzsite. 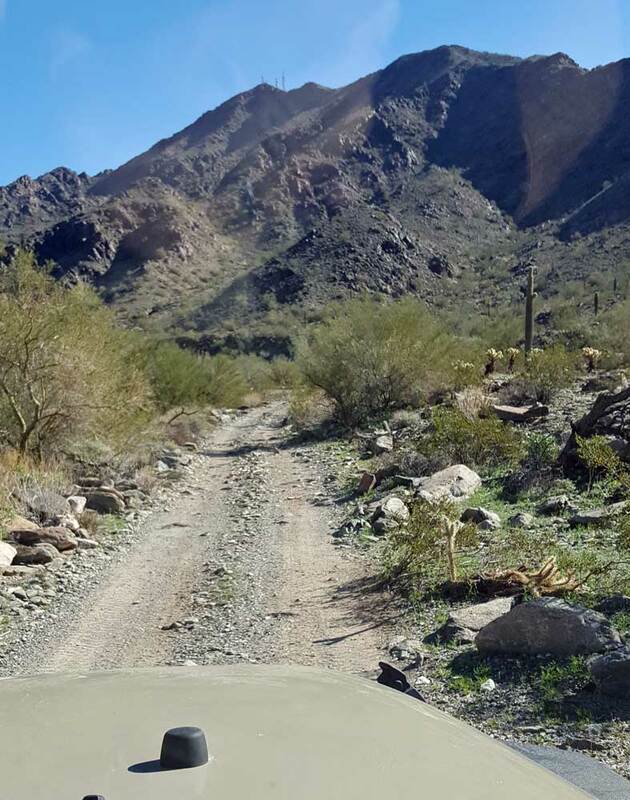 Wednesday, January 2, 2019: Jeanne, Gary, Gwen and I drove to Quartzsite today to get propane plus Jeanne and Gary wanted to visit the local book store looking for off-road map books. Quartzsite has a very interesting and unique bookstore. The owner is also a very talented musician so gives concerns inside the bookstore. The store has thousands of new and used books. Today they were also have an "authors fair" with two authors present to sell and sign their books. Jeanne found a cowboy book written by Stu. She purchased and Stu signed it to her. I asked to take their photo. Stu answered it was possible but Jeanne had to do everything he asked. They stood in the sunlight and Stu said to Jeanne: "Put your left hand behind by back." Jeanne did as told. Then he said, "Put your right hand around my waist." That put Jeanne into this pose and I snapped the photo. Stu was grateful for her cooperation and enjoyed the experience. I hope she enjoys the book as much as she enjoyed Stu. Click the photo to enlarge. Monday, December 31, 2018: I have decided to begin a new project for myself. 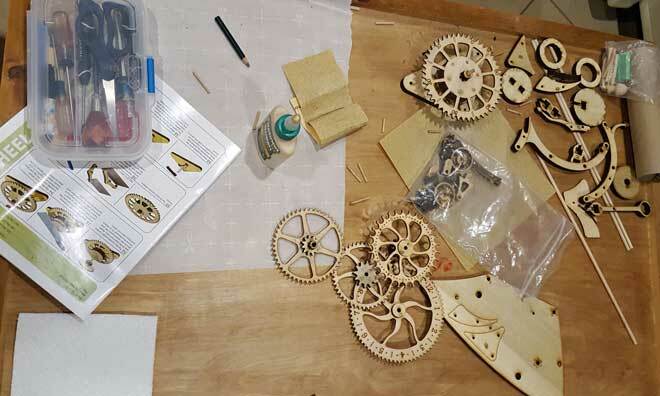 This is another wood clock kit. This is a different brand, made in Canada than the previous clock. This kit lists the difficulty as "expert". There are 145 steps to complete the clock. I still haven't been able to get the first to work but don't have it with me for adjustments. I hope I have better luck with this one. 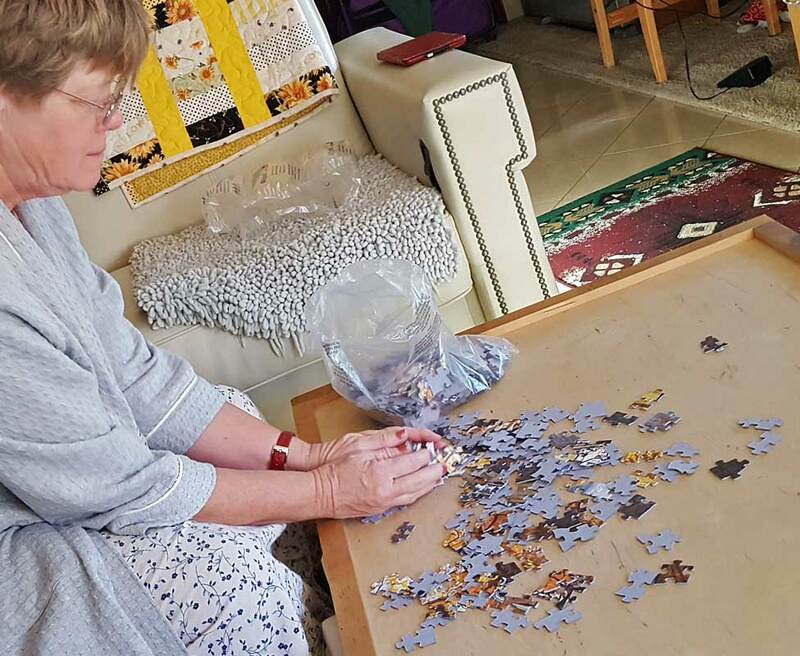 Sunday, December 30, 2018: One of Gwen's favorite hobbies are jigsaw puzzles. This is one of the larger and more complicated because several areas of the puzzle have complicated patterns. I helped only a little, Gwen did the majority of the work. 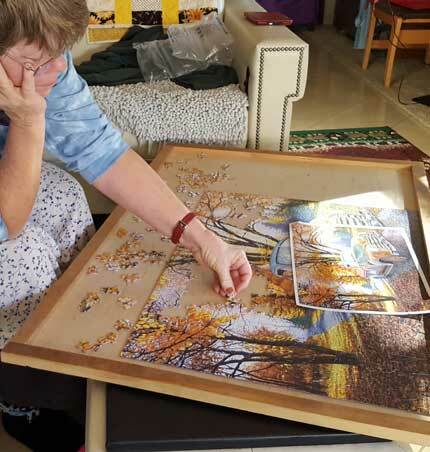 This puzzle only took her two days to complete. 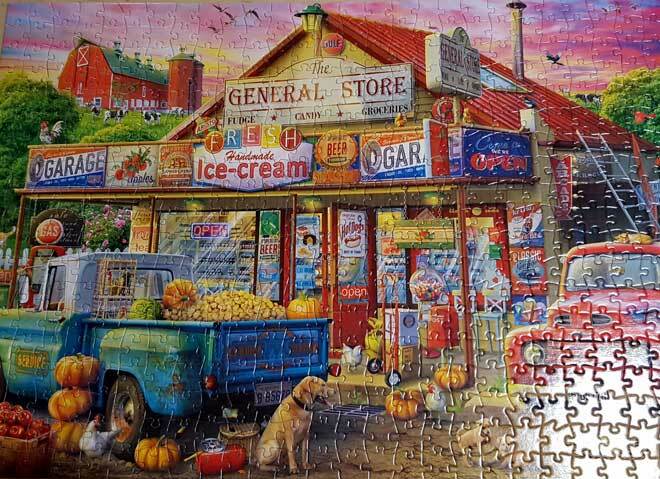 Click the photo to see the completed puzzle. 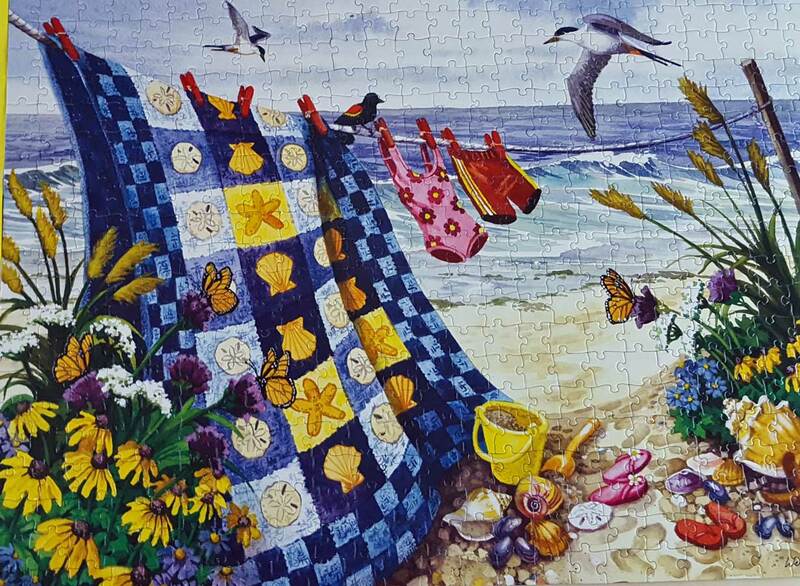 After completing the puzzle she stores it away. 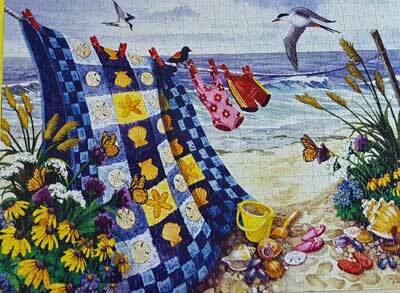 It always confuses me when the puzzle is put away after so much work goes into putting them together. 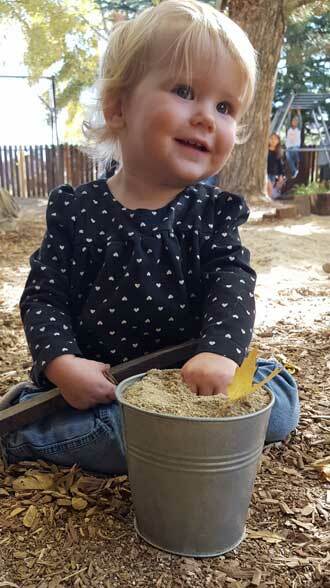 Gwen says, "It's the process which is the fun." Saturday, December 28, 2018: What a fun day in the desert today. 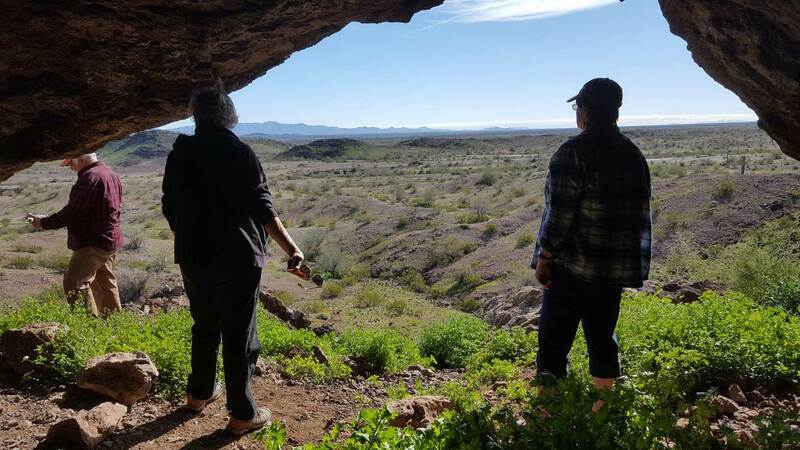 Gary and Jeanne use their Jeep to take us into the desert near Quartzsite looking for Dripping Springs, a small cave where water drips from the roof, "unusual in Arizona". There is also the leftovers of a rock cabin at Dripping Springs. Click ALL the photos for additional views. As it turns out, the "dripping spring" wasn't the best thing about the drive. 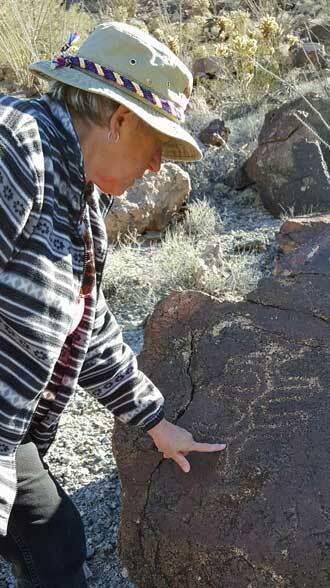 The area is covered with "difficult to find" petroglyphs. You'll find several photos of what we found. 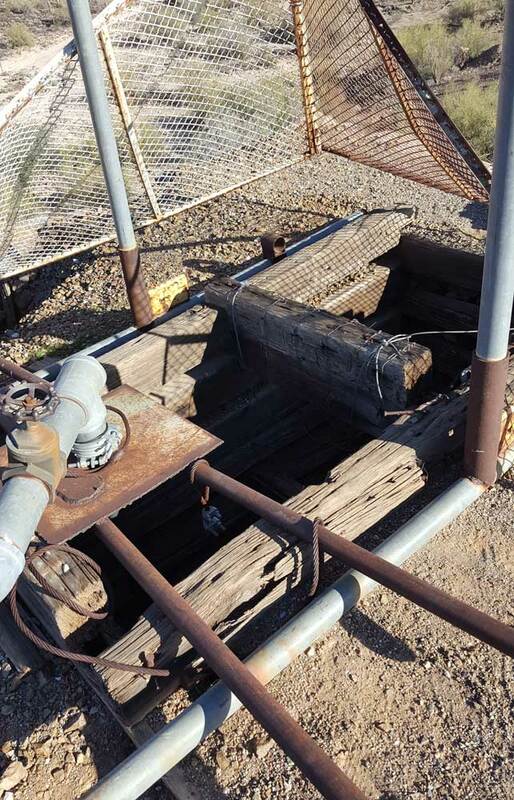 Finally, under the last photo you'll see the vertical shaft of a very deep mine we found on the drive out of the desert. 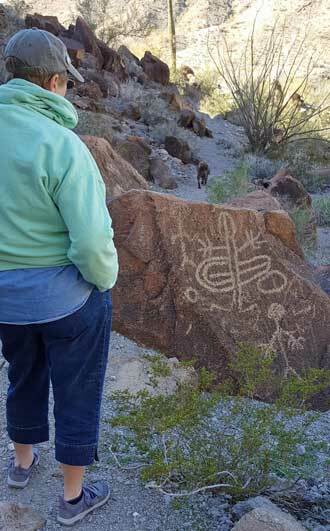 I also made a short video of the serpentine section of the road through a difficult wash.
Wednesday, December 26, 2018: The four of us had several reasons to visit Quartzsite today. After we did what we needed to do we visited one of the best rock shops. 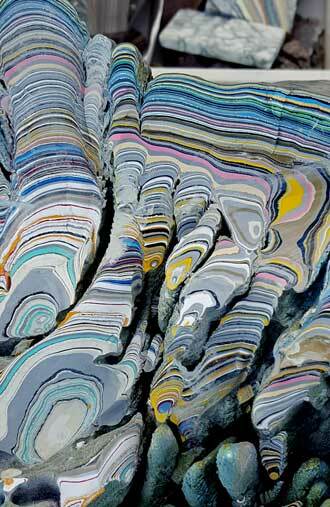 I always refer to Quartzsite as the rock capital of the world. 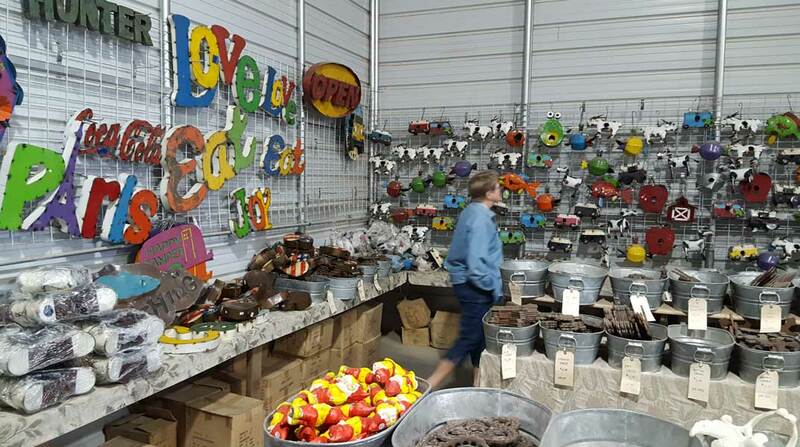 We like this rock shop because it is well organized and has all the rocks clearly labeled and priced. We also like the country identification on the labels. Click both photos for enlargements. Nope, we didn't buy anything but enjoyed looking at all the rocks. 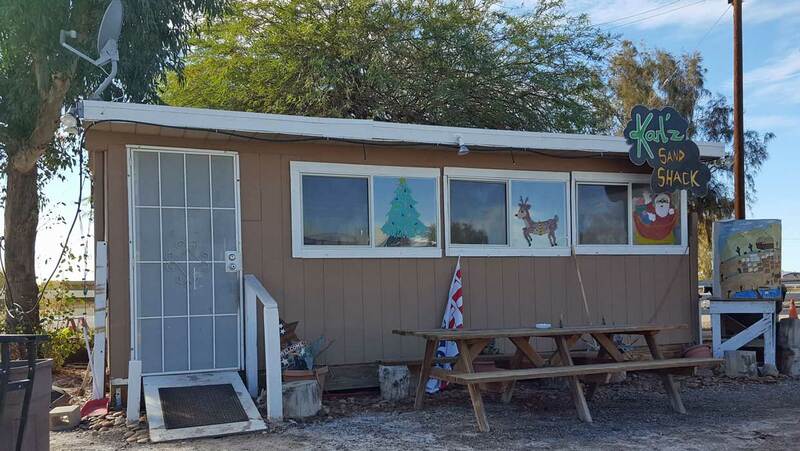 Tuesday, December 25, 2018: A Christmas day tradition at the Arizona Oasis is the Christmas Dinner potluck. Just like the Thanksgiving potluck, all the dishes were very good. The dinner was well attended. After dinner the "secret Santa" stockings were distributed. Mine contained three lottery cards, all worthless, and a WalMart gift card of unknown amount. Click the photo to enlarge. 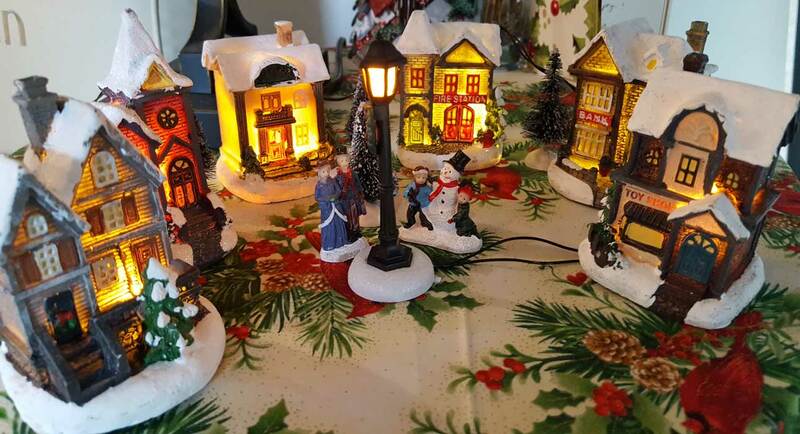 Monday, December 24, 2018: We have created our own little village on the steering wheel table. This is the daytime view with the sun behind the village. Click the photo for a nighttime view. This was a fun project of tiny houses and buildings. I call it a winter project rather than a Christmas project. 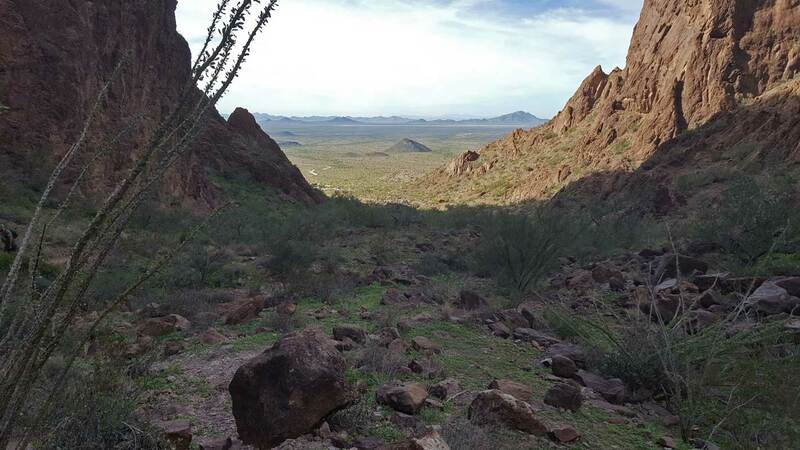 Sunday, December 23, 2018: Another trip into the KOFA National Wildlife Refuge, this time into Queens Canyon. We went for the scenery but were lucky enough to come across four Big Horn Rams on the side of the mountain. As we tried to move closer, the rams would move further away so we had to take photos from a distance. Click all the photos for more views. Behind the photo at the left is a huge rock balanced precariously, you can see through the base of the rock. 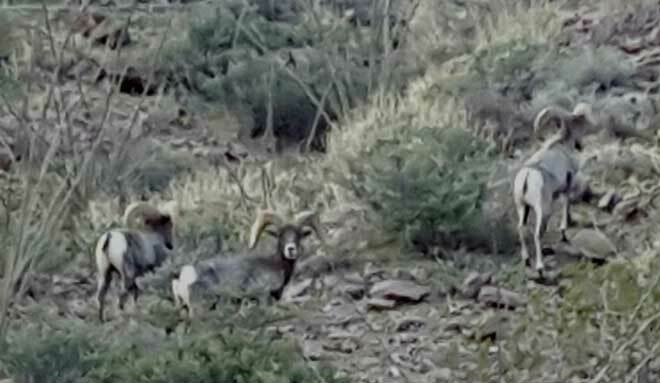 Jeanne took a short video of the Rams with me in the foreground. 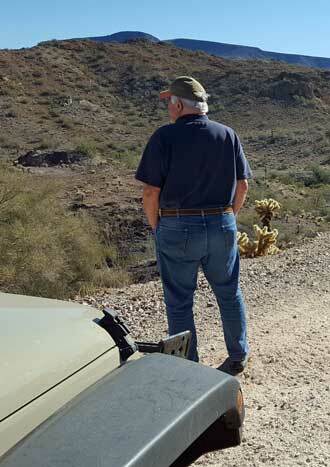 Saturday, December 22, 2018: Gary, Jeanne, Gwen and I take a drive into the KOFA Wildlife Refuge to view the Palm Canyon. That requires a hike into the canyon to see the Palm trees. It is unusual for Palm trees to grow in this desert but a side canyon in our hiking canyon has just the right amount of light, temperature and water to create the perfect conditions for these Palm trees. 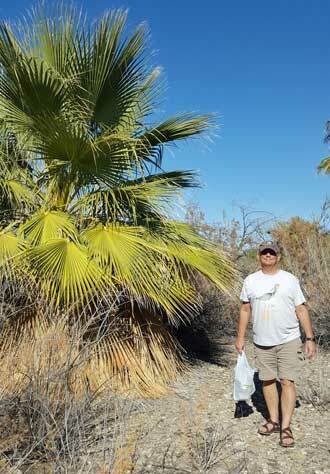 It take about an hour to hike 1,000 feet in elevation and about two miles into the canyon before we see any Palm trees. This is a popular hike so many other hikers were on the trail. Click on all the photos then click again to enlarge and scroll right and left to view the entire view. The views of the valley from the canyon were incredible. This was a perfect weather day with temperatures in high 60s. Friday, December 21, 2018: Gwen talked me into playing "card bingo" in the clubhouse this evening. 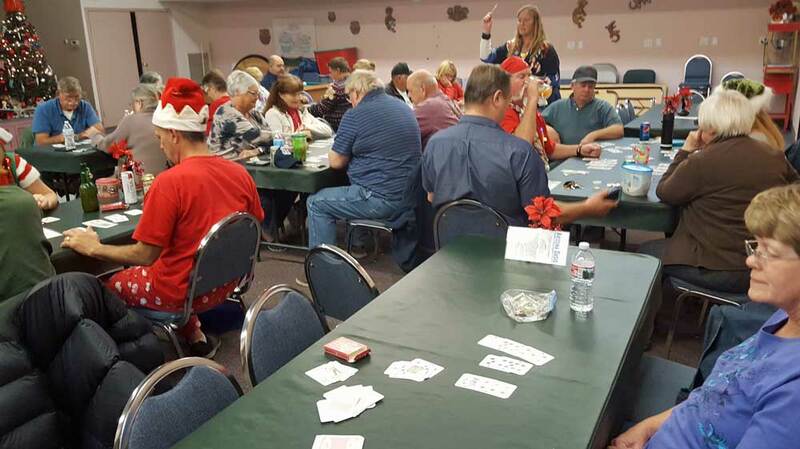 Card bingo is played with regular playing cards. A single deck is divided among four players then an announcer calls cards from a second deck. The first player which eliminates all of their cards has reached "bingo". We played a dozen rounds and didn't come close to winning. There were about 35 attending tonight. 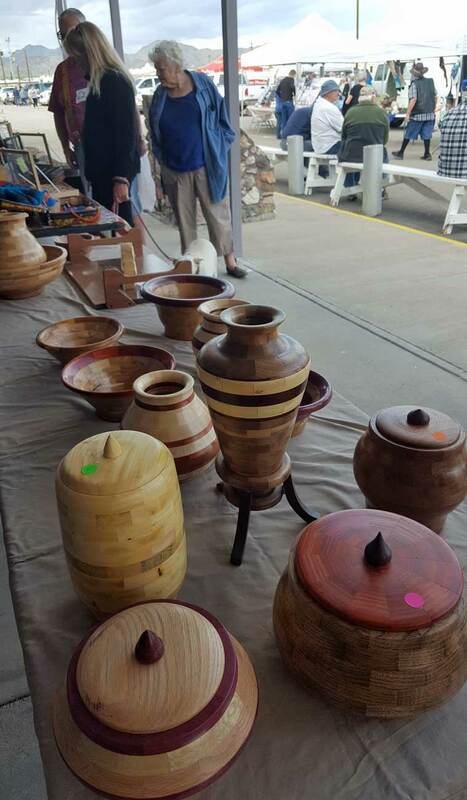 The largest pot was $1 per person so $35. 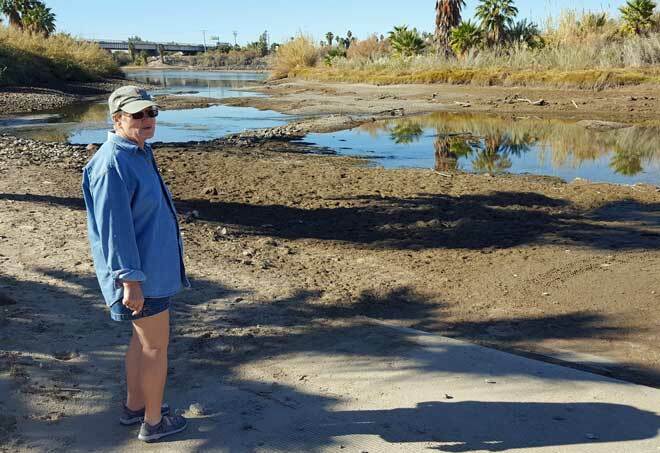 Wednesday, December 19, 2018: On our walk today we discovered the Colorado River water level to be so low we could walk to "Adventure Island". We came across a summer camp and a short trail. We were able to walk around the island. I was disappointed to find a lot of trash left by boaters so you see the bag in my hand. I filled that bag to overflowing with trash and hauled it off the island. Click the photos for more view. Monday, December 17, 2018: We had to try again to find the Snow Geese. We are back to the Cibola National Wildlife Refuge and this time take the trail to the lake looking for the Snow Geese. We found them at a distance. Click the photos to see them. Notice they are surrounded by Canada Geese but the two species are not intermixed. I made a short video of the sound they were making. The Snow Geese are too far to see anything but a white mass on the water. However, it was enjoyable to stand and listen to them talking. 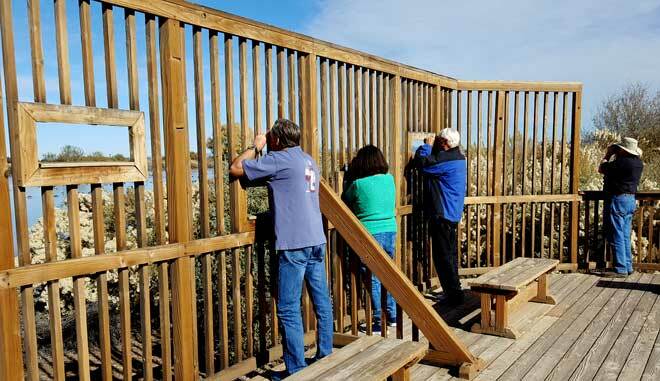 The refuge made a nice trail and observation platform. We figured the vertical blind confused the geese enough they did not notice us. Unfortunately we did not see any Bobcats and it's too cold for rattlesnakes. Sunday, December 16, 2018: We are in the middle of the desert but surrounded by agriculture. 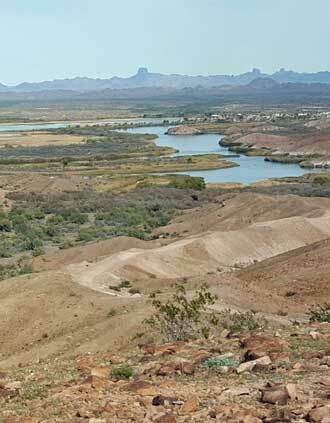 Apparently there is enough water in the Colorado River to supply all the farmers with water for their fields. 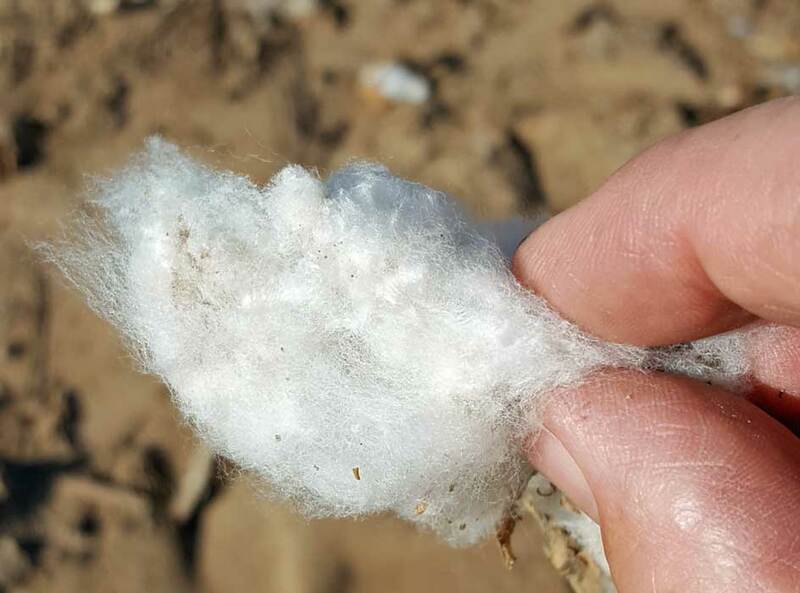 The majority of the crops are Alfalfa and Cotton. Today we went looking for agriculture. We wanted to learn how tight these cotton bales were wrapped so we all had to poke the bale with a finger. Click the photo for a close-up of a cotton bud. This is what a cotton field looks like. The field has been harvested once (the cotton in the bales) and the harvest machine will make a second pass to get what is left. Saturday, December 15, 2018: Gary, Jeanne, Gwen and I took a drive to the Cibola National Wildlife Refuge which is down river on the Colorado about 20 miles. We wanted to see some birds, especially the Snow Geese but we saw NO Snow Geese. 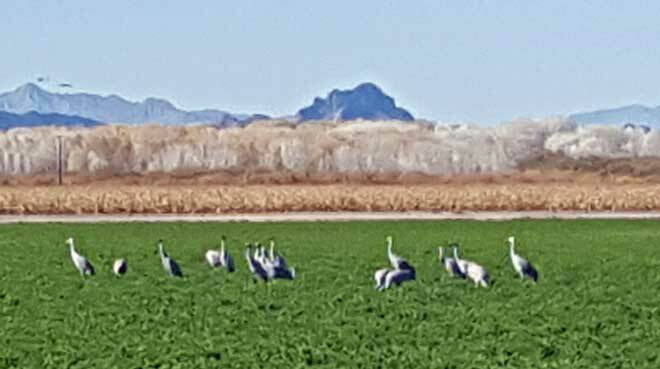 We DID see the Sandhill Cranes, a whole lot of them. The fuzzy photo above was the best I could do with my phone camera. 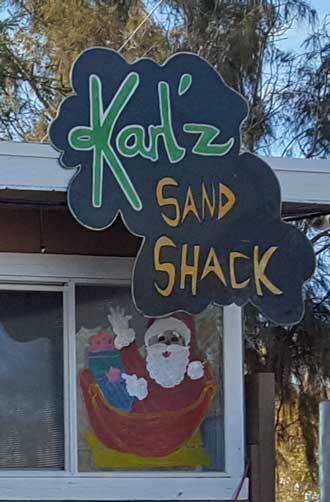 We stopped in the tiny village of Cibola for lunch at Karl'z Sand Shack, they actually have their own Facebook page. The hamburgers where good. After lunch we found an historic second home built in 1910. Not much left of it but an interesting story about this cabin. We finally arrived at Cibola Lake hoping for the Snow Geese but no such luck. Click all the photos for more views. Friday, December 14, 2018: My friend Gary has a Carefree brand awning which needs a motor change. Since I had just watched the repair men replace the motor on the Dolphin I thought I might be able to help. But the Dolphin has a Dometic Awning brand so different from Gary's Carefree. Gary already has the new motor. The only help I actually provided was a second ladder. Gary knew exactly how to change the motor. I watched every step because Mz Ruby has a Carefree Awning so I may have to do this myself one day. It took Gary only thirty minutes to make the change. It cost him considerable less than the repair on the Dolphin since Gary only paid for parts. 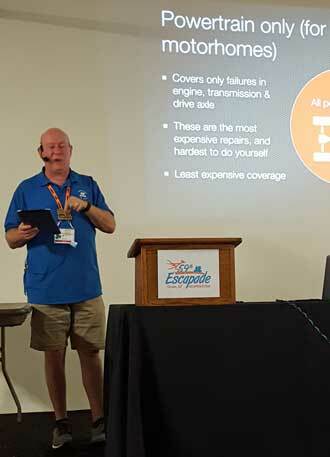 I was able to get my repair done using the warranty I purchased with Miss Dory so I only had to pay my deductible which was less than half the cost of the motor alone. Thanks Gary for the lesson. Click the photo for a wider view. Wednesday, December 12, 2018: Much happened today but the day ended with spaghetti in the clubhouse as a fundraiser for the seventh and eighth grade class at the small Ehrenberg Elementary School. The class served the spaghetti then put on a play about Arthur's search for a special gift for Santa. The whole class was involved which also included a musical. Our friends Jeanne and Gary joined us at the presentation. Click the photo for a scene from the play. 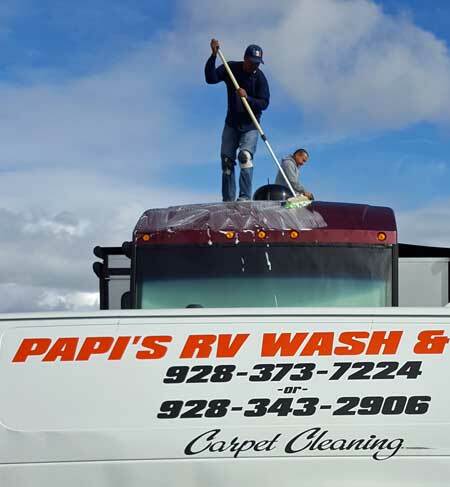 Tuesday, December 11, 2018: Arizona Oasis has hire these folks to help reduce the dust which has plagued us since coming here in October. These folks are spreading a white liquid on the roads. It was explained to me that the liquid was like "Elmer's Glue". They are planning several layers of the white liquid which will "glue the dust" so no more dust storms every time a car drives by. We all hope it works. Click the photo for another view. 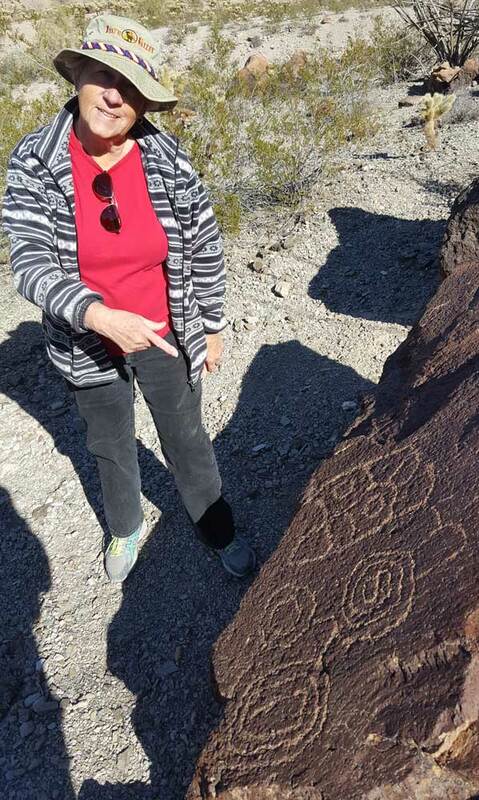 Saturday, December 8, 2018: Gwen and I take a drive into the desert looking for the desert route to Quartzsite. We found a desert route but not the route we were looking for. 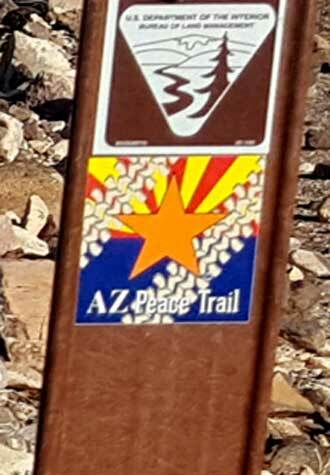 We ended up on the Arizona Peace Trail for a few miles then onto the Cibola Road toward the east. 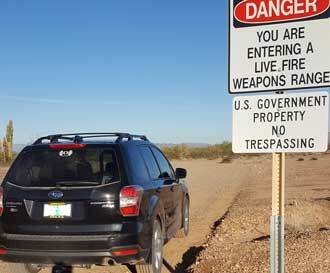 The road ends up going through the Yuma Proving Grounds a US Army testing area. It was exciting but our Forester never resorted to four wheel drive, a disappointment. Click each photo for another view. 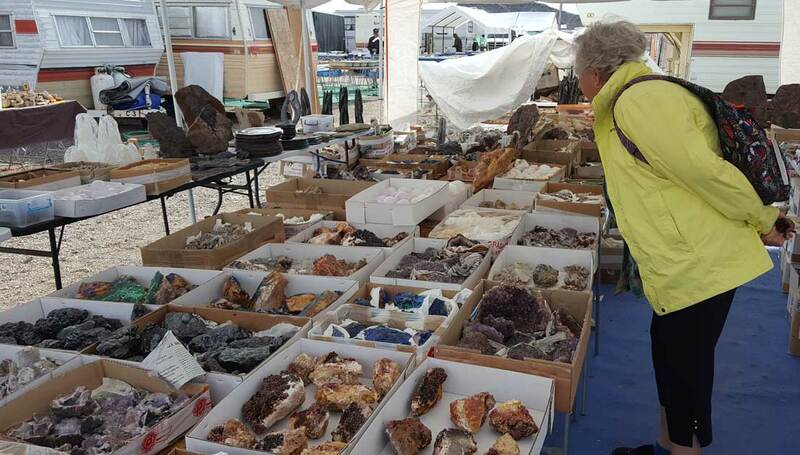 Friday, December 7, 2018: Quartzsite, Arizona in the winter is basically a town full of flea market booths and other mobile vendors. 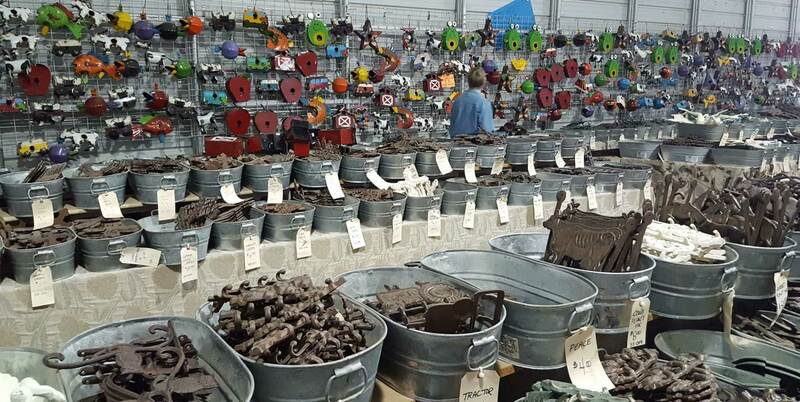 One of the best is this store which moves a huge inventory of metal sculptures and cast iron decor. 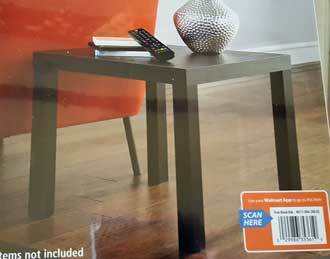 The items are priced for quick sales. 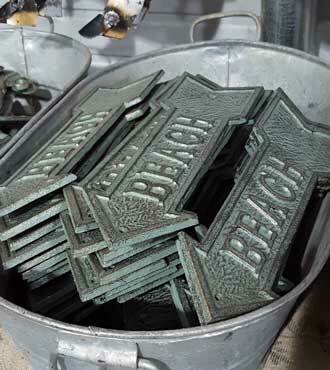 It is fun to walk through and imagine how these items would look elsewhere. In fact, I have two children who just moved into their new homes. I believe I will make a second trip and pick some unique items for them. 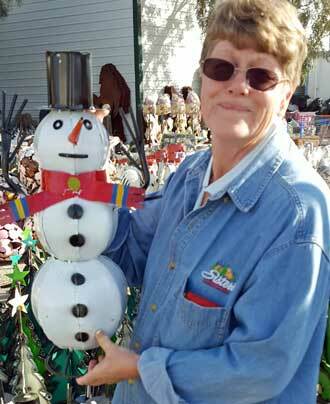 Gwen enjoyed shopping around and picked out a snowman made especially for Arizona (out of metal). Click all the photos for more views. Thursday, December 6, 2018: Several months ago when making plans for our winter in Ehrenberg I imagined having enough time to assemble some wood kits. I did not imagine finding Mz Ruby and that taking so much of my time. Today I picked the smallest of the wood kits and assembled it. 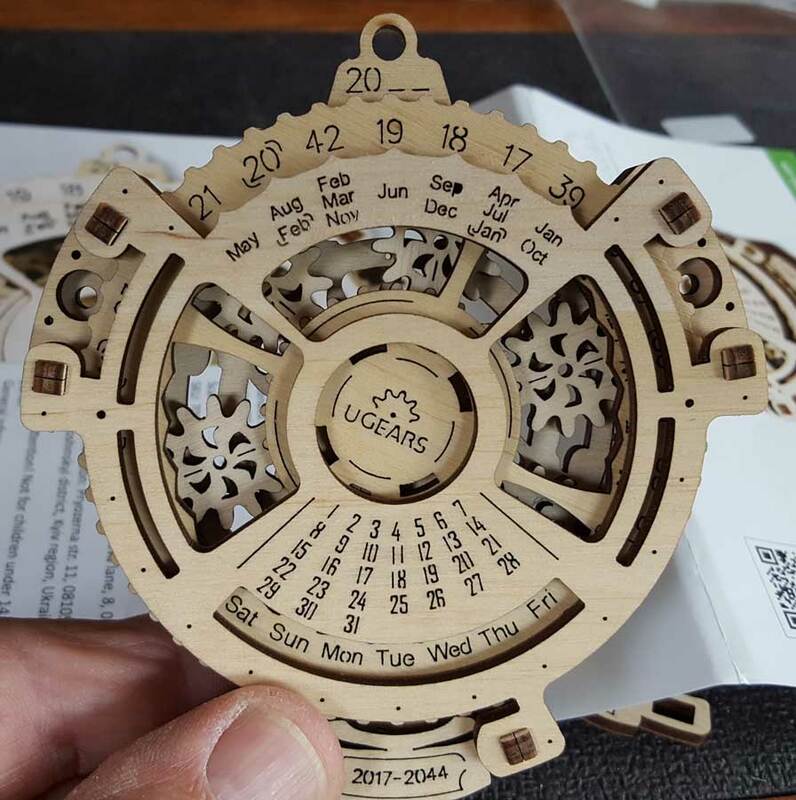 It is a "Date Navigator" from 2017 - 2044. Match the day and year then the navigator will tell you what day of the week that day is on. Click the photo to see the navigator set to 2018 during the month of "Dec". You can check the days for the month. 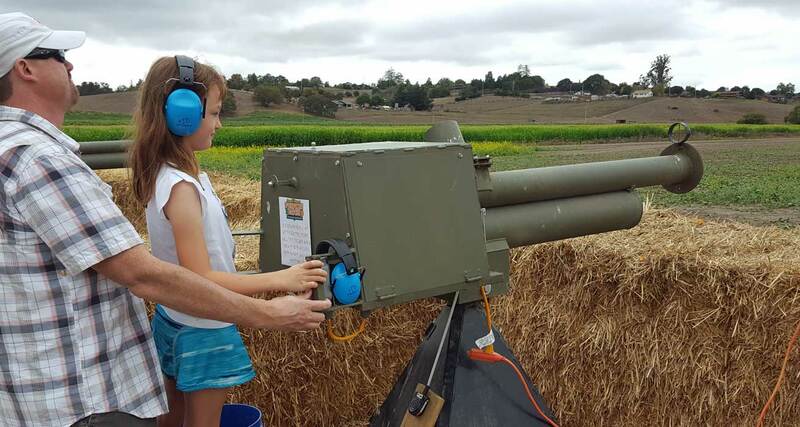 My oldest granddaughter, Chloe, might be old enough to have fun with this. 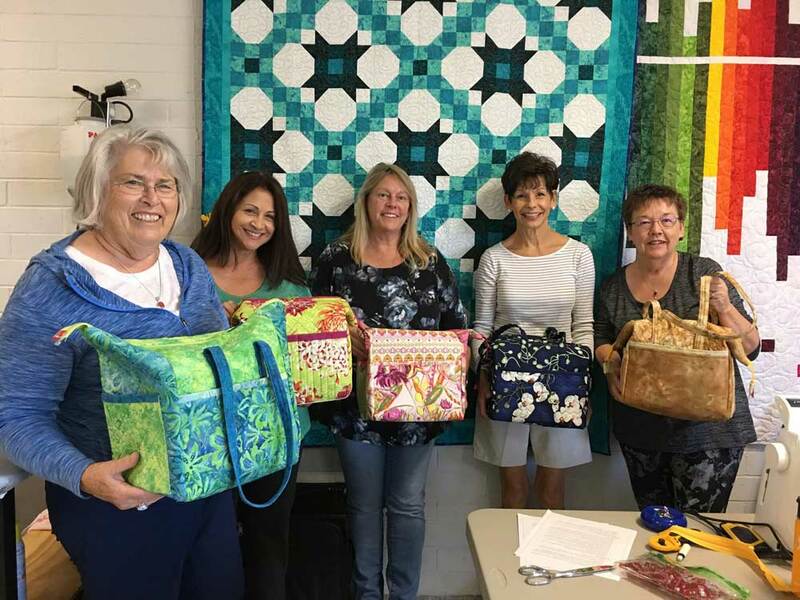 Wednesday, December 5, 2018: There is a quilt fabric company who visits the area one day each month. 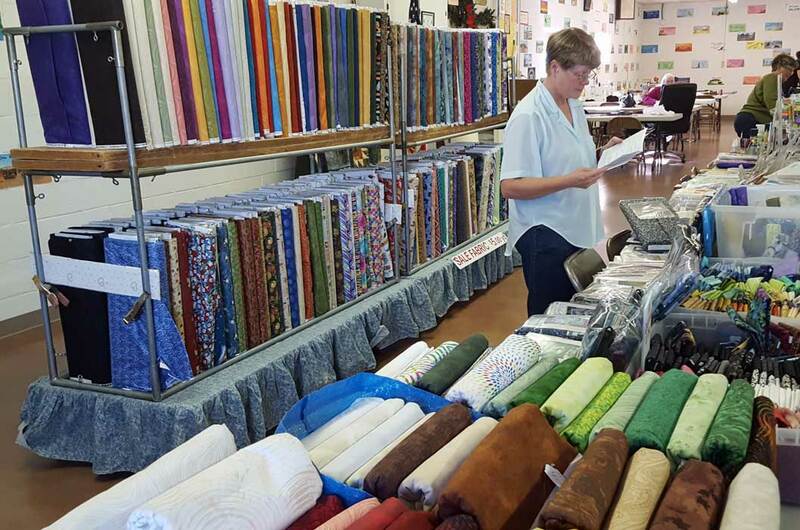 On the first Wednesday of the month the fabric company visits the Bouse Booster Club in Bouse, Arizona. We both wanted some fabric to change the headboard in Mz Ruby so off to Bouse we drove. I wanted to visit Bouse anyway to look at our potential boondock locations. We couldn't agree on the fabric pattern but compromised on something we could both live with. After the fabric we drove to the area purchased by the state of Arizona for a State Park and learned it had not been developed yet. Then we drove to our favorite boondock location and others had not discovered it yet. We are getting "hitch itch" badly and making choices to leave this resort early. The Arizona Oasis has a friendly staff, swimming pool, hot tub and a club house. We have taken advantage of the activities. The Thanksgiving noise and crowd was annoying. The road in front of Mz Ruby is gravel and sand which puts a new coat of dust onto our car and Mz Ruby. We parked in the desert for more than two months last year and did not experience dust the way we experience it here. We expect the Christmas season to be like Thanksgiving so we are planning to leave early just not sure about the timing yet. Click the photos for more views. Saturday, December 1, 2018: Gwen treated herself to a manicure then we went shopping for a rug for Mz Ruby. We've already visited at least a dozen stores and we found nothing. I thought we might have a chance with the Yuma Swap meet but no luck there either. 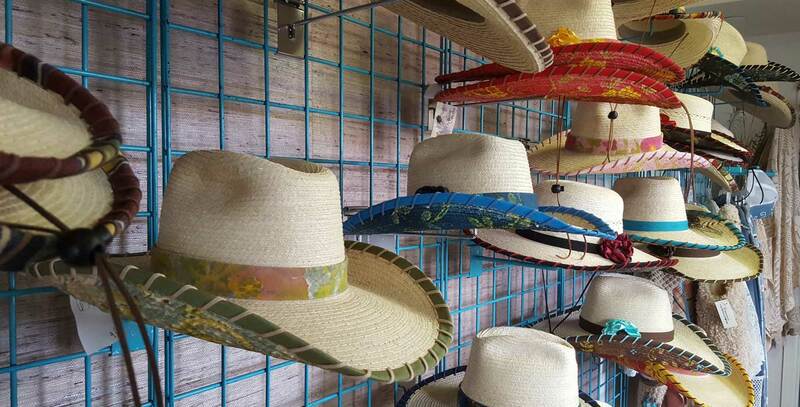 We decided that this swap meet makes Algodones Mexico look good. My favorite booth, however, was the bird booth. 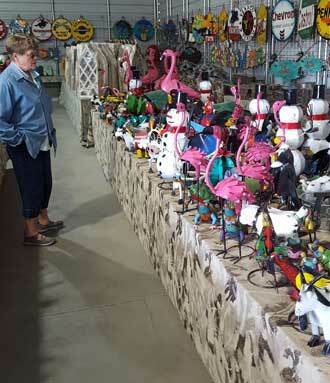 Lots of pretty birds and bird supplies to choose from. 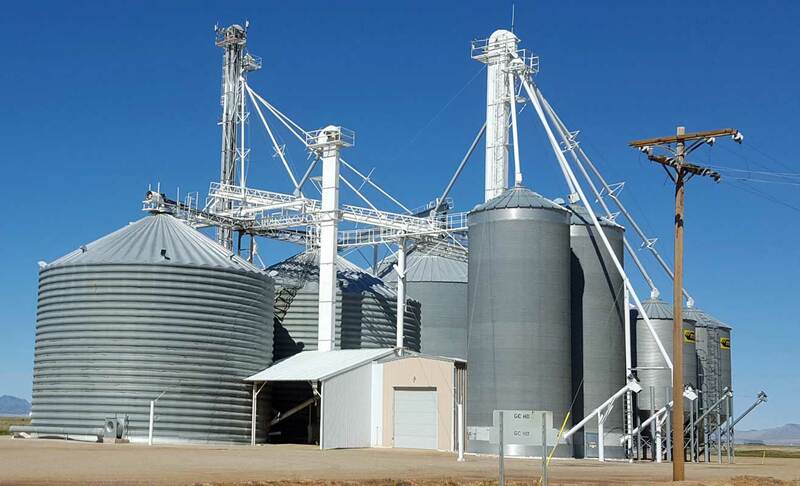 Click the photo above to see a panorama of one of the swap rows. Monday, November 26, 2018: Just across the street from our resort is the Ehrenberg Pioneer Cemetery. There may be 50 graves here but only 10% are marked with any sort of name or notice. In fact there is a large marker to the "unknown" pioneer which is nine of ten graves in this cemetery. Click the photo to see a panorama of the cemetery. 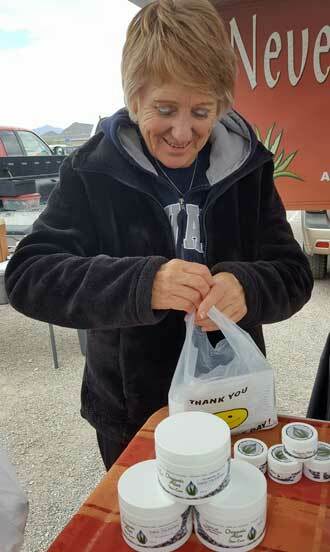 Saturday, November 24, 2018: We started the day at a craft show in Quartzsite. While Gwen is shopping the craft show, I'm looking for a few little parts I need for the solar installation. About noon we start for Parker, the nearest movie theater. Gwen was anxious to see this movie. If you want a positive review, you'll have to talk with Gwen. I enjoyed the accents. Lots of big-name actors in this movie. Not sure who the target audience would be. It was far too complicated for children. Most of those in the audience were our age but I didn't find it interesting (but talk to Gwen). Maybe the next movie will be MY choice (like the last movie, Bohemian Rhapsody). Thursday, November 22, 2018: Happy Thanksgiving everyone. 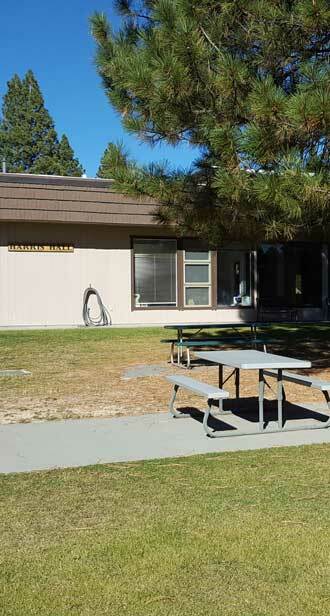 We enjoyed our Thanksgiving in the Arizona Oasis RV Park clubhouse. The activity director, Joan, did a great job of organizing her team and getting participation from the campers in the park. Click the photo to see the table. Wednesday, November 21, 2018: While I worked today on organizing the basement storage and throwing away the items we no longer need, Gwen is working on her project. 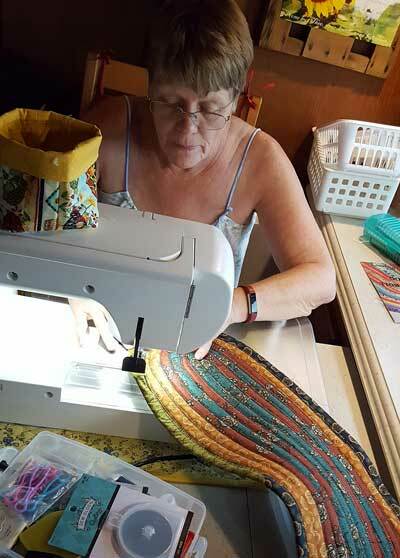 I asked what she was making, responded, "a rug for HER bathroom". Mz Ruby has two "bathrooms". One room is the shower with sink while the other room is a commode with sink. Gwen identified the shower room as HER room so that is the room her handmade rug will go. It looks nice. Note: it is Gwen's bathroom where the solar charge controller will be in the medicine cabinet, just say'n. Saturday, November 17, 2018: Gwen and I joined a small group of hikers from the resort to hike the Buckskin Mountain State Park. 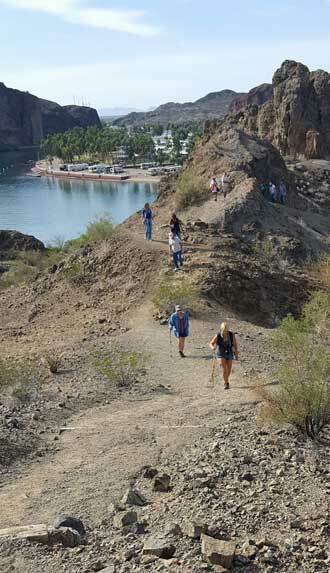 The park borders the Colorado River about an hour from the resort. The park is north of the Parker dam so the water in the colorado has no current with lots of boat traffic enjoying the calm water. 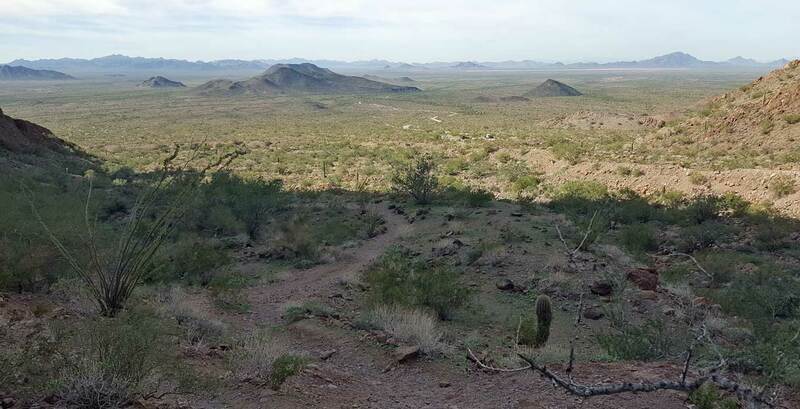 The hiking trails are cut out of the solid rock in the area and only 2 mile long but the rough terrain and the steepness of the trails make this a tough hike. The trails are marked with signs identifying the native plants. After the hike, we had a picnic lunch with the group. Click on all the photos for panorama views and additional photos. Friday, November 16, 2018: Gwen and I took a drive down the Colorado River today. It was our first drive looking at the scenery near the Arizona Oasis Resort and further down the Colorado. About six miles down the gravel road we came across a "BLM Camp Location" (a wide spot in the road). Next to the camp was a ramp onto a narrow lake which would be perfect for kayaking without a current. 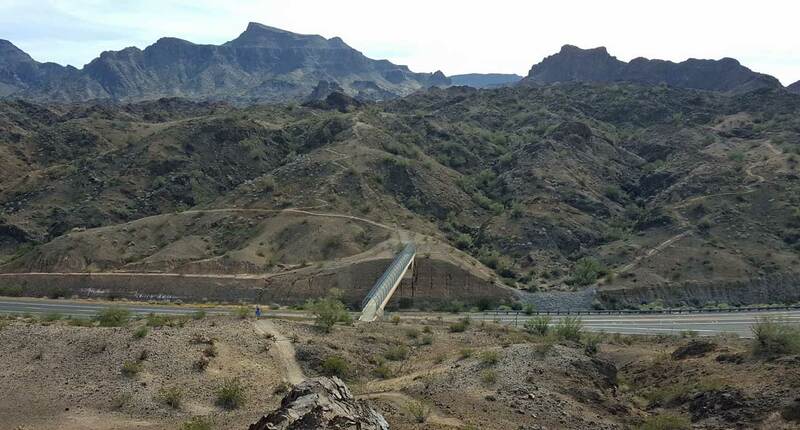 The road runs between the lake and the Colorado River. This will be a nice place for an easy paddle. We finished our tour by crossing the river further on down river and returned to Blythe to wash the gravel dust off the car. Monday, November 12, 2018: All day with Miss Dory. She is good enough for exterior photos and ready for interior cleaning then photos. 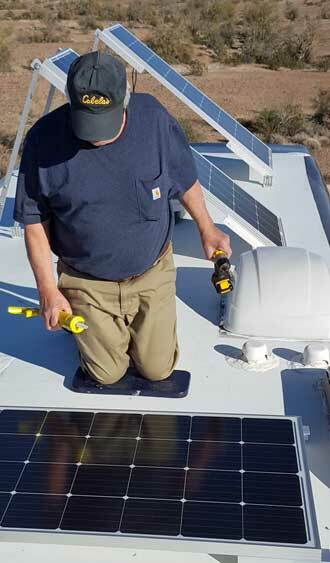 I began the removal of the solar charging system but it was too windy to attempt panel removal. 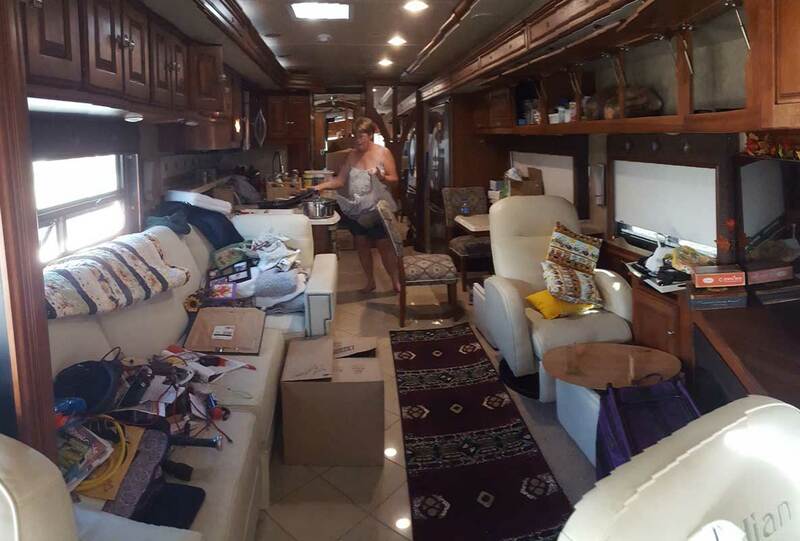 She is listed with RVTrader.com which I like better than all the other online RV sales locations. I also listed her with RVT.com but don't like it nearly as well. This is a far better motorhome than when we purchased it. I say that because it has new tires, new LED TV, over $1000 in suspension upgrades, new King Tailgater automatic satellite dish, new faucets and upgraded refrigerator components. Sunday, November 11, 2018: Gwen and I drove to Parker today specifically to see the movie Bohemian Rhapsody. This movie is about the Rock music group Queen performing in the 70's and early 80's and the composer of some incredible music. After being a "good listener" during my college years in the late 60s I was musically unconscious during the 70s so I missed most of Queen. After seeing the movie, I am a fan. They created some unbelievable music. 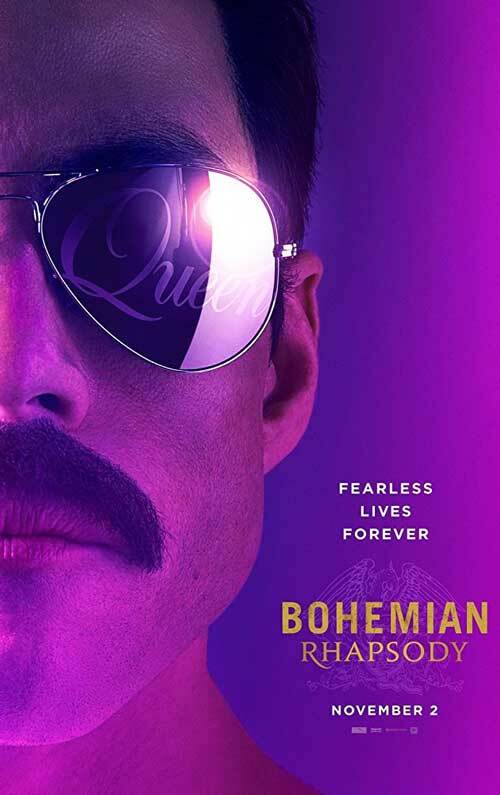 The movie is also about Freddie Mercury, the lead singer of Queen. It seems most great musicians have some sort of tragic flaw and this movie shows how it develops. Saturday, November 3, 2018: We are back at the Arizona Oasis in Ehrenberg. There is still much to do to get Mz Ruby exactly the way we like it. Yesterday before starting the transfer, I took Mz Ruby to the weigh scale nearby. The best way to know the CCC (Cargo Carry Capacity) is to weigh the empty rig. Yes, the factory puts a label inside but that doesn't include any permanent items the owner adds. Click the photo to see the weight report. The maximum weight allowed is 37,300 lbs so I will have the most cargo capacity of any unit I've ever owned. Additionally, I can tow 10,000 lbs, the Forester only weighs 3,600 lbs so she hardly knows it is back there. Friday, November 2, 2018: I'm showing how a longer wheel base and air suspension help to make Mz Ruby easy to drive. You can't let go of the steering wheel in a crosswind but with no crosswind, she's straight down the road. Click this photo for a view of the southern desert. This is moving day from Miss Dory to Mz Ruby. I was going to put a plank between the two but changed my mind. It was a HOT day. After most everything was moved, I checked my Fitbit, 14,000 steps just between the two rigs. Gwen and I were exhausted. Click the photo for an interior view. Thursday, November 1, 2018: After of long day of driving and a trip to Costco I steer Mz Ruby into the desert for a night of boondocking. She immediately began to squeal when I left the asphalt. "There is NO ROAD out here, where are you taking me?" she yelled. "Where is my "comfort post" where I can get power and connect my hoses?" "Wait! I'm all alone out here! It will be dark soon, there is NO LIGHT!" "Don't worry Mz Ruby," I said, "We will be with you all night, you will learn to love this!" Mz Ruby has six AGM batteries but only one 100 watt solar panel, that will be fixed soon. She also has all LED interior lighting so she's nearly ready for off grid parking. We should be arriving with batteries fully charged after driving all day but the voltage was lower than I expected. Maybe because the power was going to the residential refrigerator. I need to learn how to manage that power drain. There will be a learning curve for both of us. Click this photo to see a sunrise onto Mz Ruby. Wednesday, October 31, 2018: This was our first travel day with Mz Ruby. We left Las Cruces, New Mexico for Willcox, Arizona this morning. Most of the trip was driving into a strong headwind/crosswind. 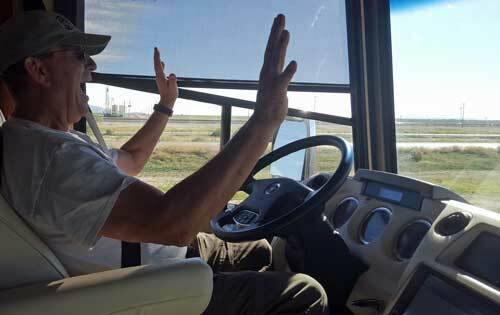 There are some differences in driving a gas 34 foot motorhome compared to a 40 foot diesel pusher. The much longer wheelbase gave a better ride and the diesel had better power even though it weighed 7,000 lbs more today. 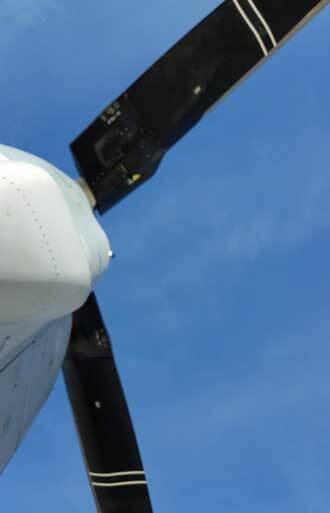 The air brakes did well to hold her back when needed. The turning radius is not what I experience with Miss Dory. Mz Ruby takes more space which makes sense because of the longer wheel base. The speed limit was 75 but I drove at 65 on cruse control. At the end of the day I made one adjustment with the tow bar but everything else was fine. We stopped at the Willcox Arizona Elks Club. They have a very nice RV park. It is so nice I could imagine staying here to see the Chiricahua National Monument. Saturday, October 27, 2018: Working today to get ready for a "road trip" without Miss Dory. It has to do with our search for a Miss Dory replacement. 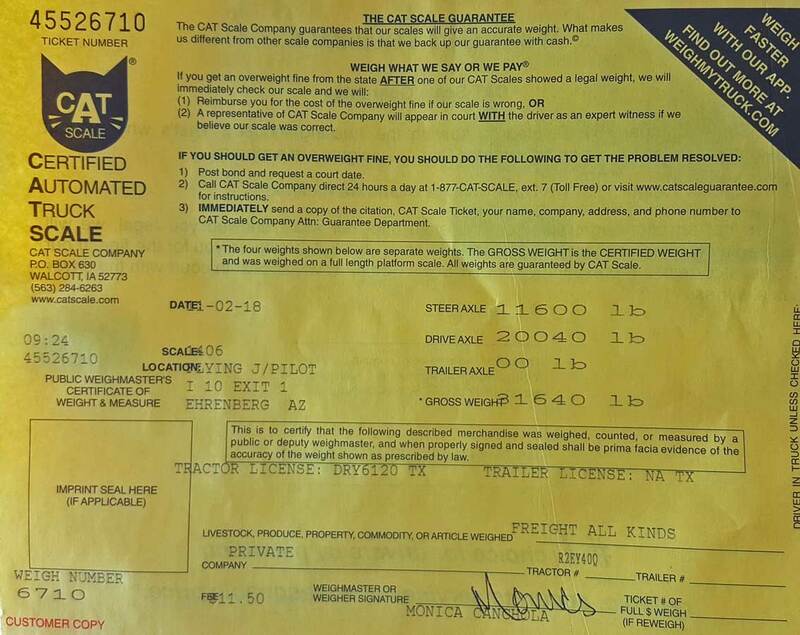 We think we have a deal on the exact rig we have been looking for but I don't believe anything until we have the key and ownership papers in my hands. Getting ready means doing the laundry. For the first time I experience the park laundry control by an APP on my smart phone. I selected the washer and dryer using my phone. Paid using my phone and once paid, the phone began a count down of time so I would know when to pick up the laundry. 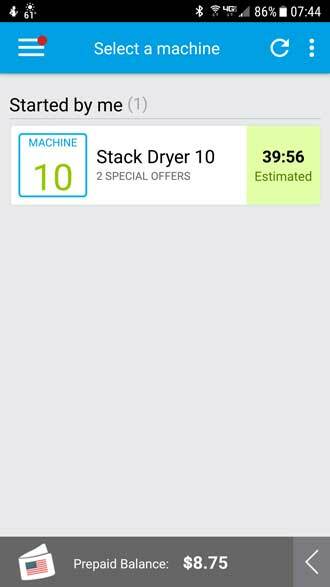 I love technology and this APP made doing the laundry more convenient. 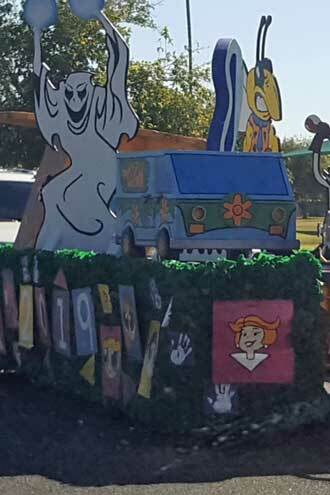 The float on the right is representing homecoming night at Blythe, California high school, only 5 miles from our resort. We were in Blythe looking for empty boxes to help us move from Miss Dory expecting to end up with a new motorhome next week. Friday, October 26, 2018: Our first full day at the Arizona Oasis Resort. This park is very affordable even if you don't have a $500 gift certificate. 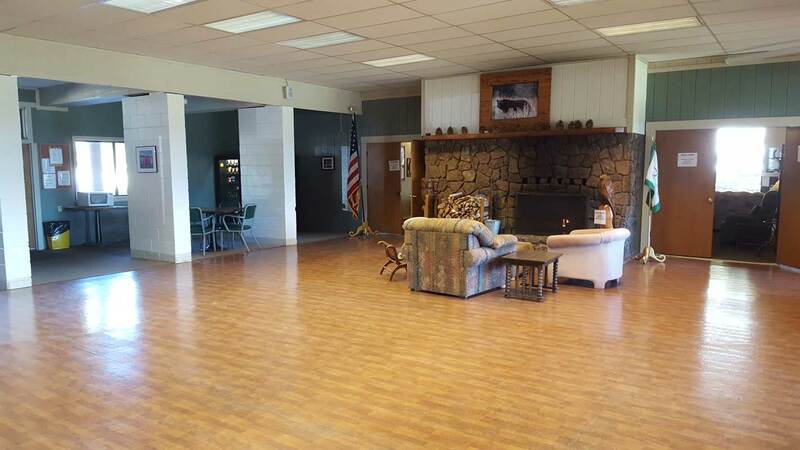 It has easy access to the Colorado River, activity center, clubhouse, pool, hot tub, exchange library, lots of jigsaw puzzles and organized parties. And, of course, it has all the power and water you can use plus an easy sewer hookup. With all this, Gwen and I did some serious thinking about coming here because we virtually never spend our winter like this and in a location like this. The sites here are extra large so our nearest neighbor is 20 feet away. Our view from the windshield is above. Last year we parked in the desert for most of the winter. Our nearest neighbor last year was about 400 yards. Click the photo above to see and compare this year to last year's view. I hope you can understand why our decision was so difficult. The WHOLE story of last winter is here. Scroll up from September 14. 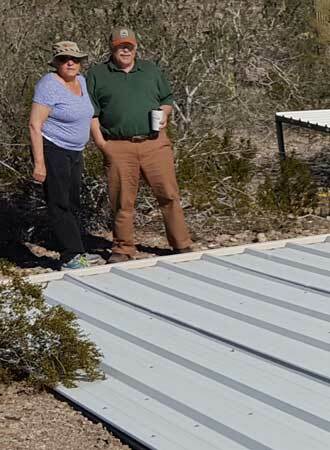 Thursday, October 25, 2018: After completing errands in Lake Havasu City we drove to Brenda, Arizona to a mobile RV mechanic for a final word on the problem of the awning working intermittently. After the diagnosis, the mechanic will contact our warranty company for payment of the repair. 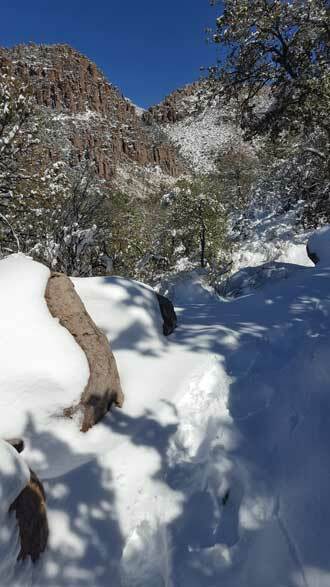 Then, only a 30 minute drive to Ehrenberg, Arizona and our winter resort for 3 months. I won a $500 gift certificate last January and we decided to use it this winter at the resort. We seem to have a nice location with a tree to block the afternoon shade and on a space which put the shade on the door side of the motorhome. 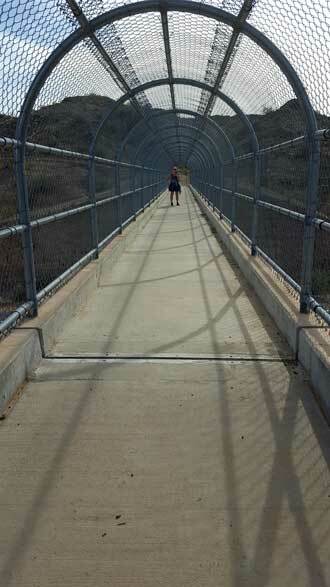 Our walk to the Colorado River is about 200 yards and the walk to the pool and hot tub is only 100 yards. 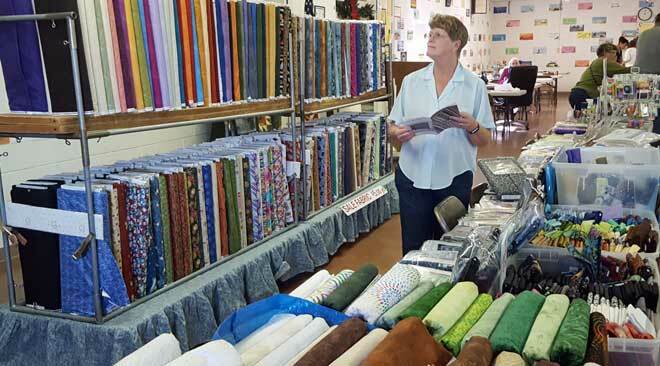 Wednesday, October 24, 2018: Before leaving Lake Havasu City we must go to the quilt stores in this town. This store was the best and these ladies wanted to show off their most recent projects. Gwen was thrilled. Tuesday, October 23, 2018: Three years ago we did a lot of research and came up with our first Class A motorhome, Miss Dory. For the last three months we have begun the research again to replace Miss Dory. Whoever gets Miss Dory will get a gem, not only because she is in such good condition but because of all the upgrades we have done to her. I wrote an good article on RV research and purchase before buying Miss Dory. After reading this, scroll up on that page to December 14 to complete the article. We are replacing her, not because she has problems, we've had no problems. In fact we paid BIG bucks for a four year warranty and have not used a penny (makes me wonder about a warranty for any future motorhome). 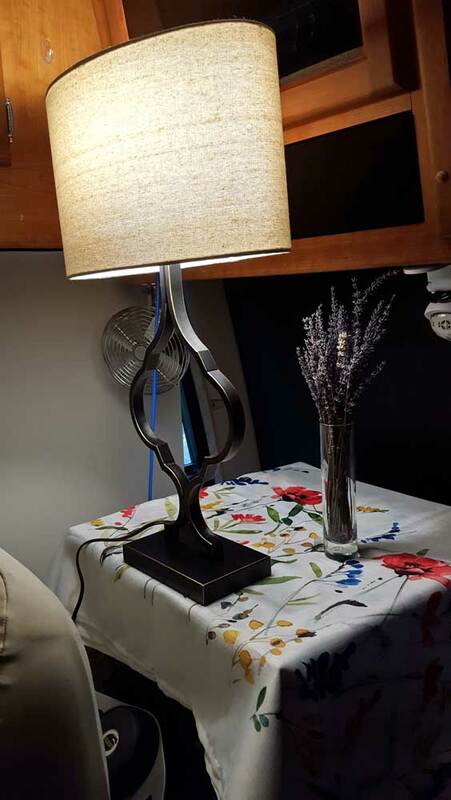 We are looking for a motorhome with a dedicated space for Gwen's sewing center, opposing slides (a slide on each side to make the room wider), a stacking washer and dryer (not a combo washer-dryer, ask anyone who tries to sell you a combo: "how do you clean the lint created from the dryer?" The answer is, you must pull the unit away from the wall and take it apart to get at the internal vent hose to manually clear that hose.) We are also wanting a residential refrigerator (and we are assuming I can solve the problem of creating enough solar battery charging to power the refrigerator when off grid). We are also looking only at diesel pusher's for a quieter ride, more power and much longer engine life (having said that, we realize a diesel has a much higher maintenance cost). Gwen wants a tile floor, no carpet. The Winnebago at the right is a 2013 Journey 36M from a private seller asking $150,000. This model is one our research says is perfect for us. Today was our first time to physically walk into one. It has a "full wall slide" plus two slides on the other side. It meets all our desires except one. 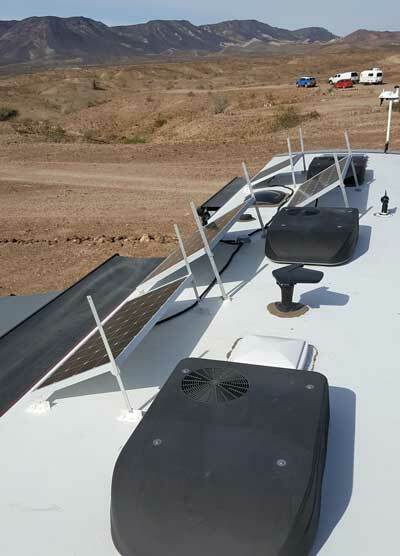 The Journey has an optional 100 amp solar panel with a charge controller capable of controlling more than 500 watts. It would be very easy to add another 400 watts of solar panels to this system. This unit does NOT have the 100 watt panel option installed. That's not a "deal breaker" since I could install a solar system from scratch but we would also like a newer model than 2013. The floor plan changes little from one year to another so we were very interested in walking this floor plan. 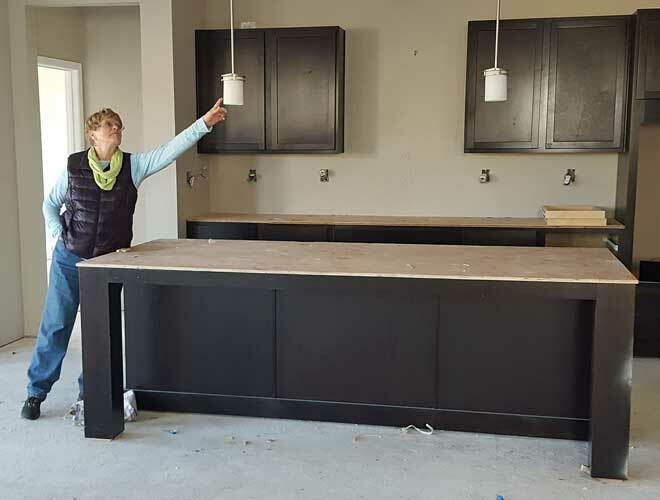 Gwen's comments were that she liked the kitchen, the location we picked out for her sewing center, she liked the bathroom. The bedroom has only one window she noticed and she did not like the wash basin in the bedroom. She also did not like the "air bed" (probably a $1,000 option). 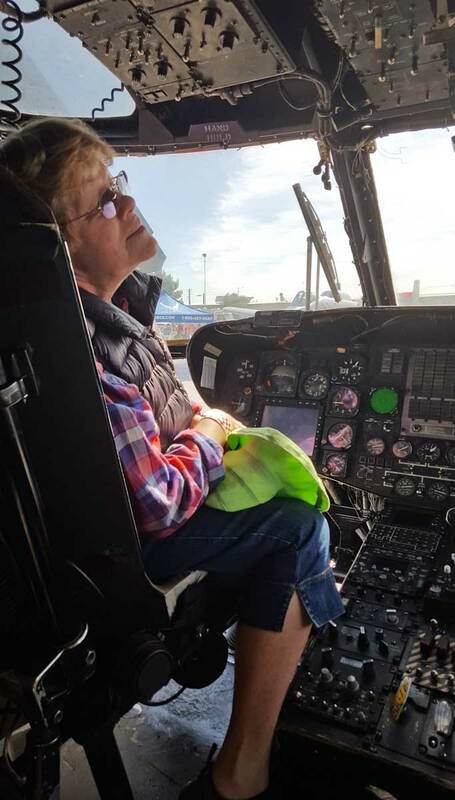 She felt the unit was "dirty" which made her concerned about the care of the unit's engine. I noticed several items not working (like not being able to start the generator) which the owner said would be fixed. Also, the owner had to run the engine to get the lights to work, otherwise they were dim indicating a problem with the six house batteries. All the interior lights were halogen, another big expense (we spent about $400 changing all of Miss Dory's lights to LED). My research also turned up problems with the full wall slides control mechanism. Winnebago used Schwintek brand which is designed for short, lightweight slides so many problems have developed. This owner says "I've had not problems". I'd rather hear, "The mechanism has been replaced". 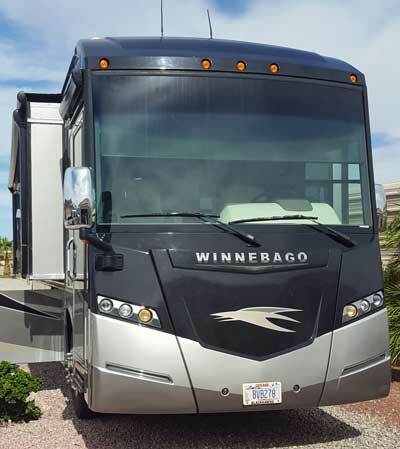 Behind the Winnebago photo is a 2016 Thor Tuscany at a dealer for $200,000 (click the photo to see it). I want Gwen to see as many comparisons as I can get her to look at. She called this kitchen a "hallway kitchen" and did not like it. This is just the start of our research. Monday, October 22, 2018: A long travel day from Love Pine, California to Lake Havasu City, Arizona through the Mohave Desert. The above photo is sunset over Lake Havasu from our location at the Havasu City Elks Club. We plan to stay here a couple days specifically to look at a motorhome we are interested in. We have been internet researching for three months but tomorrow will be the first time we are actually able to do a walk through. 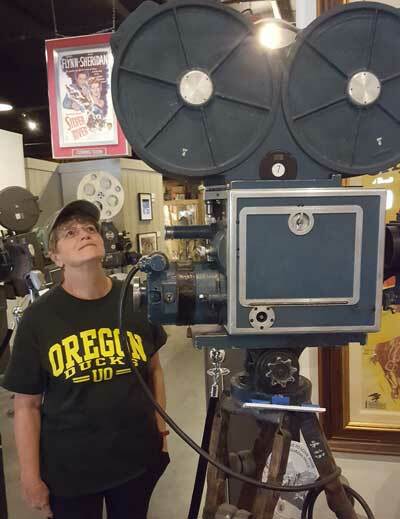 Sunday, October 21, 2018: We visit the Western Movie Museum because hundreds of movies and TV episodes have been made in the Alabama Hills where we are camped. We spent about two hours exploring the museum and watching a documentary of the Alabama Hills. The area has also been used in the movie series Tremors and Ironman plus some modern commercials. Click the photo to see our late afternoon view of Mt. Whitney. Saturday, October 20, 2018: Our friends have arrived. Ray has the large Allegro Red motorhome, Lynne has the pickup truck camper and Yvonne has the bumper pull trailer in front of our motorhome. 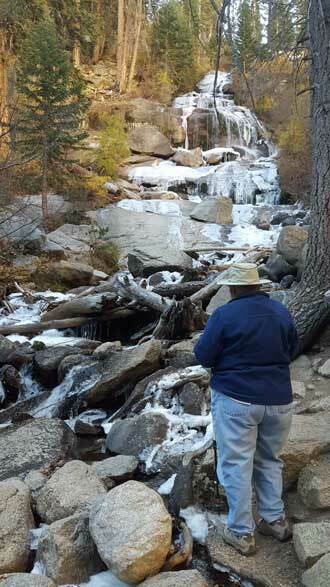 Ray, Lynne and I take a mountain drive to the Whitney Portal. Whitney Portal is the trailhead to the Mt. Whitney summit. 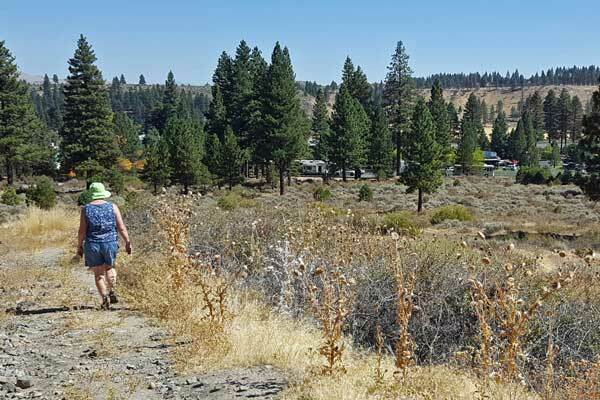 This trailhead will also lead to the John Muir Trail and the Pacific Crest Trail. 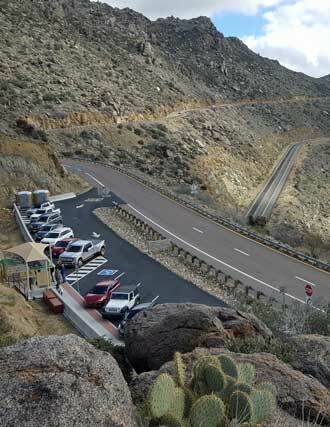 The drive to the portal is a two lane, steep road gaining 4,000 feet to 8,300 feet. Mt. Whitney is 14,508 feet so about 6,500 feet of climbing from this point to the summit. It was 70 degrees at camp but only 39 degrees when we arrived at the portal. The waterfalls just next to the portal road is partially frozen. After photos at the waterfalls we hike to the Portal Store to search for souvenirs. I took a video of the drive to the top. If you are familiar with the Lucille Ball and Dezi Arnez movie, The Long, Long Trailer, the scene where Dezi nearly backs the trailer off the mountain road was filmed on the Whitney Portal Road in 1950. The road was not paved then but is paved the entire route now. 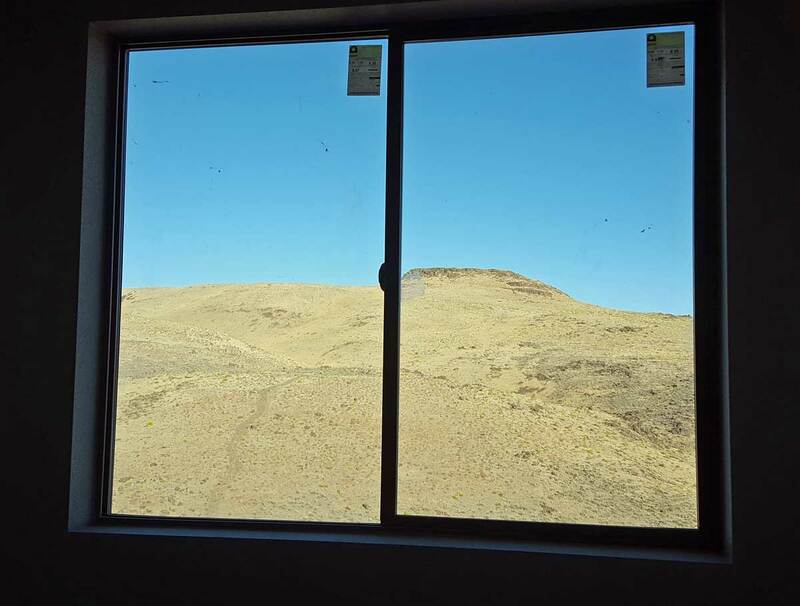 Friday, October 19, 2018: Moved to a more level location with a view of Mt. Whitney. We have no cell tower connection here so no phone or Internet. I drove into town, about three miles, to contact our friends who are meeting us here today. Then I walked around town because I have two favorite outdoor gear stores I like to visit. The BLM ranger visited us not long after we arrived. 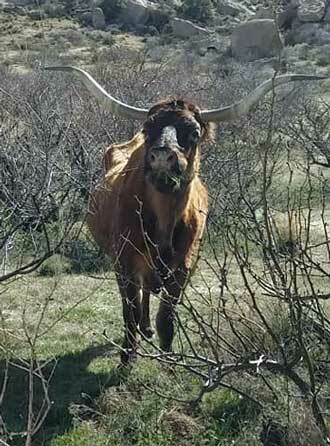 When I told him of three friends arriving he made sure I knew NOT to touch any of the brush with our vehicles or RVs. He said the Alabama Hills are "being loved to death". 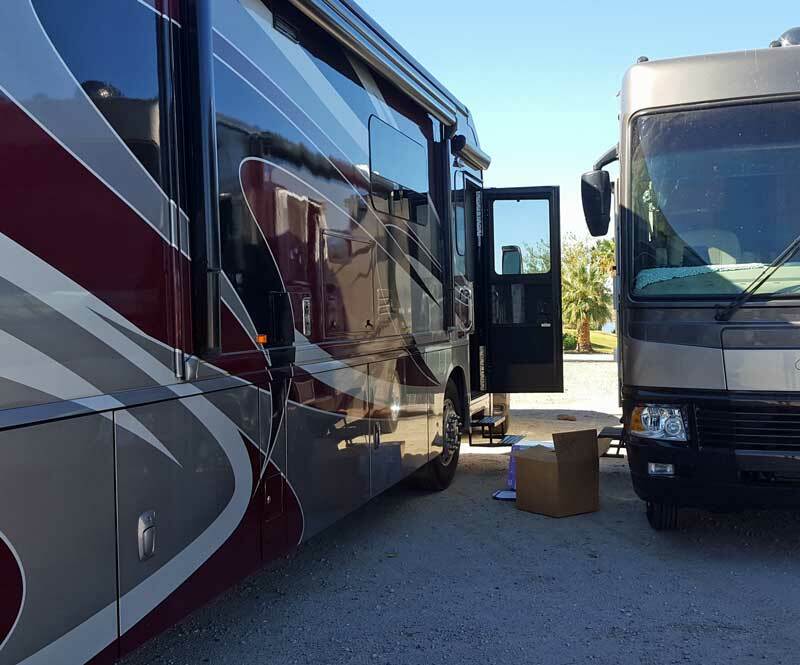 We have one 39 foot motorhome and two very small RVs yet to arrive. I believe they will fit. Thursday, October 18, 2018: A travel day from Verdi, Nevada to Lone Pine, California on the most scenic US395 along the eastern Sierra Nevada Mountains. We are camped at the base of the tallest mountain in the continental US, Mt. Whitney. 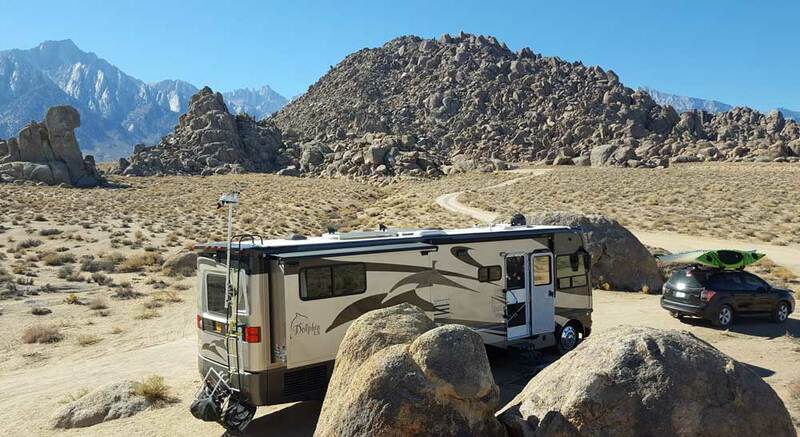 Just west of Lone Pine are the "Alabama Hills" where hundreds of western movies were filmed. 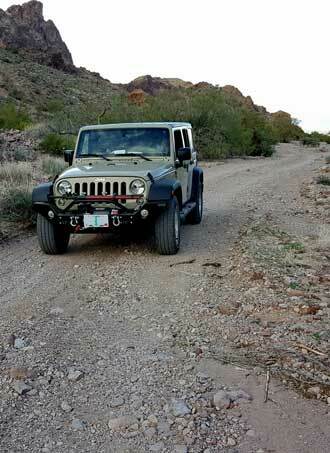 Now it is BLM land where RVers boondock park and Jeeps explore the many sandy roads. We arrived late in the day so picked a spot quickly with the idea of finding a better location tomorrow. Tuesday, October 16, 2018: It's Tuesday. Remember what is special about Tuesday? 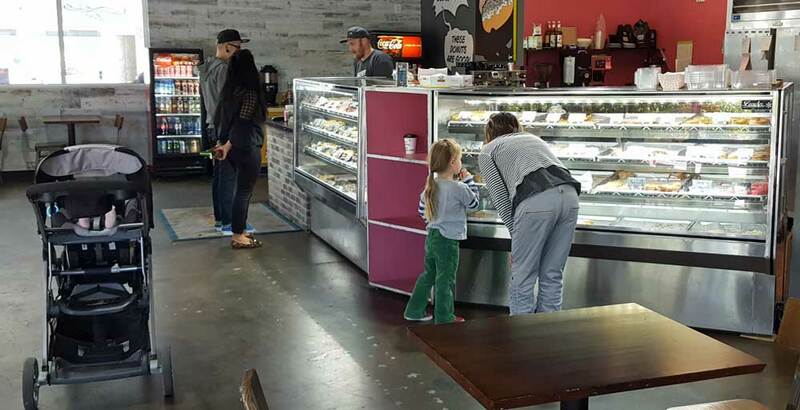 Tuesday is vegan donut day at the donut shop. 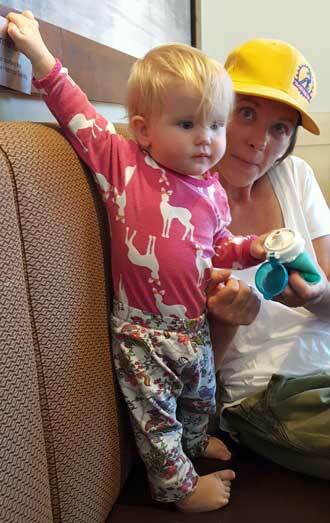 Daughter Mindy and granddaughter Lucy are choosing their favorites. Elise is sitting the the buggy. I got to choose my favorite too. Sunday, October 14, 2018: Not many words needed. I got to spend time with Elise. She is always smiling and exploring. 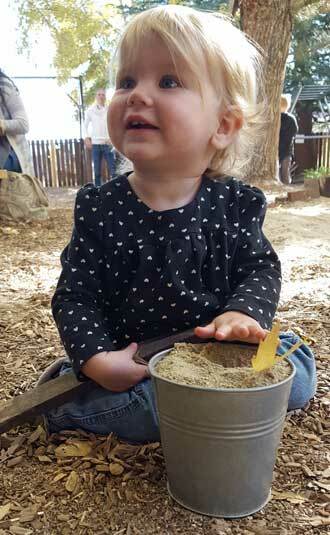 She ends up with a sandy smile, apparently testing the flavor of sand. 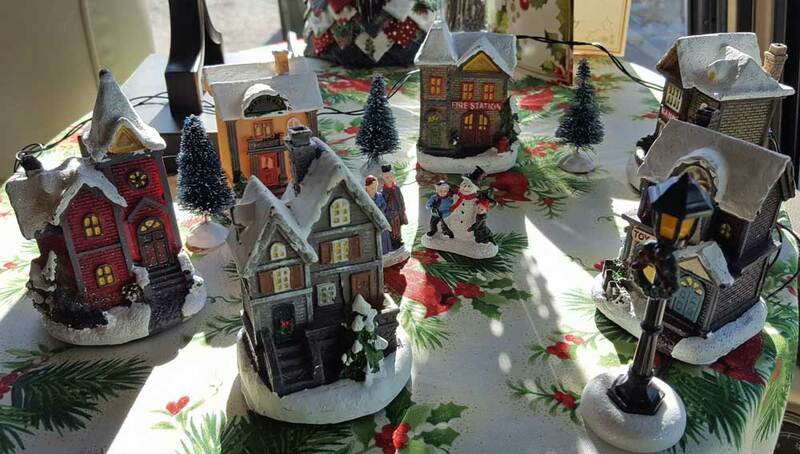 Saturday, October 13, 2018: We attend a local "Harvest Festival" hoping to find Christmas gifts. 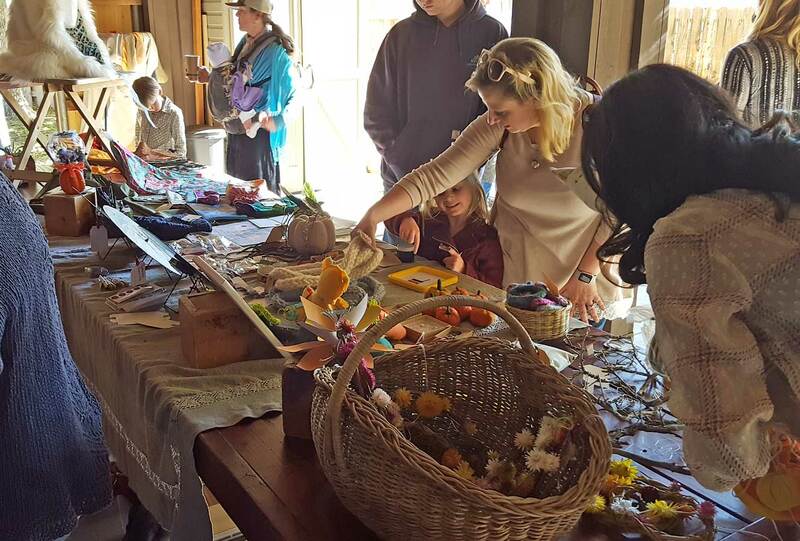 It turned out to be a few hand made items for sale but many activities for the children and parents of the school. The children were showing off their musical talent. I did find one item I purchased for Gwen, a hanging fruit string to add "natural odors" to the room. Click the photos for additional views. Thursday, October 11, 2018: I'm at it again with Noah working and Chloe watching. As we go through the lesson, Noah knows the page which has all the commands, stamps, and colors. However, when he looks at the name of a "stamp" (character) he informed me he could not remember the spelling to be able to enter the name into the code. I suggested he write it down. He got himself a pencil and paper and for the rest of the night he made notes of the spellings he needed for the code. That is a trick we all use every day. It worked well for Noah. He is anxious to get the APPS to do more but I had to encourage him to "take it one step at a time". "You need to learn each command in order as they are presented". Not sure if he will follow my advice. The link above is a one second video taken by Ben, Noah's Dad. 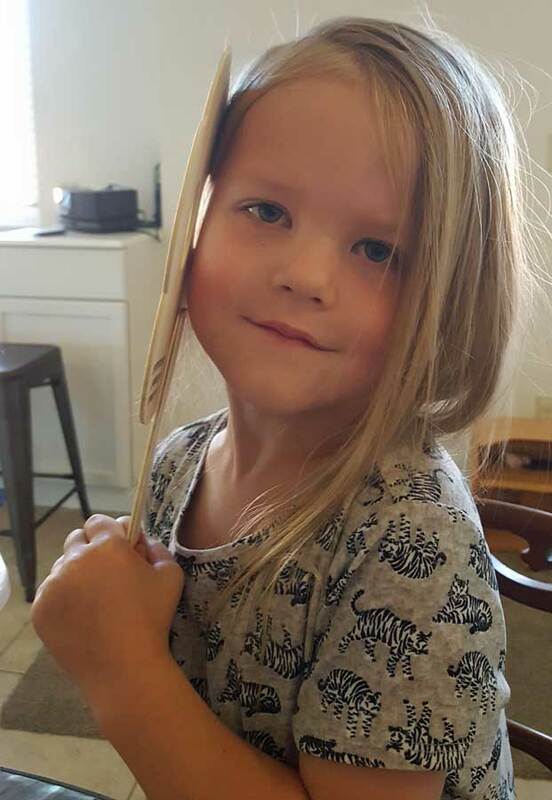 Wednesday, October 10, 2018: I spent the afternoon with Lucy and Elise again but once Dad came home I moved to be with Chloe and Noah. I give them a Christmas gift each year of the once a month craft kit called Kiwico. Chloe loves the monthly craft kits but Noah, not so much. So I discontinued the craft kit for Noah and switched (after talking with Dad) to Bitsbox. 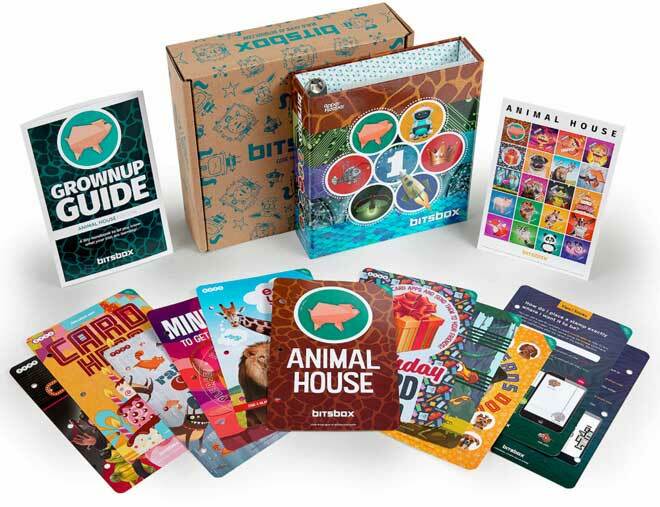 Bitsbox is for 6 - 12 year olds teaching software coding with monthly lessons. I was very pessimistic about the young age learning coding because the younger age does not know how to read yet. Noah is 7 and in first grade. Today I spent more than an hour with him in a second session. He remembered what we learned in the first session and built on that with the second session. He never got tired and only ended our time because Dad was insisting it was bedtime. He is doing exactly what I would hope he would do, building on what he is learning. 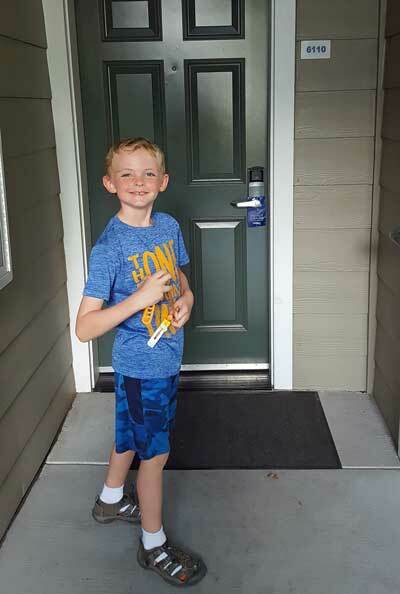 After building a code sequence he wants to take what he has learned and change characters, sounds, position on the screen, background color and even learn new commands. He is applying what he has learned to build his own APP. Trying to get Noah to anticipate what he might learn, I asked, "What haven't we learned yet that we would like to know?" Chloe was sitting next to us, she said, "get the character to move". Noah answered, "I can get it to dance." So we did. We eventually decided we didn't know how to place the character in a different space on the screen, we didn't know how to have multiple characters on the screen, we don't know how to stop a song. We have something to look forward to in future lessons. 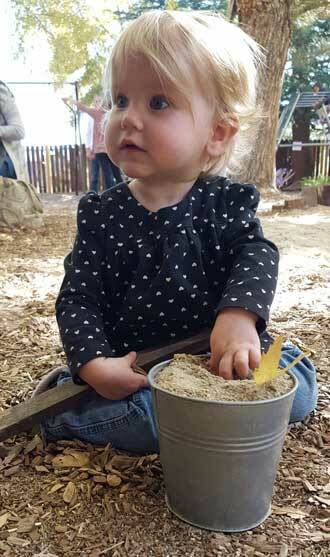 Tuesday, October 9, 2018: I spent my afternoon with Elise and Lucy but I didn't take any photos. I also went to Costco to get my tires rotated. 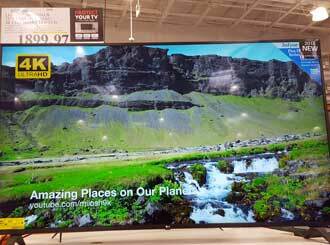 While waiting, I took photos of all the 75" TVs for son Joe. He is shopping for his new house. Click the photos to see the other two. Yes, this is strange but I had a three hour wait for the rotation. 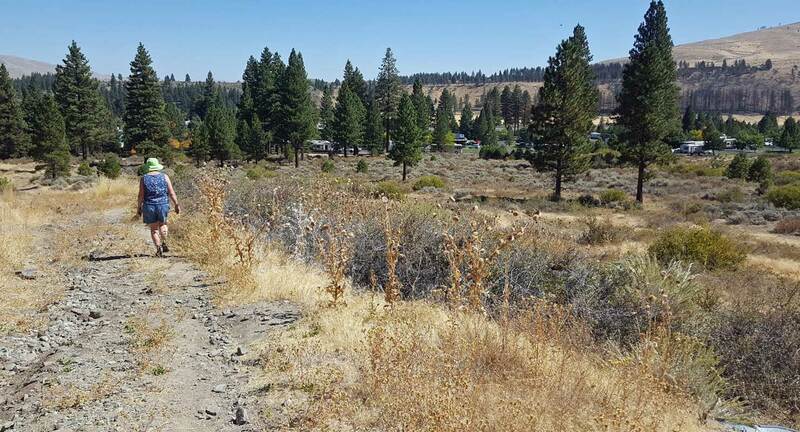 Monday, October 8, 2018: We learned of a unique private campground near Truckee, California, about a 45 minute drive from Reno. We decided to tour it today. The campground plan is a whole lot like the Escapee plan for the CoOp parks. The campground is 159 acres with many sites. You purchase a "membership" for a specific site. Several are for sale. We toured a half-dozen lots for sale. The lot in the photograph was the largest we toured for a price of $36,000. There is no power to the sites. Generators are allowed during certain hours but may run only 3 hours. Most site generate some power using solar panels but I notices the trees would only allow about 2 hours per day of direct sunlight. Water is usually located close by but each member is expect to fill their fresh water holding tank from the nearby faucet. If you build a "French drain" on your lot, you are allowed to dump gray water. A paddy wagon will drain your black water or you can drain at one of the dump stations. There is an annual maintenance few of a bit more than $1,000. You can camp at your site between May 15 and October 31. The other months, you can check on your property but not spend the night. The elevation is 6,000 to 6,500 feet. That means significant snow during the winter, hence the camping limit. The site member sets the price for the site so in theory, the value of the site could grow. Also, in theory (just like Timber Valley) the real cost of the site is the maintenance fee since you get the cost of the lot back when you give it up. 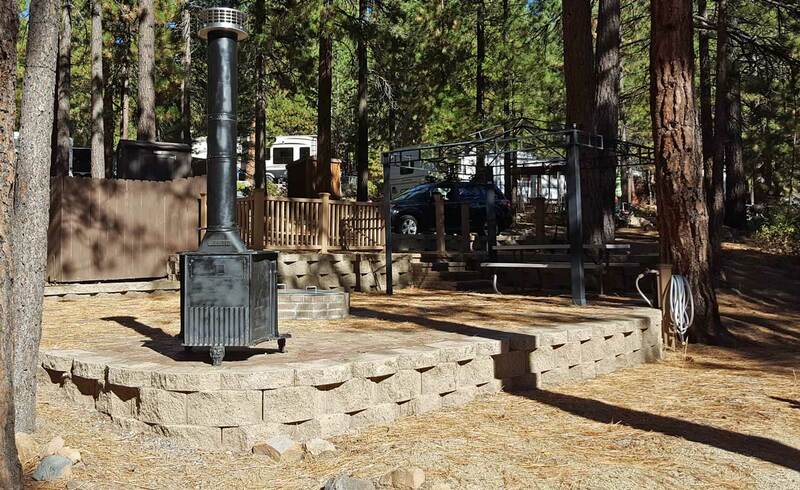 The site owner of the lot in the photos has tapped into a nearby water faucet, installed a french drain, installed a couple of small sheds, left a wood burning stove, built party decks and platforms using landscape blocks and left a large propane tank. 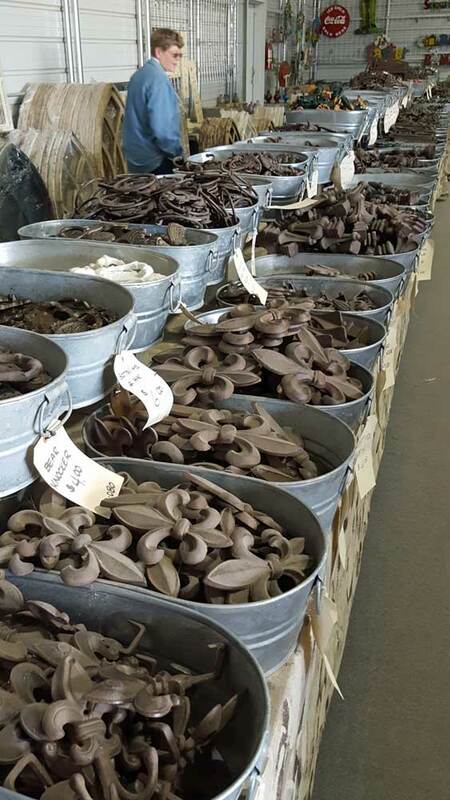 They've done a lot of work and hope to recover some of their cost with the sales price. 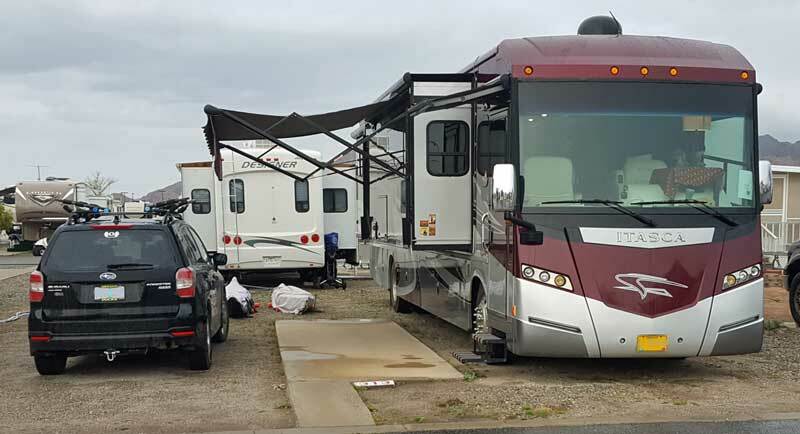 Thinking of the snow load, I wondered what members do with their RVs since most seem to permanently install an RV on their lot. Click the last photo to see what these owners do. They build a "hat" over the top of their RV. Still, the snow load could be much more that something this simple could support so they must visit the property after a snow storm to take care of the roof or hire someone to look after it. Click all photos for more views. This idea has several strikes against it for us. Management will not allow the member to rent the site to others. They will allow family to use the site however. 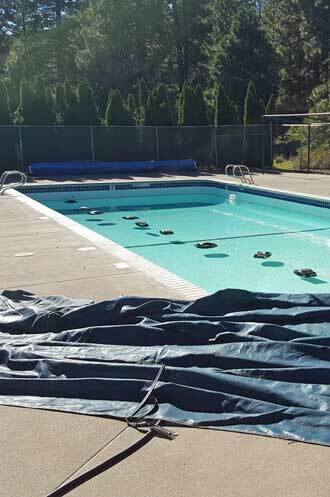 The only upgrade for this campground over a regular National Forest campground is the swimming pool and perhaps the camaraderie of the fellow site owners. Sunday, October 7, 2018: After watching "A Star is Born" with son Joe, Ben, and Gwen we drove to Joe's new house under construction. The workers left the sliding door open which gave us access. It is in an excellent area with nothing behind his house but a mountain never to be developed. It is going to be a really nice house and location when finished. We viewed his master bedroom, bathroom and closet. The amount of square footage in the bath and closet is probably equal to the square footage in Miss Dory. Click the photo to see the entrance to the bath and closet. Saturday, October 6, 2018: Off to a University of Nevada Reno football game against the Fresno California Bulldogs, a tough team. I always like to watch the band since I played in the band in both high school and college. The football team did not do well, only scoring 3 points for the whole game so Fresno ran away with the score. Click the photo for the band at half-time. 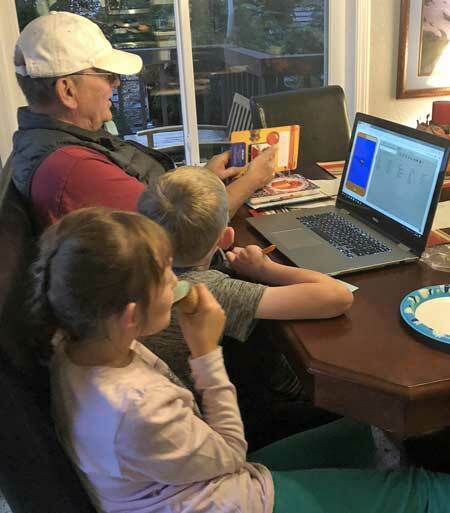 Friday, October 5, 2018: Another travel day with the grandkids. This time from Windsor, California back to Verdi, Nevada. It has been a busy and very active vacation with the kids. What a great time for both of us. However, I meet up with Lucy and her mom after getting back. Lucy is trying on some Halloween gear and having fun with that. 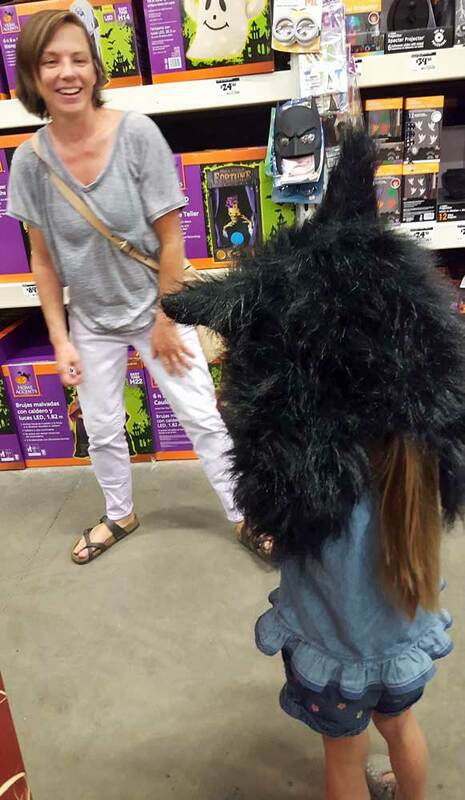 So is her mom, click the photo to see what I mean. 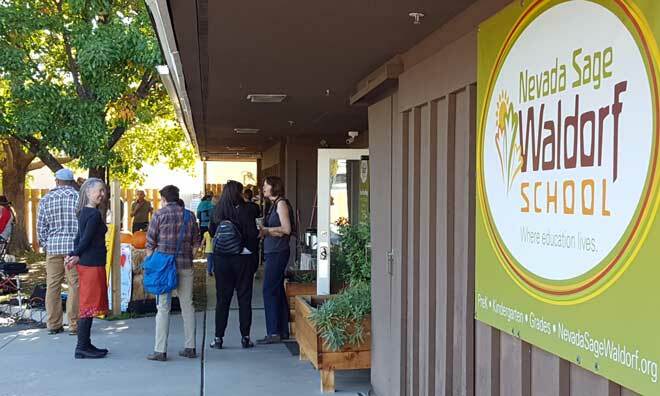 Thursday, October 4, 2018: This was pumpkin patch day at the Santa Rosa, California Pumpkin Patch. 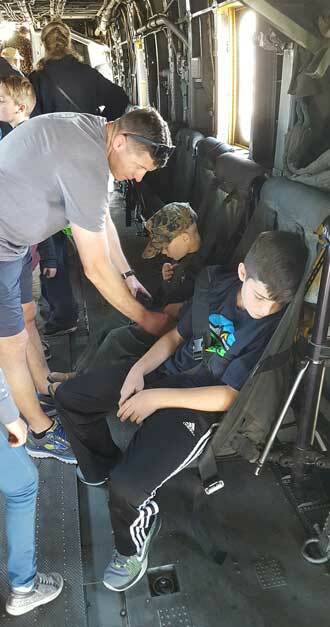 They had multiple activities for the kids and grown-ups to try. The kids never tired of any of them and did most multiple times. Scan through the photos to see all the activities they did today. Click each photo for another view. 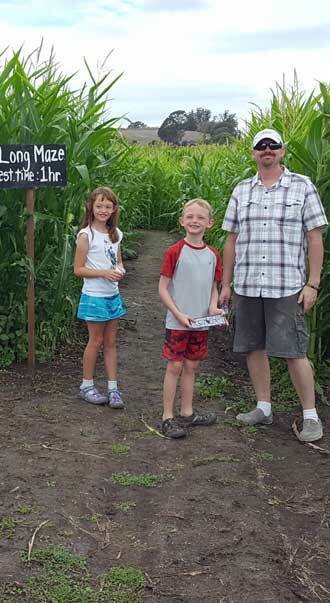 We did the corn maze in less than 30 minutes, thanks to Ben as the map reader. 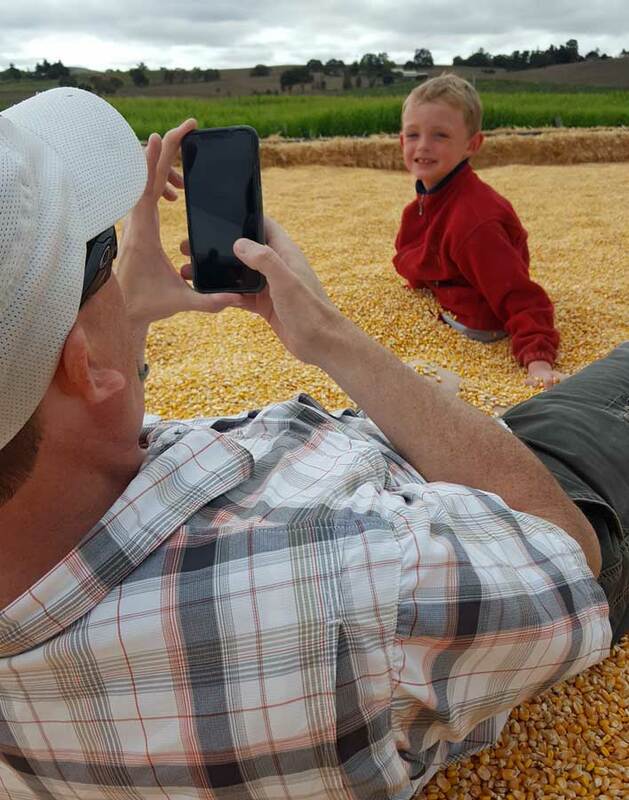 We had a rain yesterday so the corn maze was muddy. By the time we finished, our shoes were heavy with mud. We each had maps but Ben was the only one who figured out the map. I made a video of the day with the whole walk through the maze on the video. Don't worry, the video is not long, I speeded up our walk through the maze. Behind the photo on the right is a map of the maze. 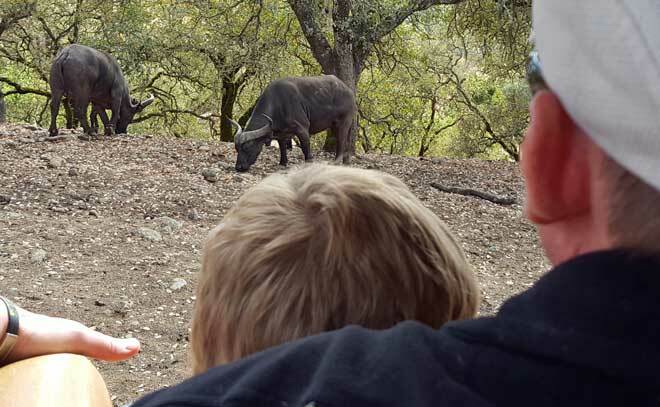 Wednesday, October 3, 2018: This is our day of a safari in the Safari West wildlife sanctuary. 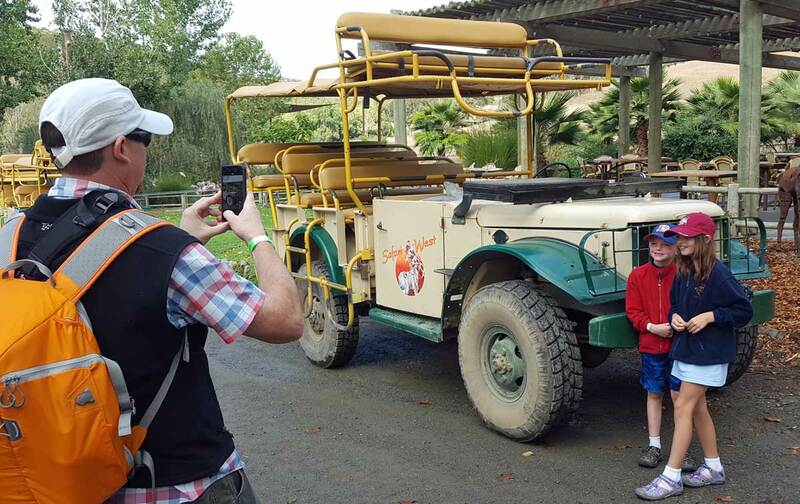 We started the safari at 10am and did not finish for three hours. It was very entertaining mostly because of our guide. 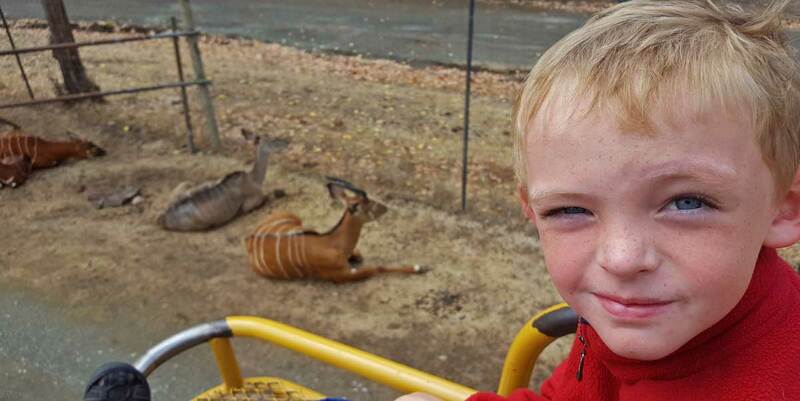 We saw all sorts of wild life and enjoyed the many stories told by our guide. 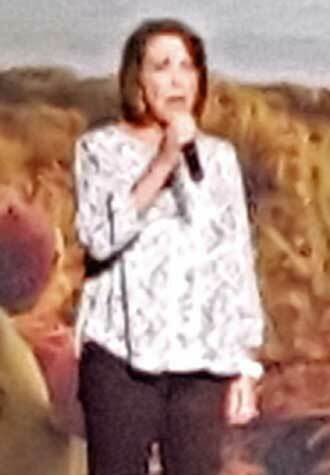 She told entertaining stories of the wildlife and their habitat. Santa Rosa was the city a year ago of a wild fire which burned thousands of homes and threatened Safari West. 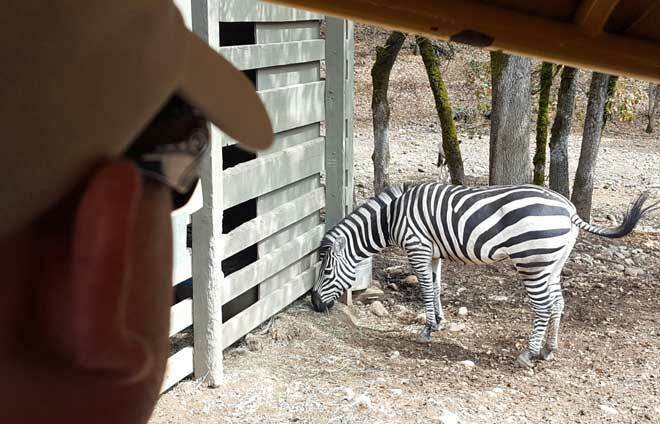 About half of Safari West was burned but no animals were lost. Overnight guests had to be evacuated at a moments notice and the owner and staff members lost their homes. I can't imagine the fear they experienced that night. Be sure to watch the video I made of our tour and click each of these photos for another view. 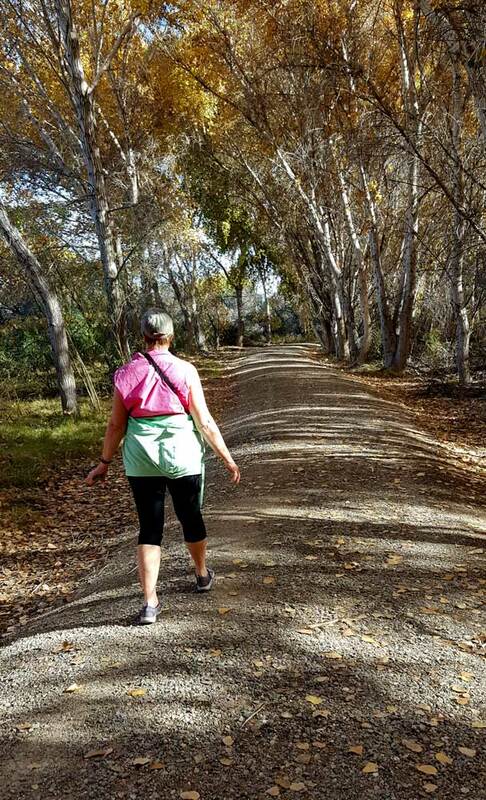 Tuesday, October 2, 2018: After a long drive from Reno, Nevada, we arrived in Windsor, California for swimming, hiking, a pumpkin patch and a safari. It seemed to take the most of a day but actual driving time wasn't that bad. Of course the traffic was much worse than any I experience in Oregon. A 3D representation of the drive is here. Our drive took us over Dinner Summit in the Sierra Nevada Mountains. The scenery can't be beat. Watch the profile in the upper left corner of the 3D view to see our 7,200 foot summit at Donner Summit. 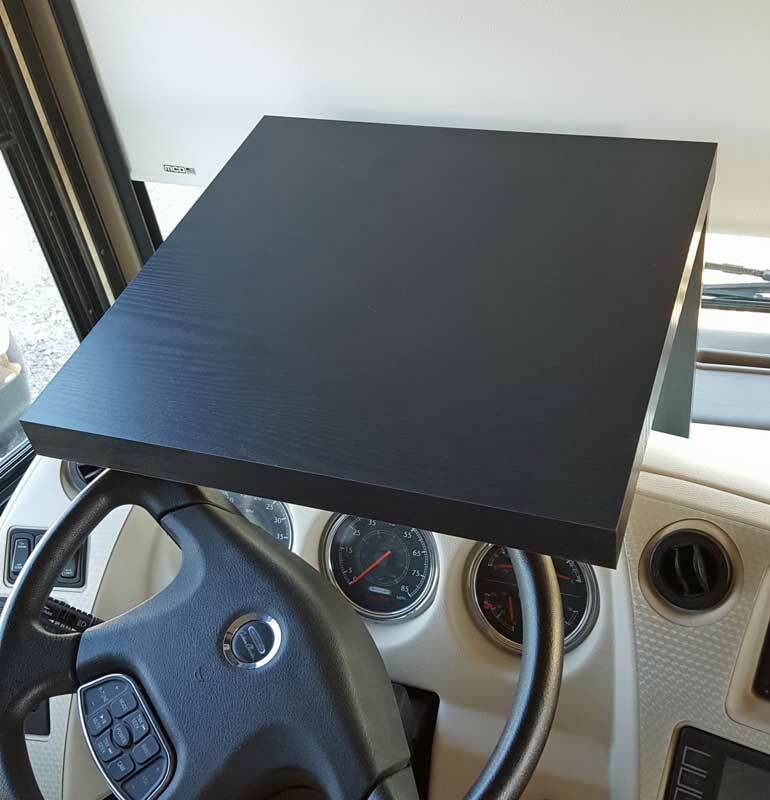 Monday, October 1, 2018: I purchased a cheap table ($10) from Walmart with the idea of fitting it on top of the steering wheel. This makes a "dead" part of Miss Dory into a part of the home. Two of the legs will brace against the steering wheel and the other two will be shaped to fit the curved dash. 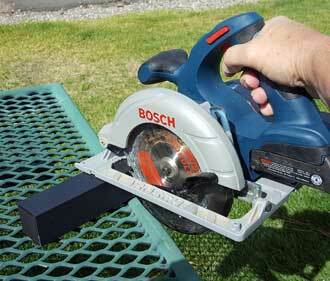 A short piece of a leg will be glued to the underside on the seat side of the table to lock the table to the wheel. 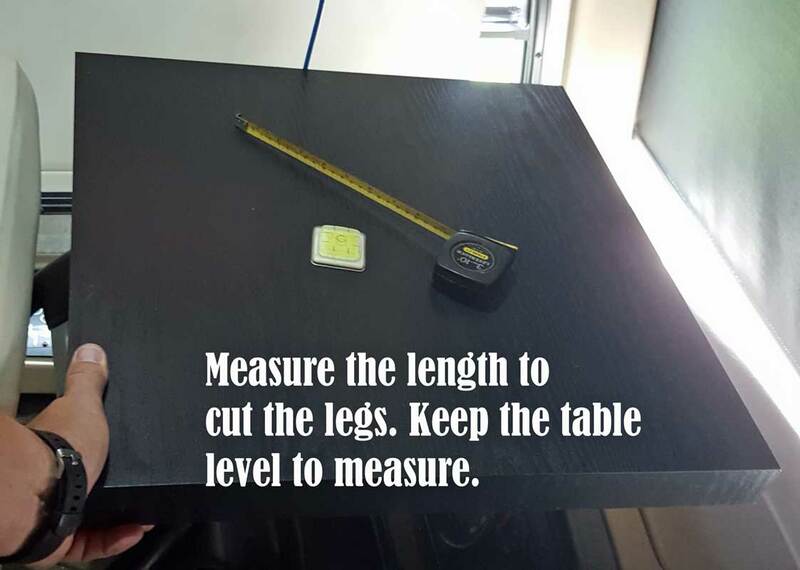 With Gwen's help, I measure the legs for length so it would sit level. I cut them off, screwed them into the table and set the table onto the steering wheel. It was perfect. 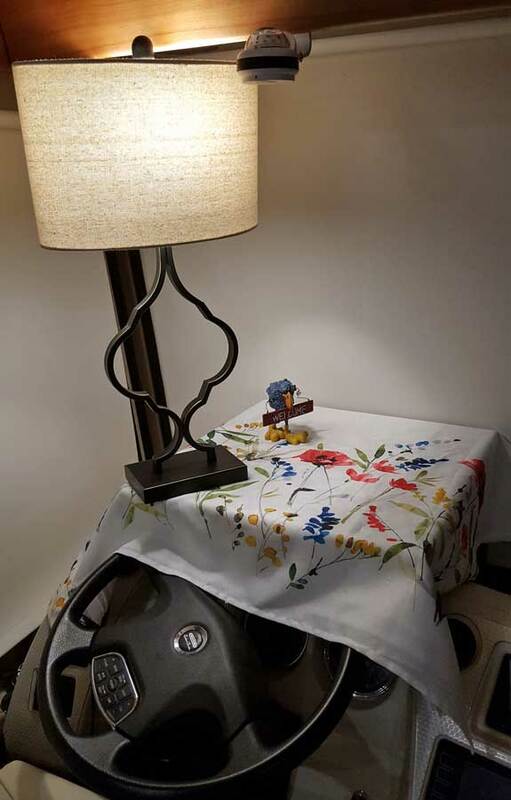 Gwen already had a small table cloth, we bought a lamp specific to this project and an LED light bulb. Click all photos for additional views. Behind the last photo is the result of the project. 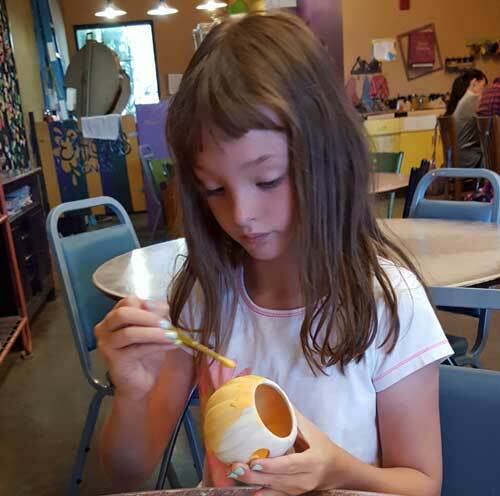 Sunday, September 30, 2018: The last day of September we spend with Ben, Chloe and Noah at "Clay Canvas" in Reno painting unfired clay. The kids have done this before. It looked like so much fun I decided to paint a coffee mug. We were at the shop more than an hour. Each of the kids did two items, Ben did one item and I did one item. 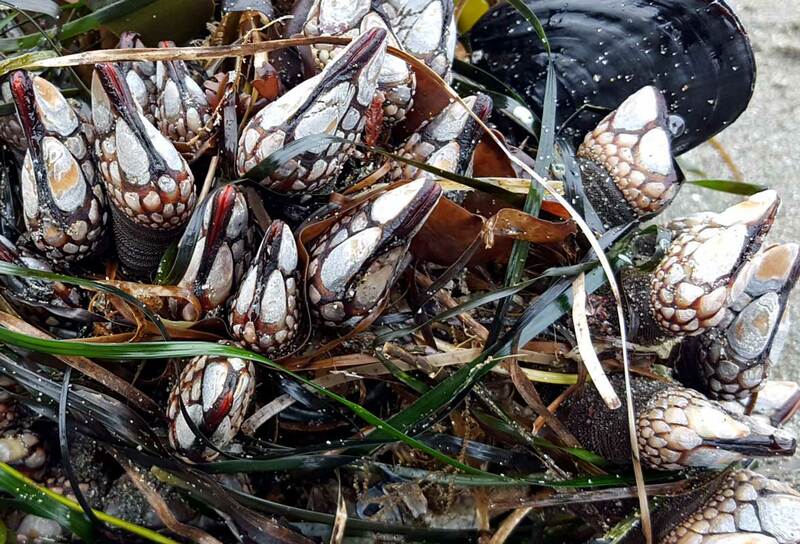 They will be ready in a week. Saturday, September 29, 2018: Today was a special day for Chloe and Noah. 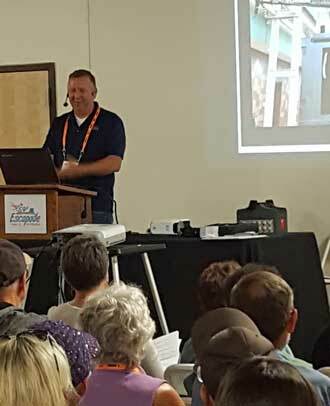 The last seminar of the year for those who have volunteered to host a state tortoise happened at the Nevada Humane Society. The topic was how to prepare the tortoise for winter hibernation. In about a month the tortoise should begin hibernation for the winter. Dad (Ben) and Chloe sat in the seminar while Noah and I walked through the facility looking at all the dogs, cats, rabbits and guinea pigs. We stopped and talked to every dog (probably 50-60). 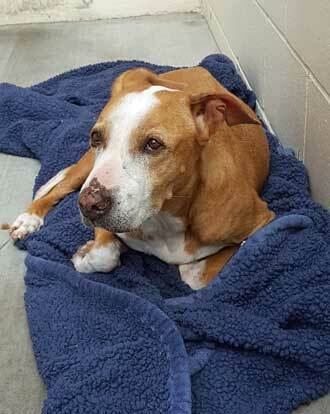 We considered this dog to have the saddest look. It didn't move to greet us and ears are back. There were a few threatening dogs (2-3) but most would greet us in one way or another. We saw lots of pit bulls and about a third of the dogs were older, no puppies. There were lots of cats, most in cages but a third in open rooms with the entire room to roam. After the Humane Society, we had lunch at Raising Cane's Chicken Fingers. I thought it was very good. Only thing in the menu was chicken fingers, fries, texas toast and drinks. Then the kids wanted to show me the view of "Nevada" which turned out to be a fence line in the shape of Nevada from a nearby mountain view. Click the photo to see the view behind Noah, Ben and Chloe. 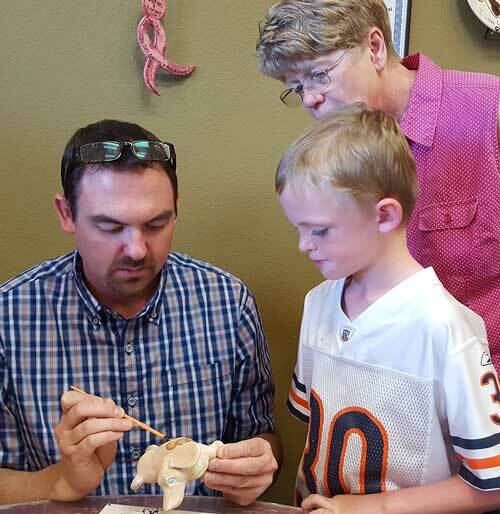 Friday, September 28, 2018: Finally get to visit with the school age grandkids. 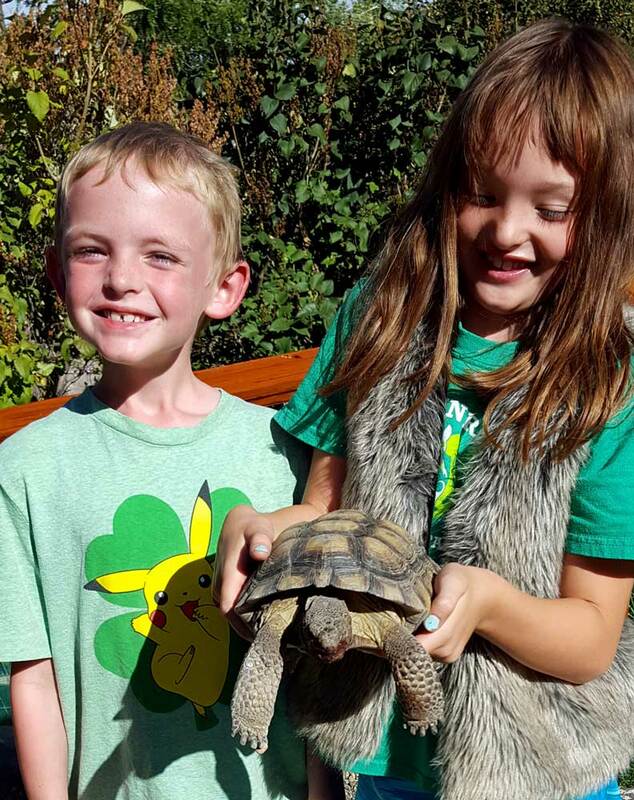 Noah and Chloe has an official tortoise in their back yard. Official because the tortoise is a protected animal in Nevada and folks must be trained to become an official tortoise home. The tortoise is actually property of the state. 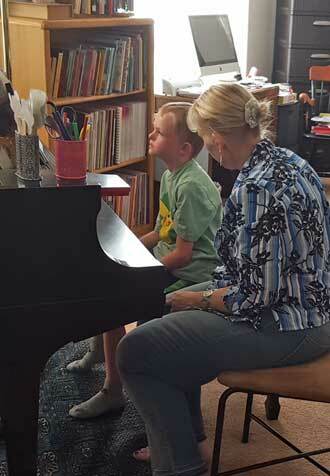 After the tour of the tortoise home I drove the kids to their piano lessons. 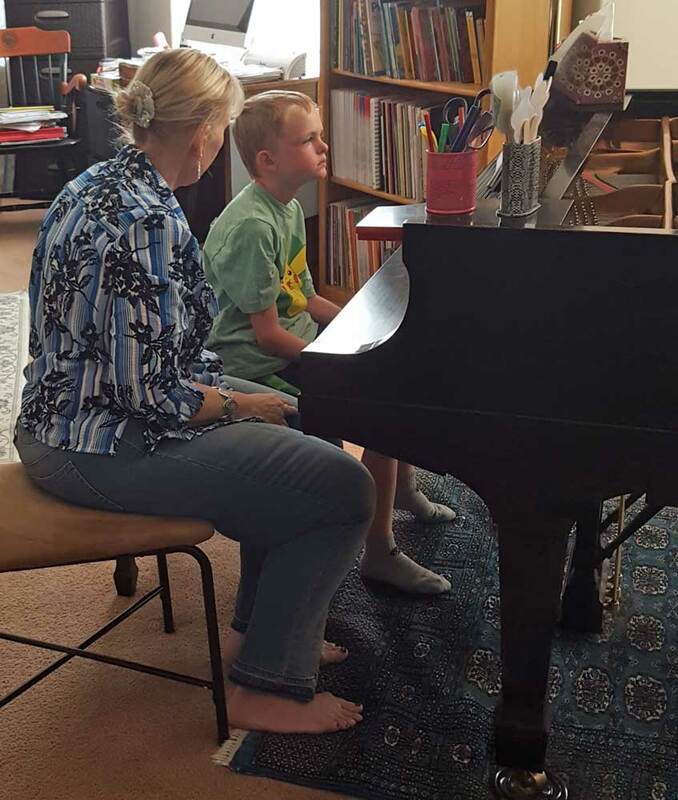 It doesn't look like Noah is having fun but I think he really likes piano. Click both photos to enlarge. Thursday, September 27, 2018: Mindy (my daughter) and Scott, her husband have a long list of house projects. 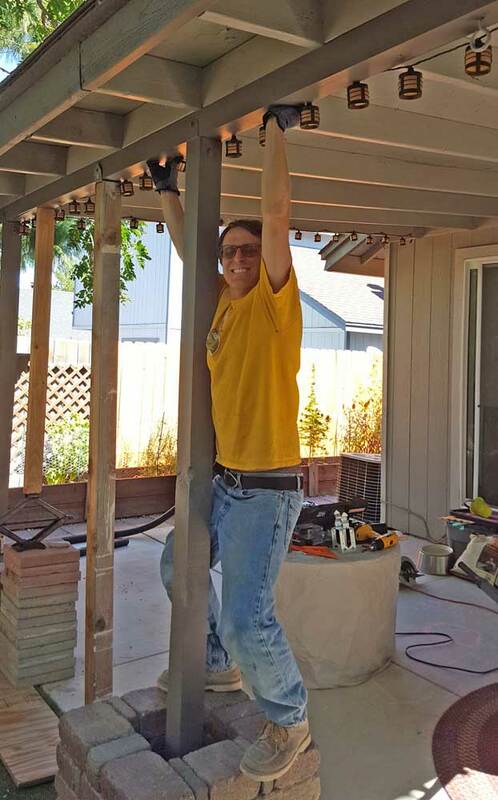 I volunteered to help with fixing the posts holding up the patio roof. They needed to be shortened then set into concrete. Of course the roof has to be temporarily supported while we remove each post. Scott had some unique ideas of how to do that. I was just the "Go-Get" guy while Scott did most of the work like mixing the concrete and removing the old posts. 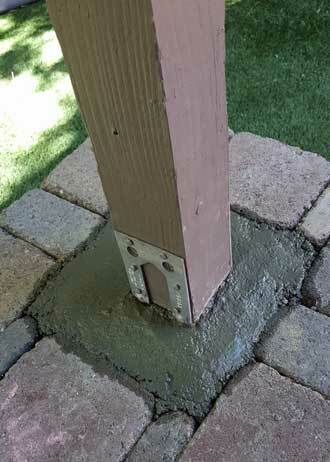 All three posts have been set in concrete. Click both photos for more views. Wednesday, September 26, 2018: I tried to barbeque with our "Fold N Go". Coleman gas barbeque and found it was leaking at the connection to the regulator. I've had trouble with the regulator in the past so decided to replace the barbeque especially since the Fold N GO was on sale. It arrived today, I connected it to the gas hose and it leaked just like the original. Looking at the hose I decided it was missing an "O" ring so drove to Home Depot to get one. I looked at the new hoses and found they had no "O" ring. So what is going on? I asked two Home Depot department managers for help and was told by both to put yellow gas teflon tape on the threads. I did that and the sound of gas escaping stopped so I thought the problem was fixed. I checked with a flame and YIKES, it is still leaking. I turned off the gas valve but the flame didn't stop due to the amount of gas pressurized inside the hose. I blew out the flame. Apparently the problem is entirely with the hose end. It is baffling to me. What could go wrong suddenly with the hose end? There are no moving parts to wear out. 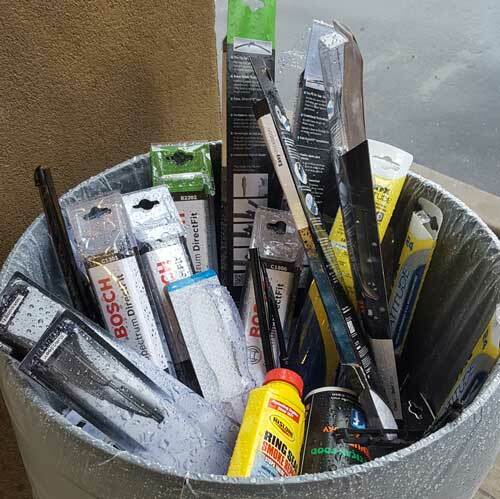 I've already spent the money for a new barbeque and gas teflon tape and I still don't understand the problem. Replacing the hose seems like the only thing left to solve the problem. My son Joe, made a short video mostly to be funny but it shows the problem well. I chose the "Fold N GO" because of it's small size. 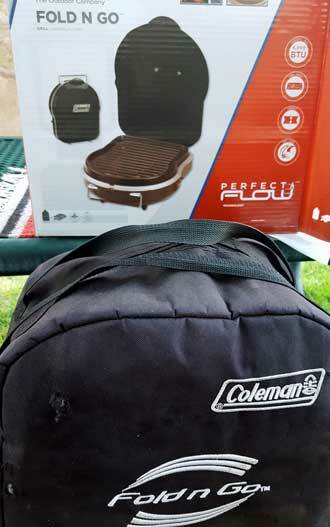 We have the Fold N GO bag and griddle already too. 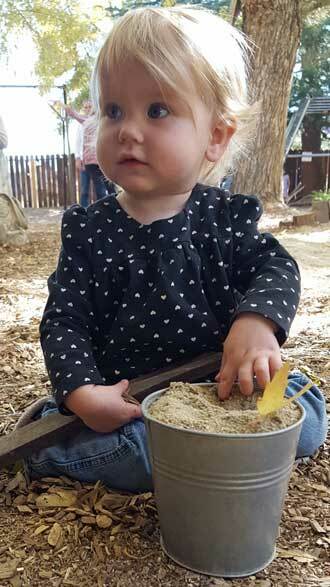 Tuesday, September 25, 2018: I learned today, after playing with Elise this morning, the afternoon routine. First, we packed Elise into the car then headed to Lucy's school to pick her up. 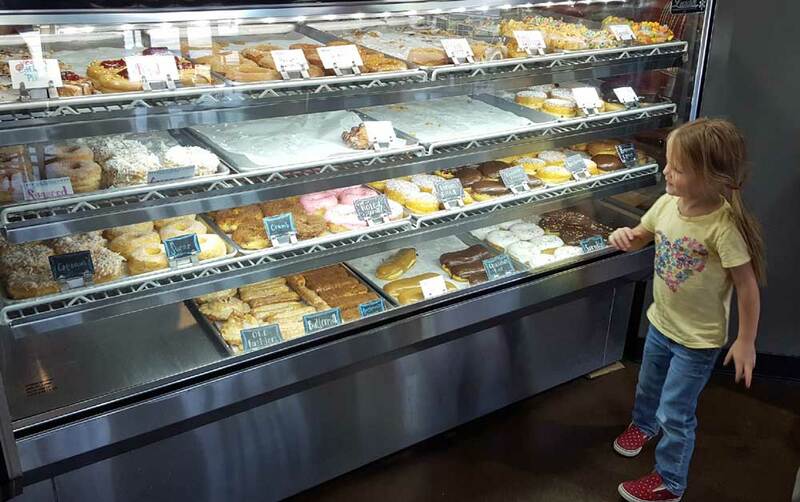 We had a short errand to run then off to the donut shop. Tuesday is special at the donut shop, they make vegan donuts on Tuesday. Mindy buys a treat for everyone on Tuesday. 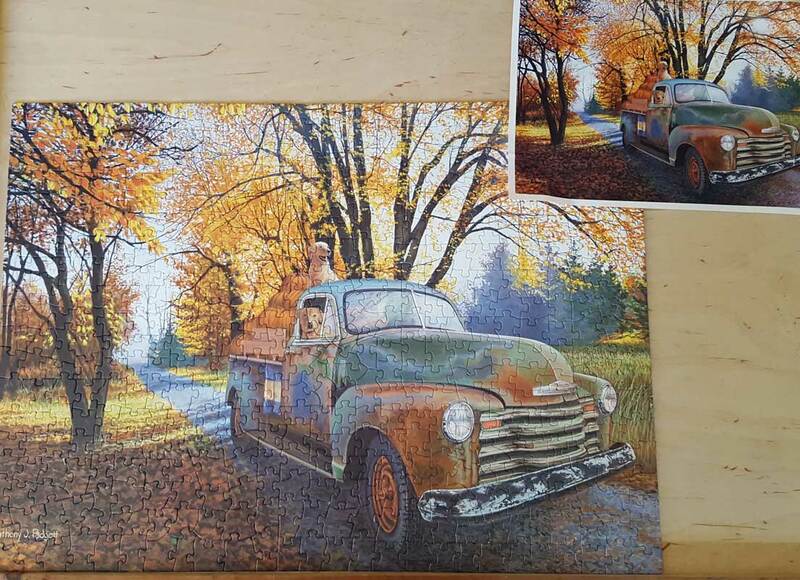 Monday, September 24, 2018: Gwen finished her first jigsaw puzzle project today. Once finished we took a short hike around the mountain to the southwest of the park. Here is a short 3D track of the hike we took from one edge of the park to another. The high today was only in the 70's but the altitude makes it feel warmer. The humidity is also rarely above 20% level which is causing lots of nasal problem for me. This may be a whole winter problem since the humidity in Arizona is very low too. Click both photos to enlarge the views. 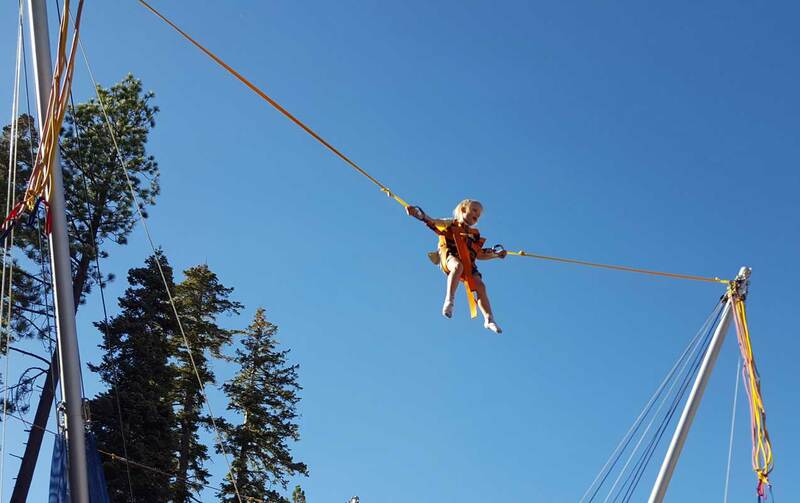 Sunday, September 23, 2018: Lucy is up to trying anything so today she was offered the chance to try a bungee trampoline because she was the only one in the kid activity area of Northstar Ski Area. 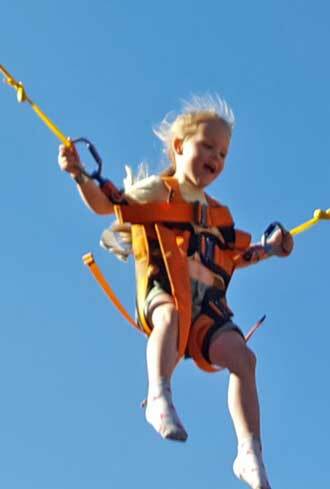 This was her first time with the help of a bungee, she has used a traditional trampoline many times. The operator of the bungee trampoline is a fellow from Boston. You will recognize his accent in this video. Click the photo for another view. 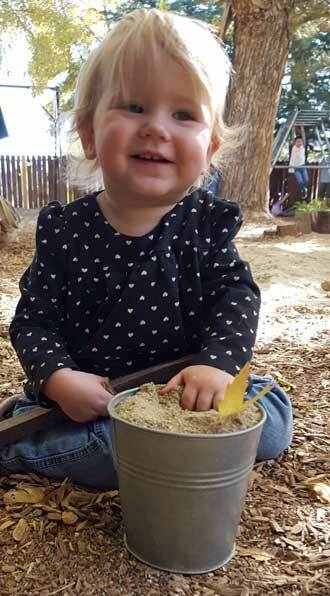 Saturday, September 22, 2018: This afternoon I got the chance to play with Lucy and Elise. Elise sat for ten minutes to read books with me. I brought the two of them a wooden mask to color. Elise liked to play peak-a-boo but had no interest in decorating the mask. 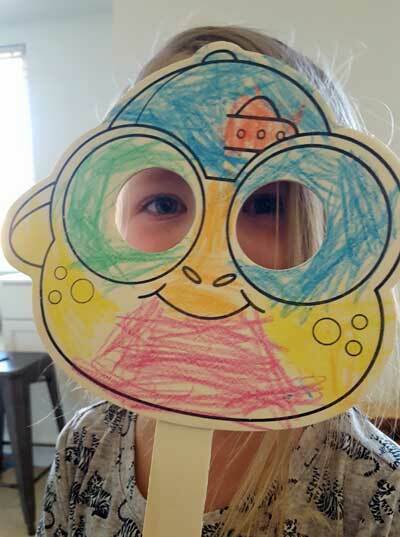 Lucy, on the other hand, spent 30 minutes coloring her mask then trying it out around the house. She then put it into her basket containing many costumes. As she colored she described the color she was using and the part of the face she was coloring. 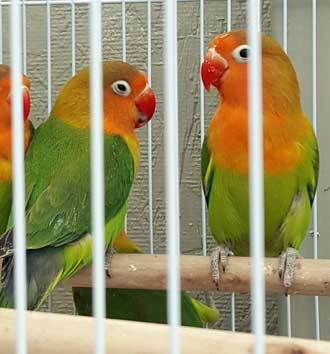 For example, "yellow cheeks", "pink chin", "blue eye", "green eye". Click the photo for Lucy's pose. 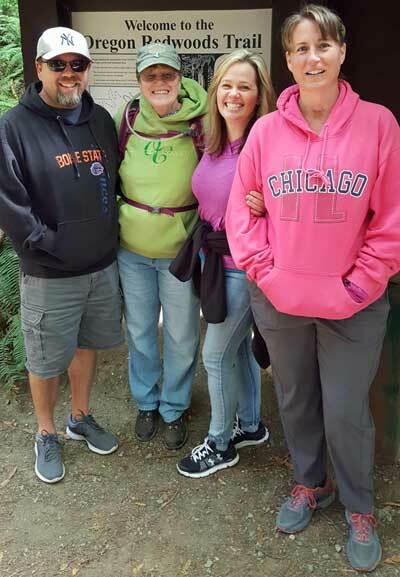 Friday, September 21, 2018: Gwen and I spent the day with Scott, Mindy, Lucy and Elise. Elise is the youngest with Mindy (Mom) on the left photo. 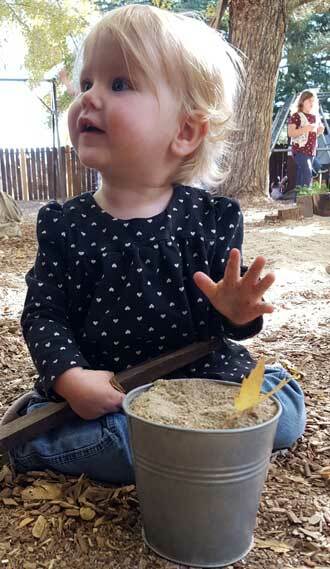 Elise is a very lively 14 month old. She loves to be with people and has accepted us very quickly. She is a good eater and walker too. Lucy is 4-1/2 and very athletic. She went swimming at swim lessons this morning then off to try the tall "spider slide" thirty feet tall. 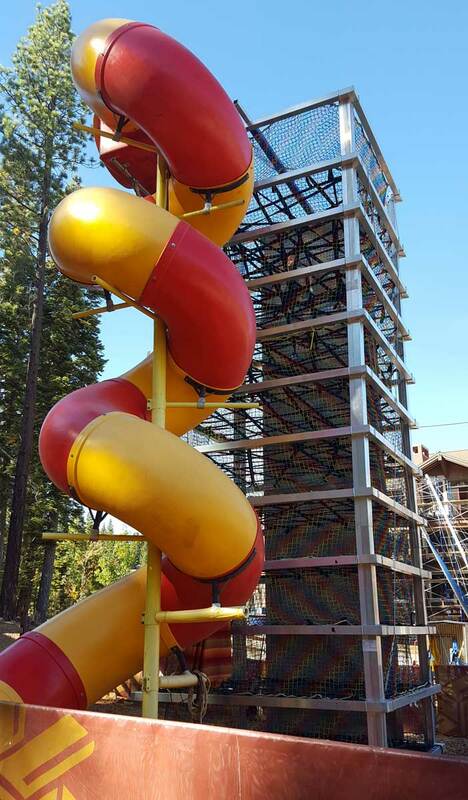 It is called a spider slide because children must climb through multiple layers of webbing to get to the top of the slide. 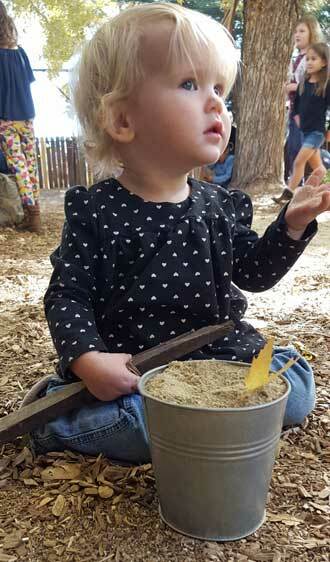 Lucy is exactly 42 inches tall, the minimum to use this equipment. Watch the video and you will see why the child must be 42 inches. The webbing stretches so Lucy must reach above her as far as she can to grab the next level of webbing to climb to the top. Apparently it was worth the effort because she did this multiple times. Click both photos for more views. 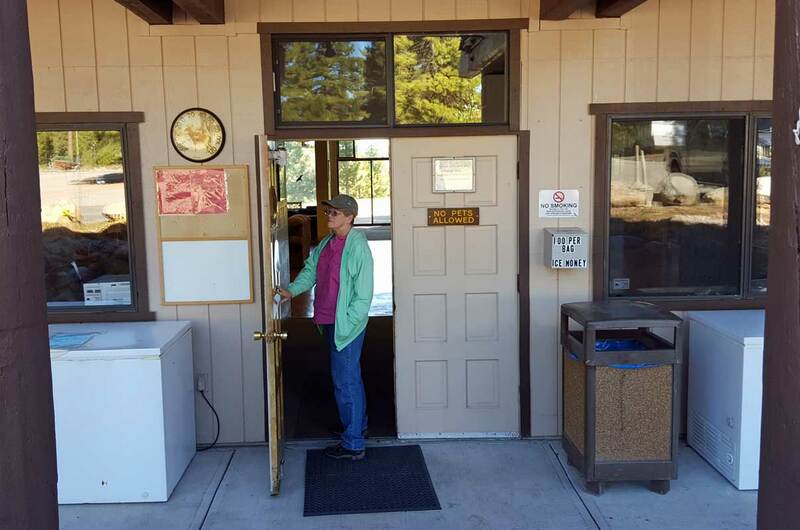 Thursday, September 20, 2018: Another travel day from Old Station, California to Verdi, Nevada. We are here to visit with my kids and grandkids for a month. This is Gold Ranch RV Park, the park we prefer. The last time I stayed in the Reno area I did a search for a park less expensive but found they all want too much (IMHO). This park has large sites and we are looking at the mountains, not other RVs. Click the photo for a larger view. Wednesday, September 19, 2018: A travel day from Brookings, Oregon to Old Station, California. I had planned a National Forest spot for free, but that meant driving on 1/4 mile of dirt road. We decided paying $8 for a campground spot on asphalt was a better choice. Still no hookups of any kind and pretty close to the road but no dusty vehicles. On the right of this photo is Hat Creek, flowing with a lot of speed and water. I figure there must be a reservoir upstream letting out water. Tuesday, September 18, 2018: If you have been reading my Webpage for a while, you know I am a fan of Les Schwab Tire Company. Today I had the Brookings Les Schwab install a battery in the Forester. It is my opinion that no company has better customer service than Les Schwab, however, today was a disappointment. 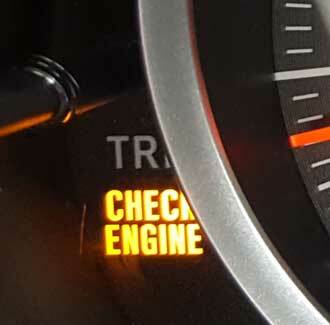 When the car was returned I found the "Check Engine" light on and the cruise icon flashing. I walked back into the store and talked with someone other than the installer. He told me "changing the battery has nothing to do with the Check Engine light" he further suggested that "I could drive down the street to an auto parts dealer where they would diagnose my engine problem for free". So I DID that. The auto parts equipment would not read the Subaru codes. I then checked YouTube for solutions and watched then tried their solutions, none worked. One of the videos I watched was from the Puyallup, Washington Subaru dealer who suggested to "call the dealer to learn a solution". So that's what I did next, called my dealer in Eugene, Oregon (not expecting any help). To my surprise, a service technician helped me immediately. I was told, if I did it myself or if Les Schwab did it, then it was a blown 7.5 amp fuse. He waited on the phone while I checked the fuses. YES! 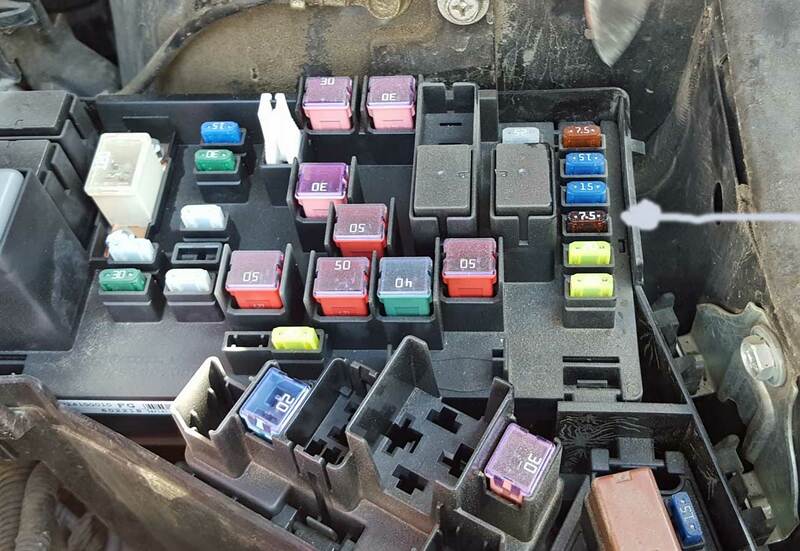 A 7.5 amp fuse WAS blown and replacing it (I had one on hand) put the car back to normal. I made a short video of this experience. Perhaps the Subaru dealer has the BEST customer service! Contrary to the Les Schwab clerk, changing the battery had EVERYTHING to do with the "Check Engine" light. Click the left photo for a view of the fuse box. After the battery replacement and subsequent repair we walked the McVay Beach. I like this beach because it is of weathered rocks rather than sand. Gwen and Lesa like looking into all the tide pools for sea creatures. Click the beach photo for a panorama of the beach. 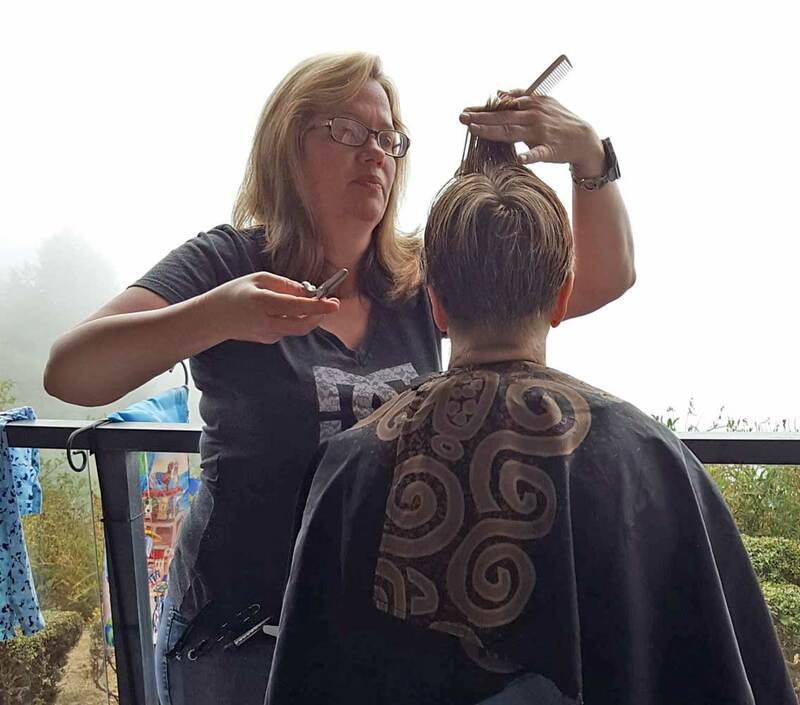 Monday, September 17, 2018: Gwen's daughter, Lesa, was a professional hair stylist in a past life so she started the day by giving her brother, Dave a haircut. Next, she gave her mother a haircut, the finally, I got a haircut. Both Dave and Brook had to work today so the haircuts were the most exciting part of the day. The rest of the day was laundry and a walk to Fred Meyer for a few groceries and new pajamas for me. Click the photo to enlarge. 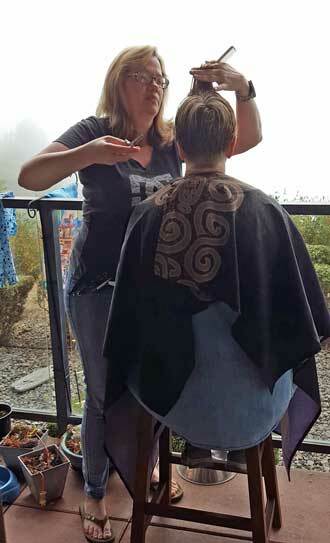 On a clear day, Gwen would be looking at the Pacific Ocean from Dave and Brook's deck but today the view was of fog. Sunday, September 16, 2018: Gwen, Dave, Lesa, Brook and I hiked the Whaleshead beach this morning with the dogs. 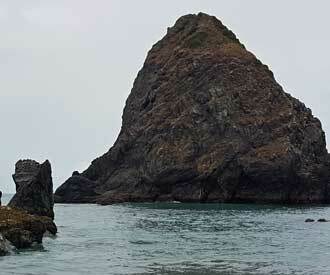 The rock above is suppose to be in the shape of a whales head, hence the name of the beach. Someone had a big imagination. Lesa has a dog plus Dave and Brook each have a dog so the three dogs really enjoyed the beach. 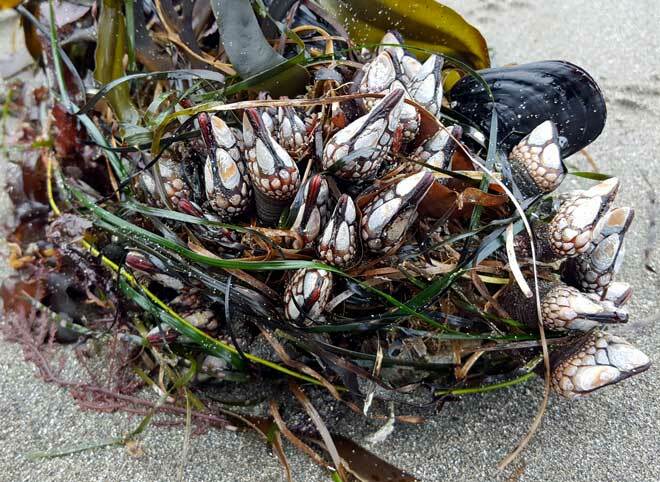 This was low tide so we got to see marine life we might not normally see. The whales are migrating to the south this time of year but they were too far in the distance for a good photograph. Click both photos for more views. Behind Whaleshead rock is a panorama so be sure to click on the panorama the enlarge. Saturday, September 15, 2018: Yes, we found the Oregon Redwoods, not the California Redwoods. Gwen's son, Dave, is on the left, then Gwen, Lesa, Gwen's daughter next to Brook, Dave's partner. Dave is an Oregon State Park Ranger so knows all the trails in the area. We did not know of Redwood trees in Oregon. After a four mile drive on dirt roads we found the three mile loop trail through some impressive trees. We especially liked the burl growth on this tree. 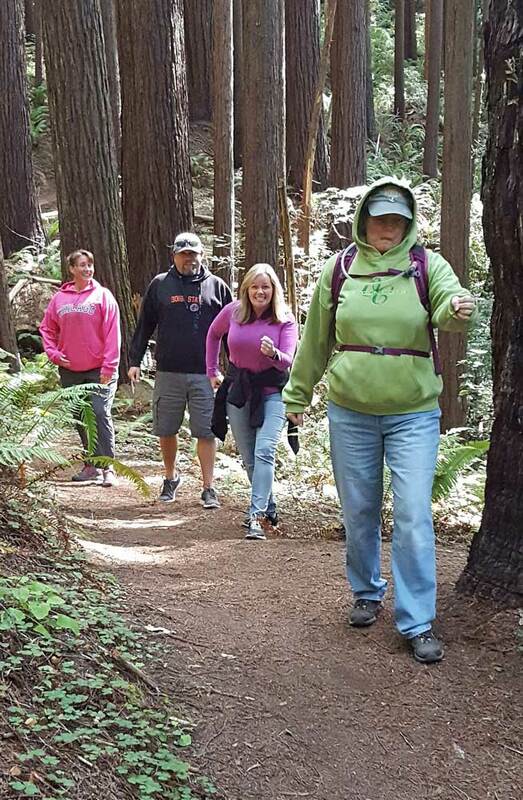 Weather was perfect for a hike in the Redwood trees. Dave pointed out all the plants he knew. Click the photo for an action photo of the hike. Friday, September 14, 2018: This is our first day of our winter adventure/2018-2019. We begin on the Oregon coast in Brookings, Oregon at the Elks Club RV parking. Gwen's son Dave lives in Brookings and her daughter, Lesa is here on vacation for a week. We will visit with both of them before moving further south. The Elks club maintains a nice RV parking area and only $20 per night for 30 amps of electricity, plenty for this time of year. This first day I have discovered we lost a vent pipe cover and I've also learned, Brookings does not have what I'm looking for to replace it so ordered from Amazon, delivery scheduled for Monday to Dave. Our new DISH network is working fine. However, the satellite radio has stopped working for some reason. Lesa and Gwen shopped for groceries then we all had Mexican for lunch. The kayaks are unloaded, covered and chained to the rear wheel to discourage theft. I helped Lesa with a construction project and with replacing a rear tail light.